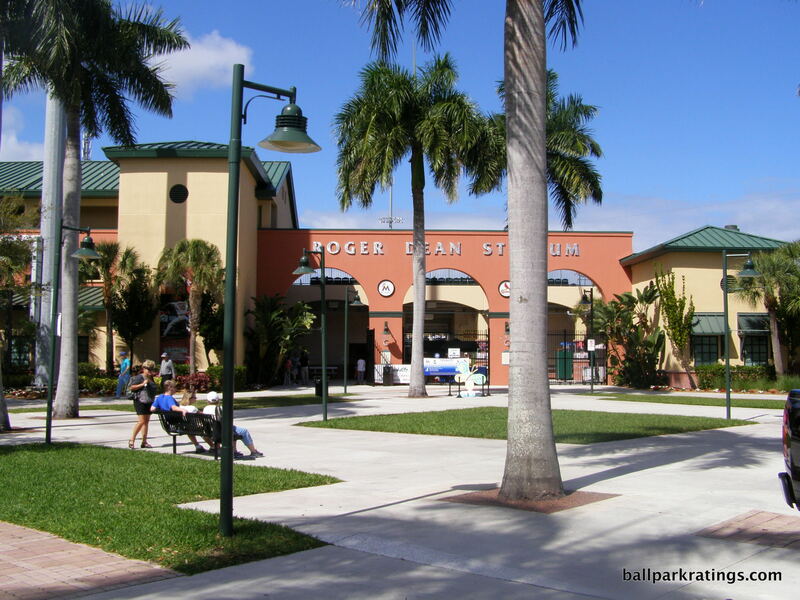 Seeing how a ballpark like Roger Dean Stadium ages will be key to understanding the longevity to some of these mid to late 1990s spring training parks. 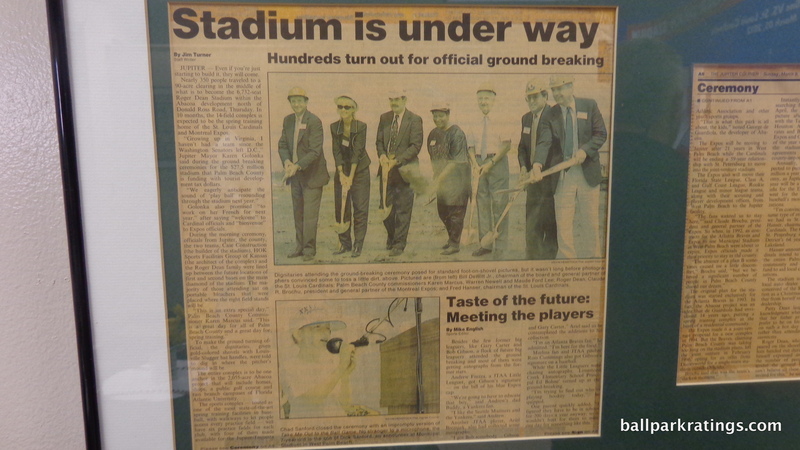 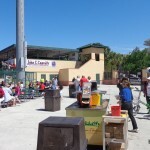 The concrete iceboxes in the late 1980s fell out of favor rather quickly, and were discarded for shiny new ballparks similar to the one here. 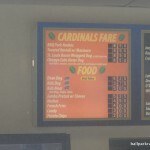 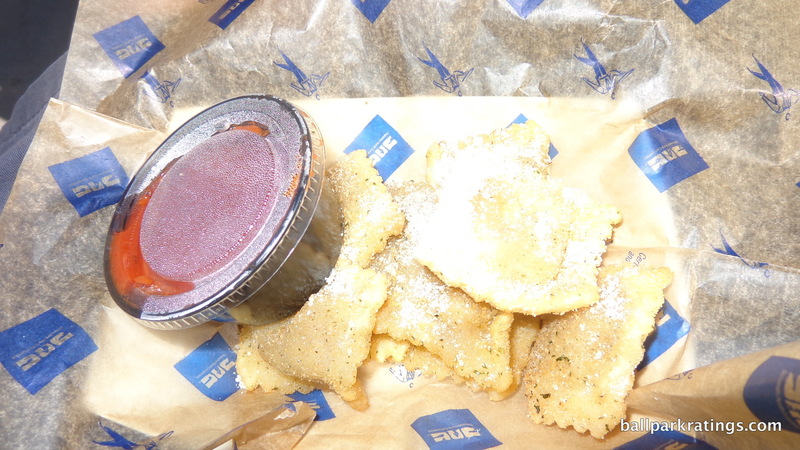 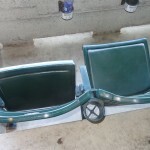 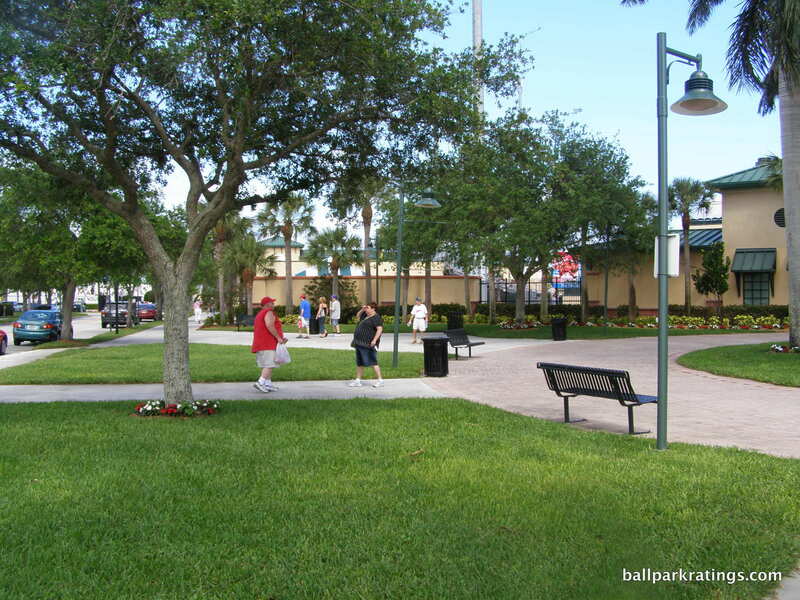 By 2009, we saw some parks up the ante even further, establishing an entire new standard, while the Cubs were already trying to leave their 1997 ballpark. 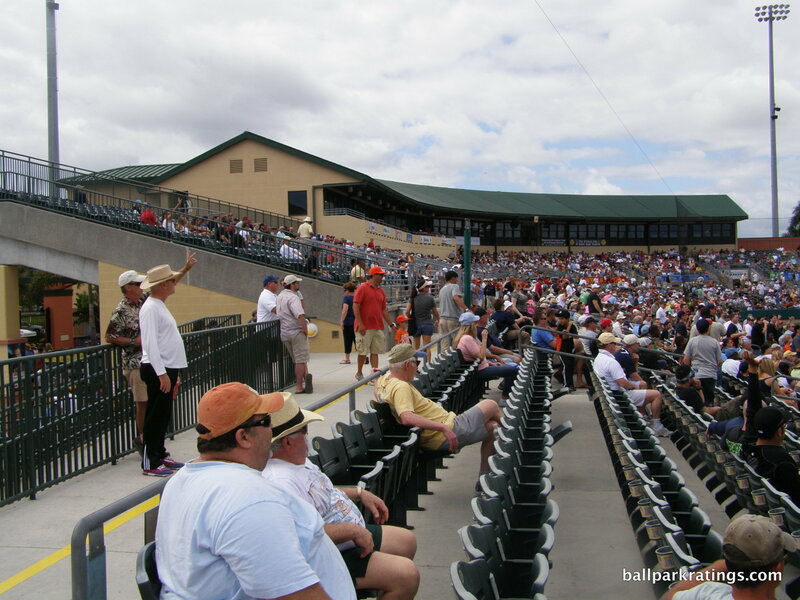 In 2011, I wrote correctly that the Cubs situation was an outlier (HoHokam really was the New Comiskey of spring training), but I wondered if the 1990s ballparks would indeed have a similar lifespan. 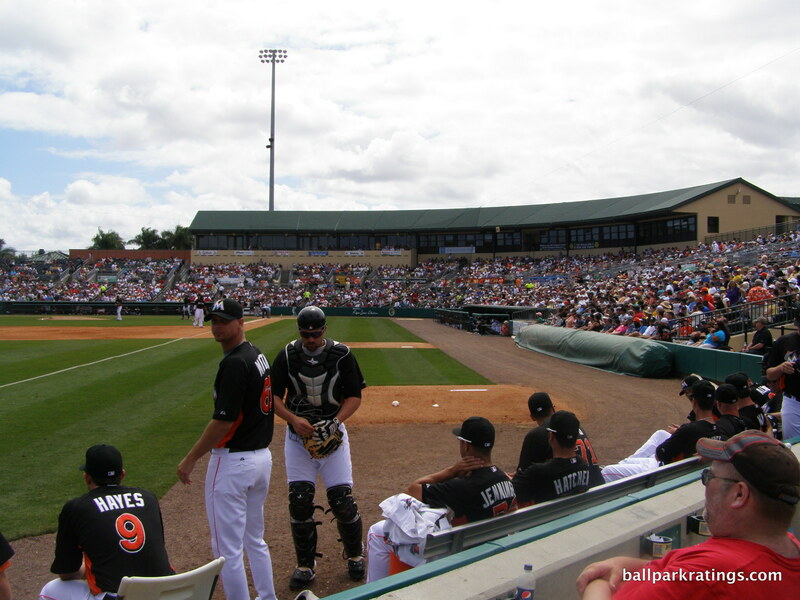 I think we have a good answer now looking at Jupiter’s park in 2017. 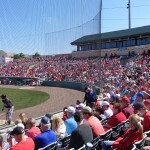 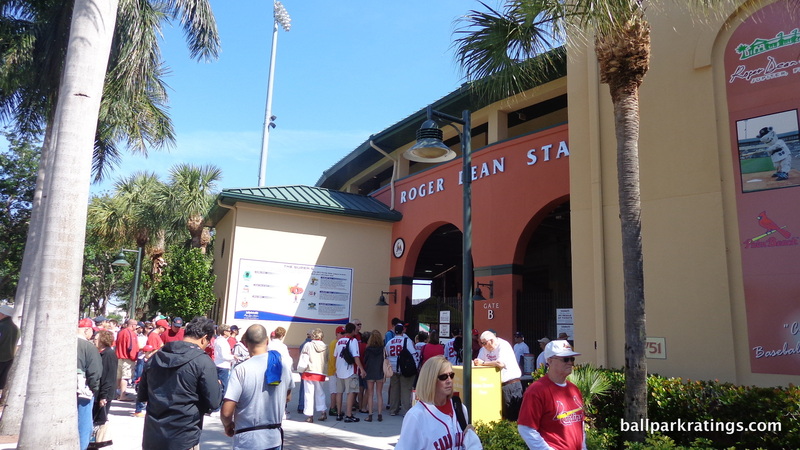 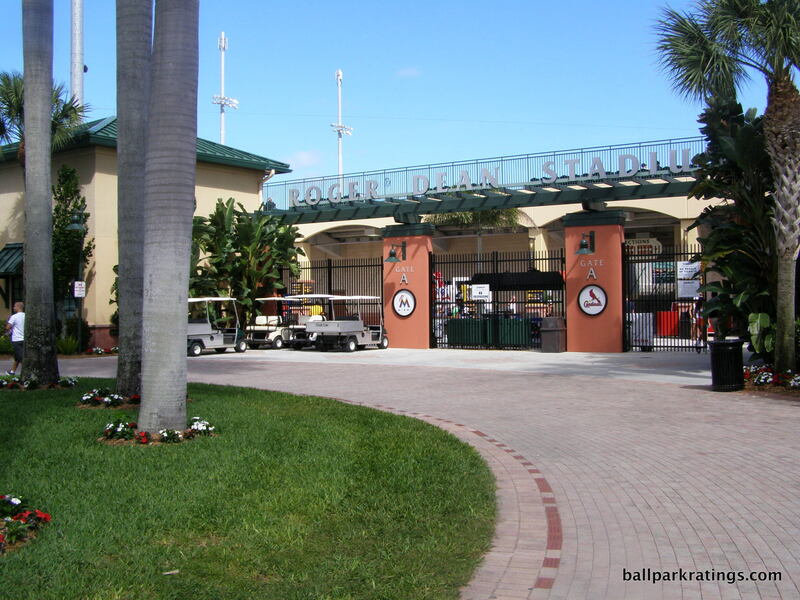 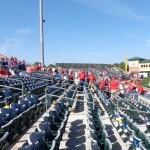 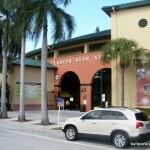 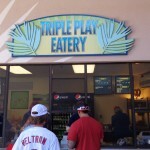 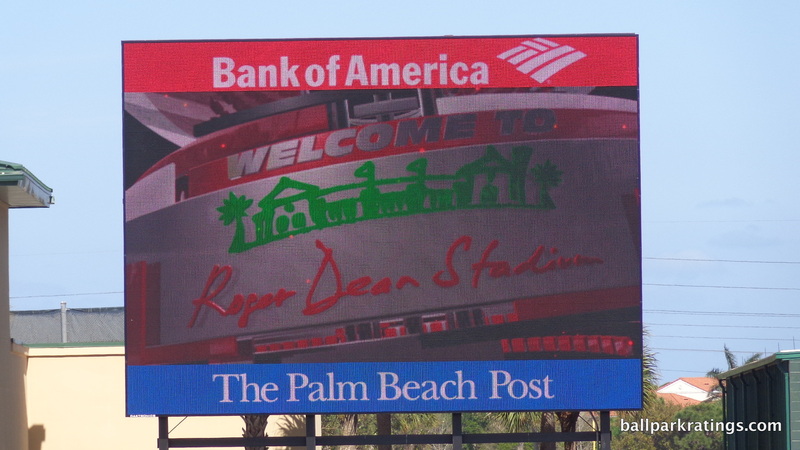 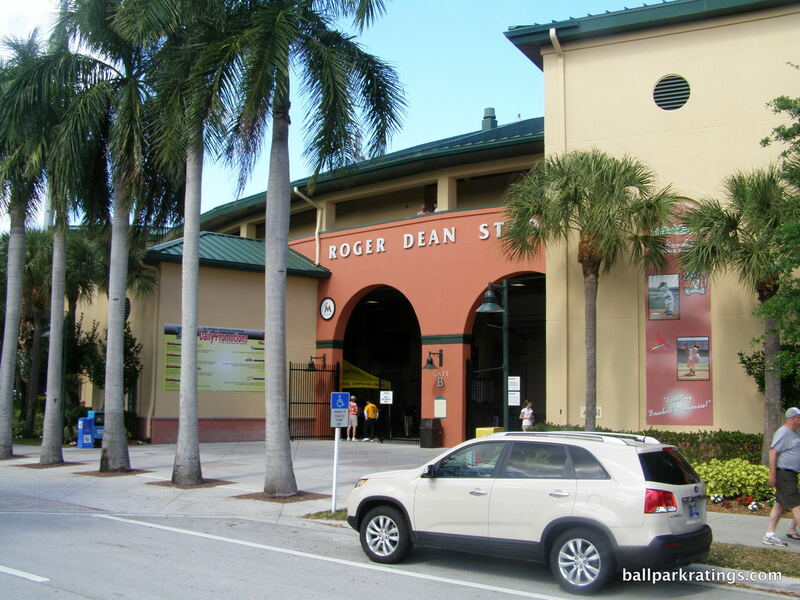 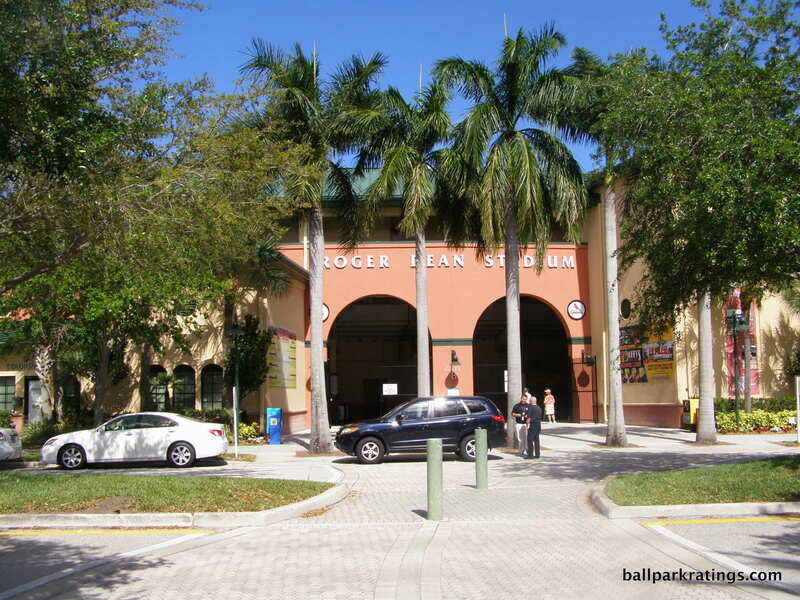 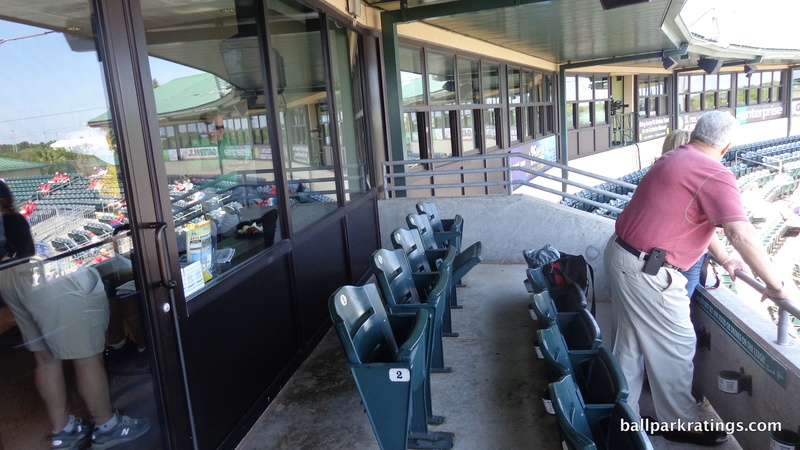 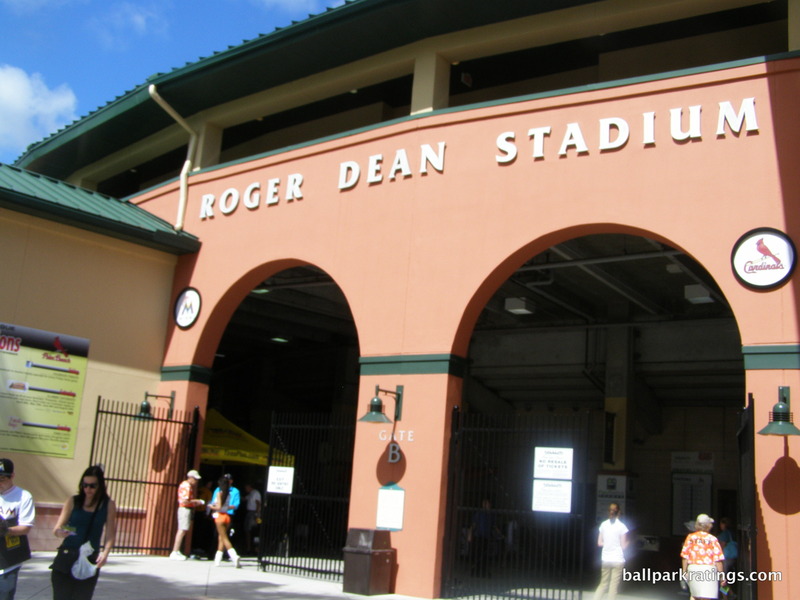 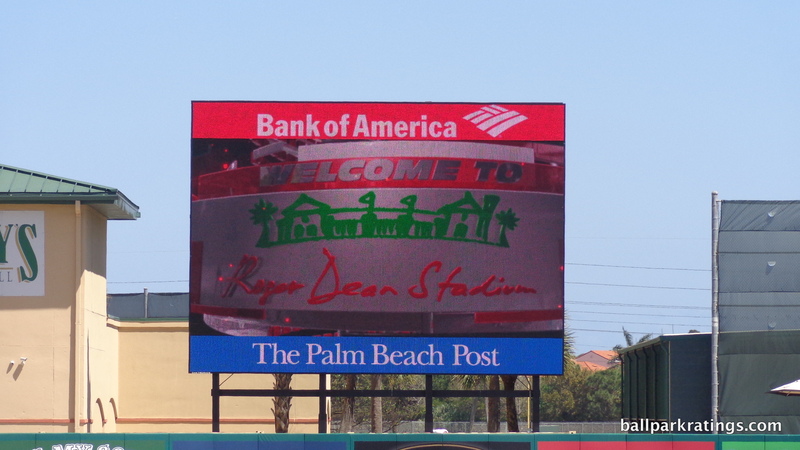 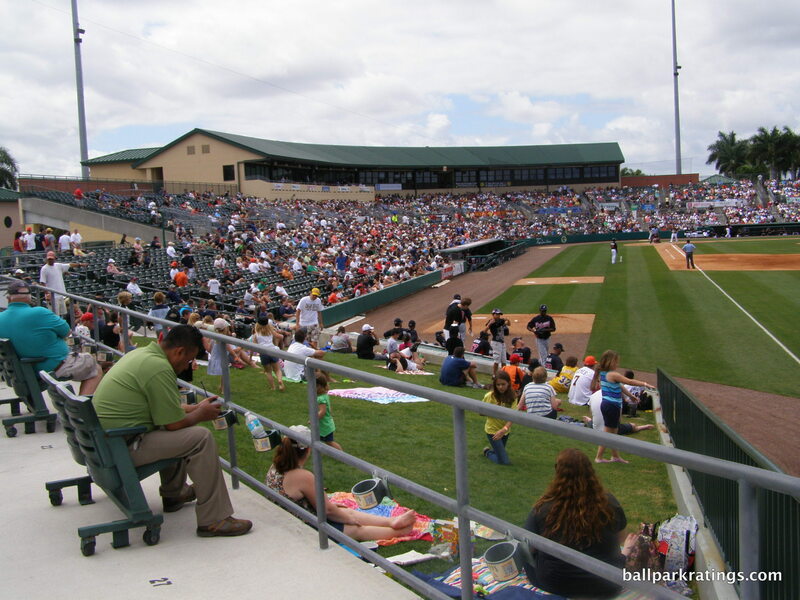 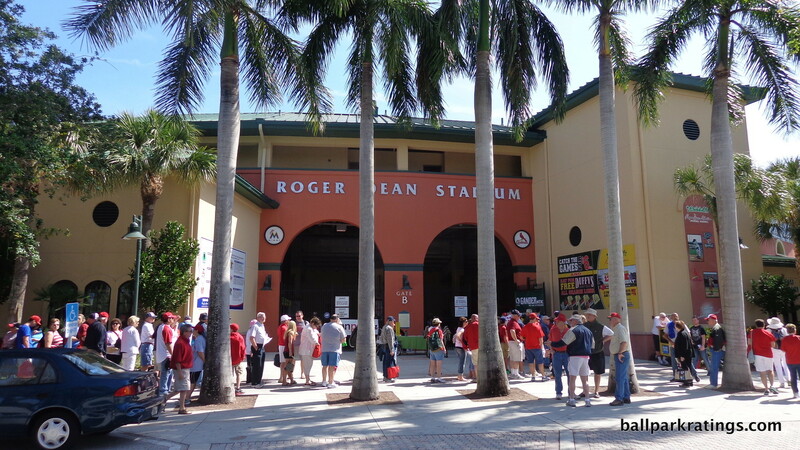 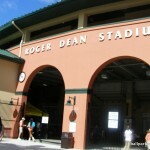 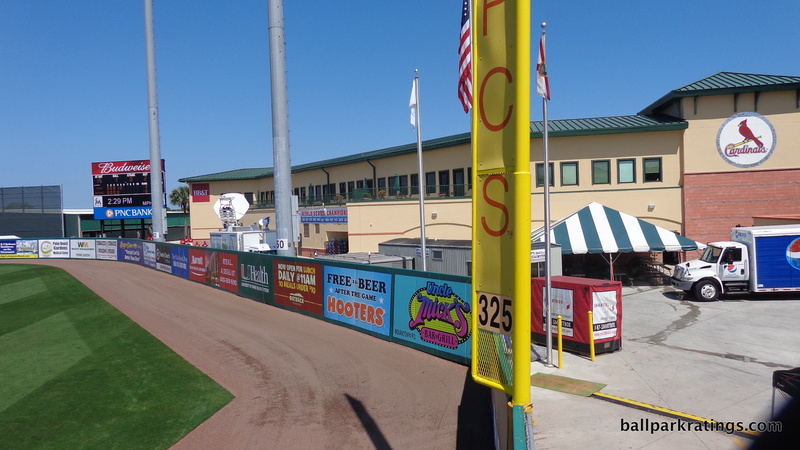 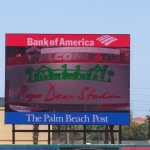 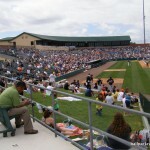 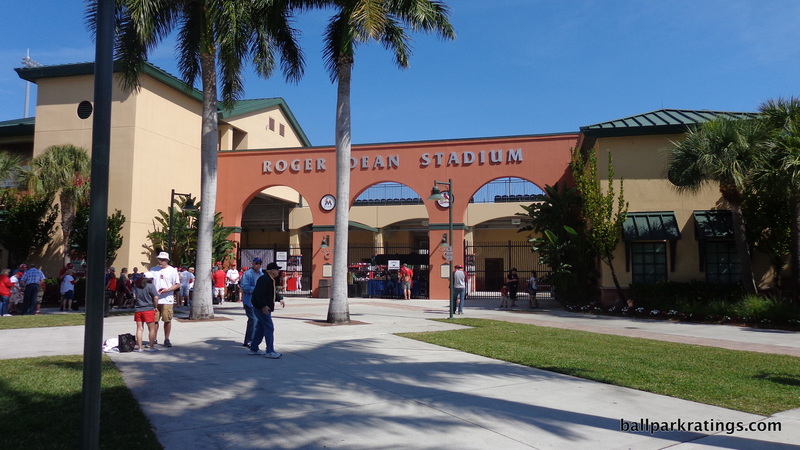 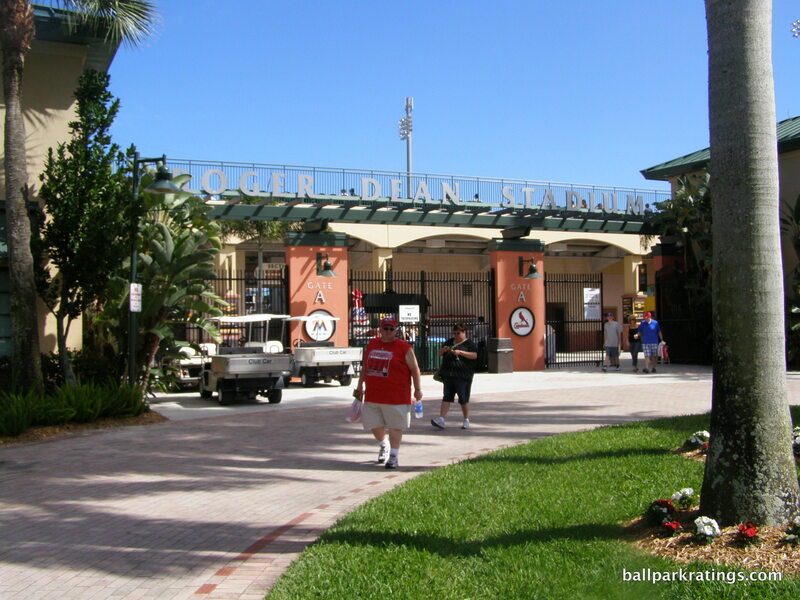 Roger Dean Stadium has some significance in the long lineage of spring training stadiums. 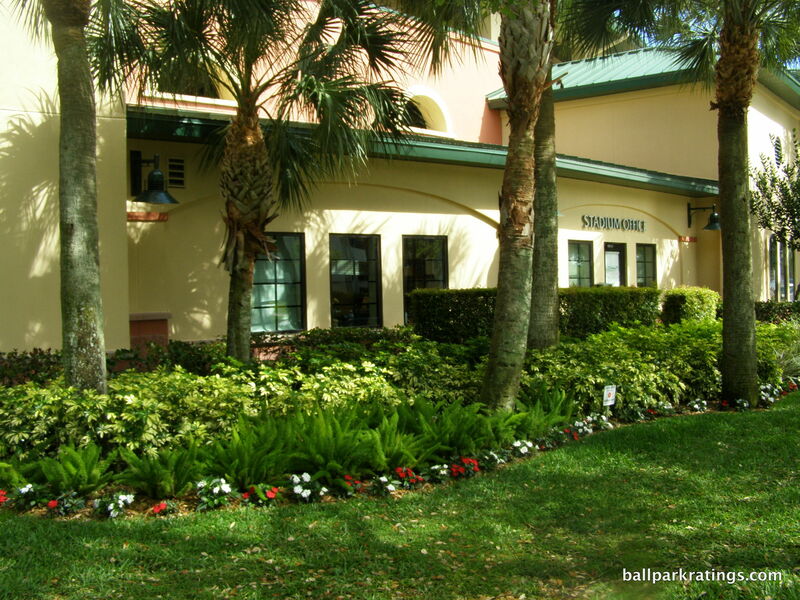 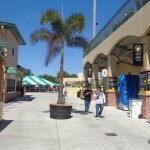 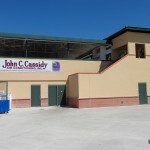 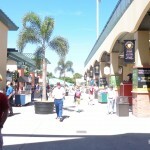 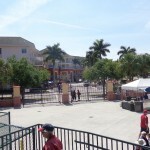 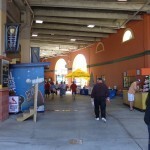 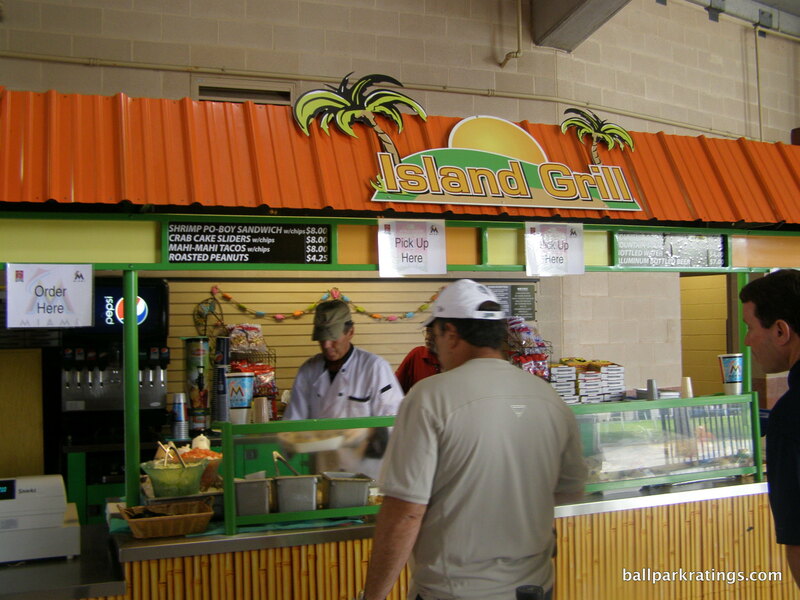 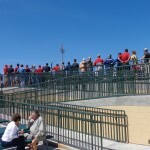 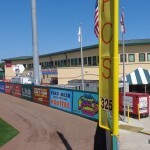 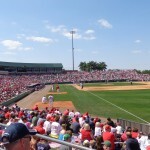 After the building phase of the late 80s, Hammond Stadium (1991) was the first to really emphasize the ballpark’s aesthetics in some fashion, with a grandiose Churchhill Downs-style exterior design. 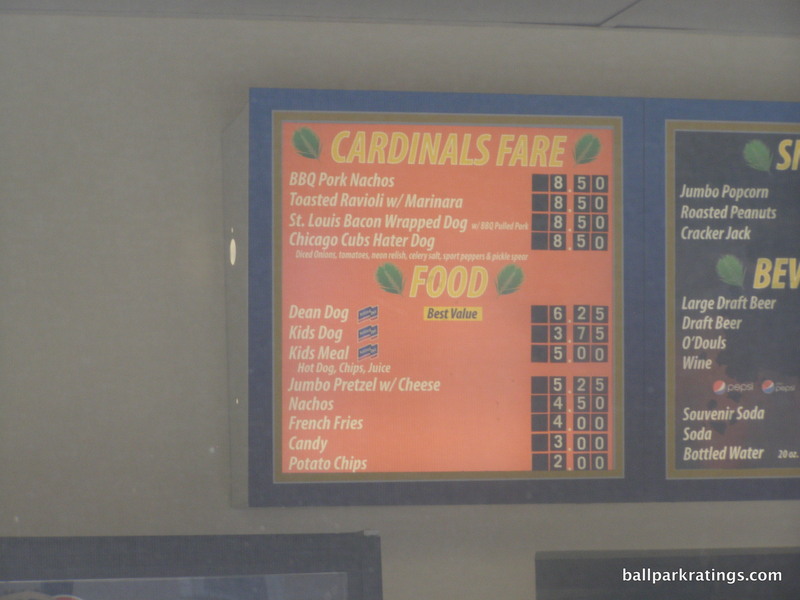 Most teams followed with ballparks of varying degrees of aesthetic vision after this during the 90s, whether through a rudimentary design motif, identifying aesthetic anchor, or some gimmick. 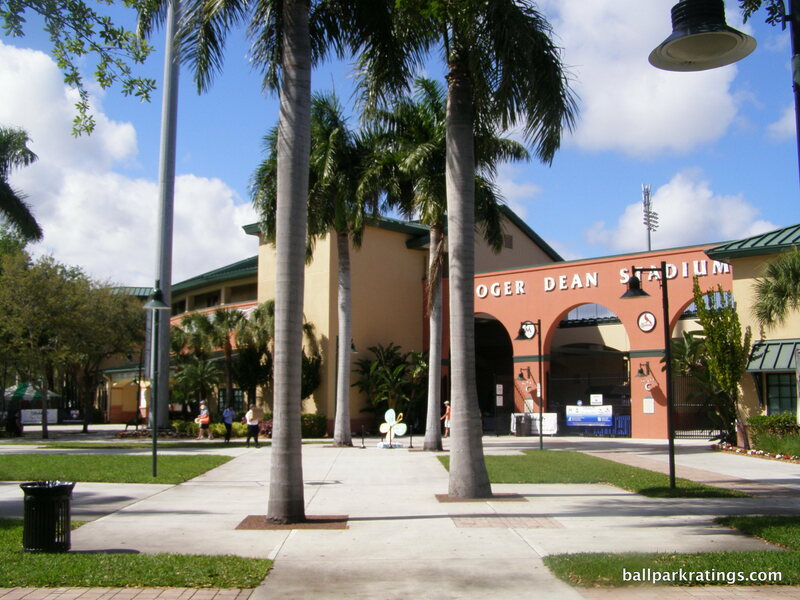 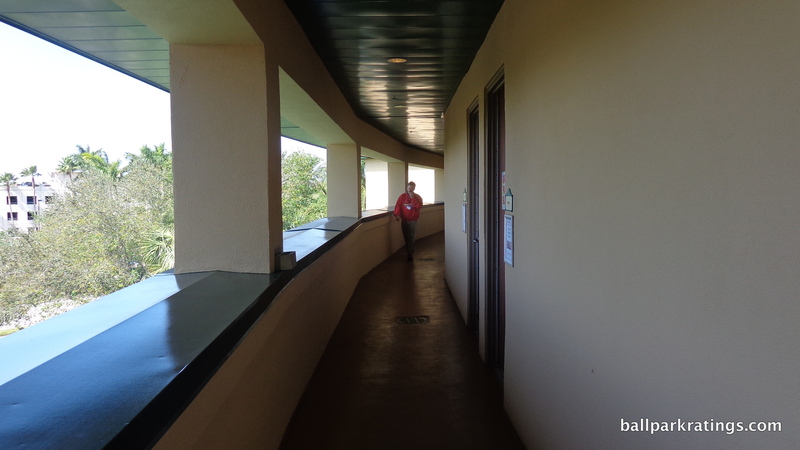 It doesn’t look all that impressive today, but Roger Dean Stadium was one of the first spring training parks with aesthetic attractiveness inside and out. 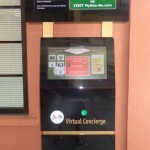 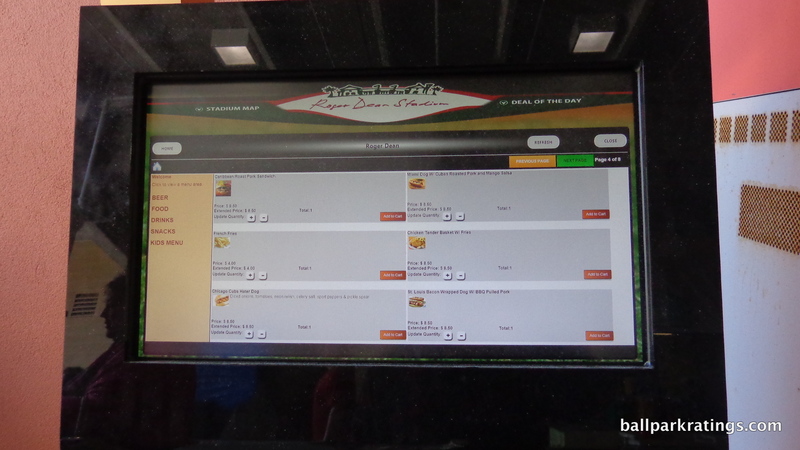 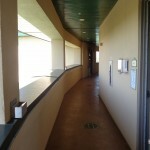 It is very emblematic of what was considered state-of-the-art. 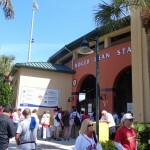 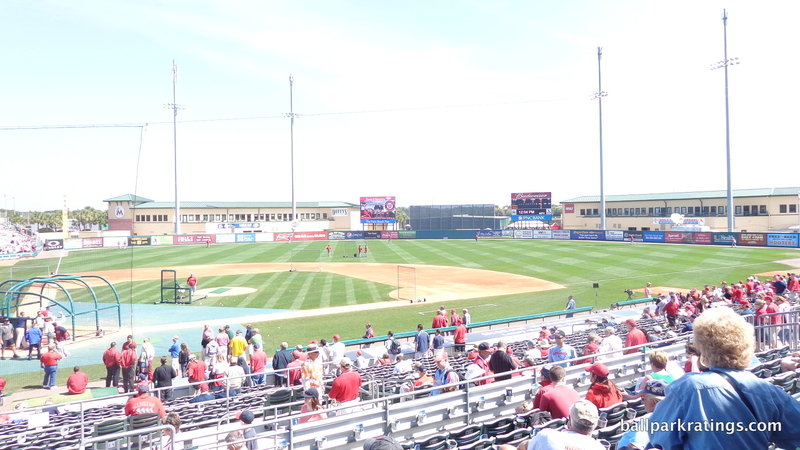 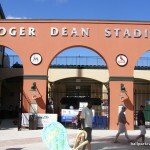 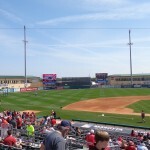 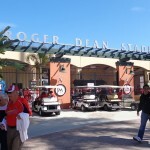 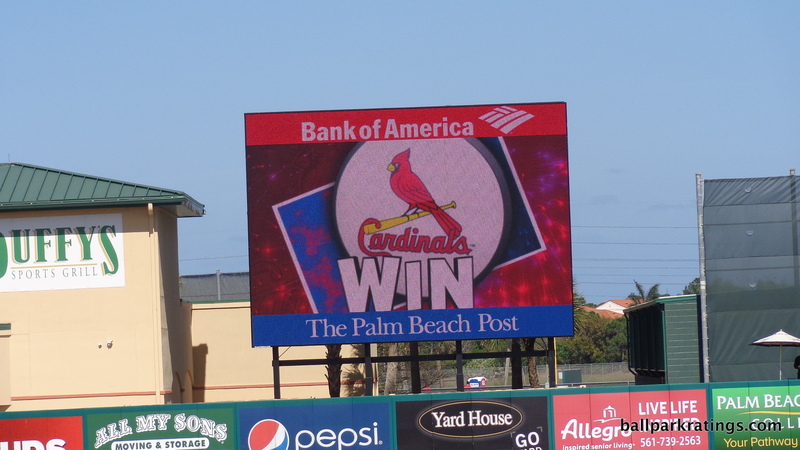 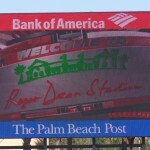 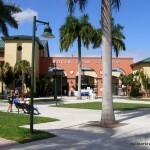 Today, if I only had one word to describe Roger Dean Stadium it would be pleasant. 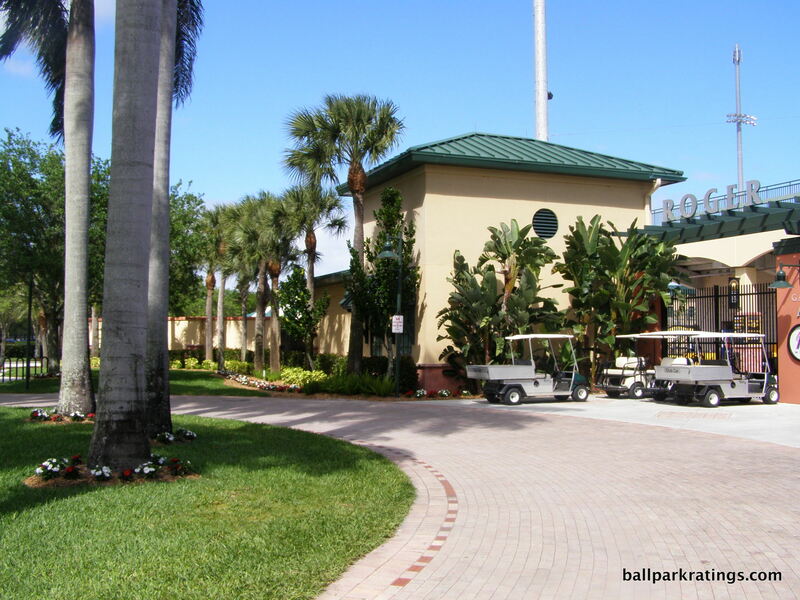 It’s a very simple structure, but the landscaped stucco exterior and the attractive beige clubhouse backdrop makes taking in a game here rather soothing, especially when sunlight hits the latter structures. 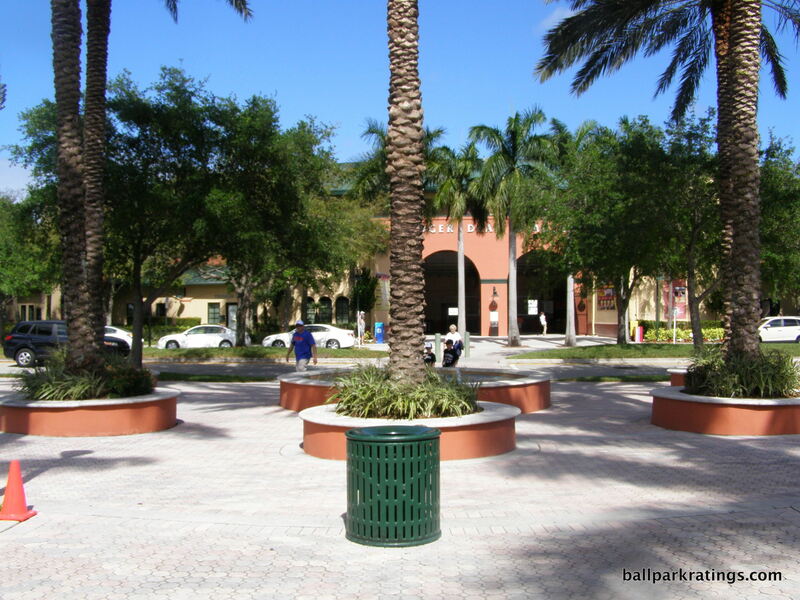 It doesn’t remotely attempt to rival the grandiose experience of the newer parks in Arizona, or the renovated ones in Florida, but the essential aesthetic is well executed, despite the comparative lack of ambition. 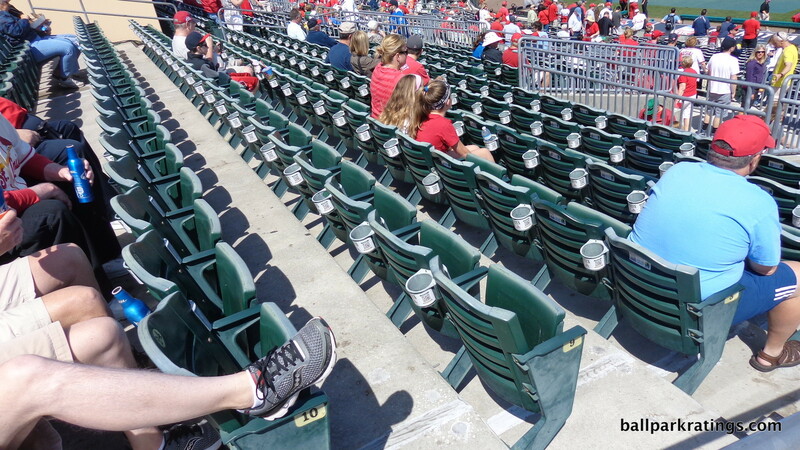 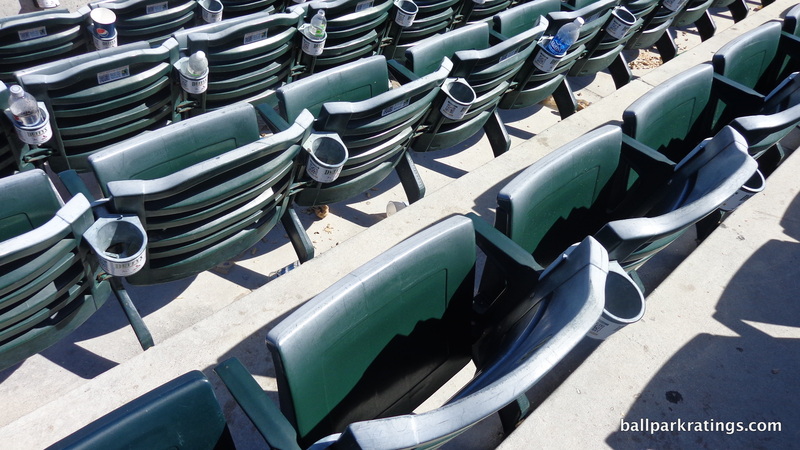 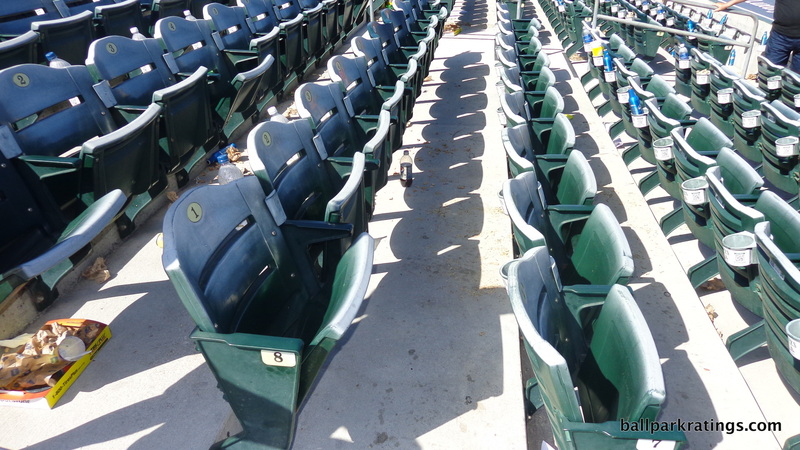 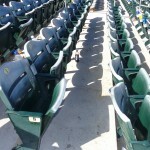 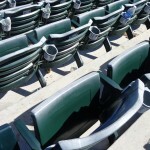 In terms of amenities, and the ballpark’s capacity as a space, there isn’t much going on. 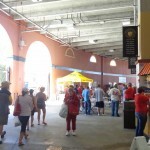 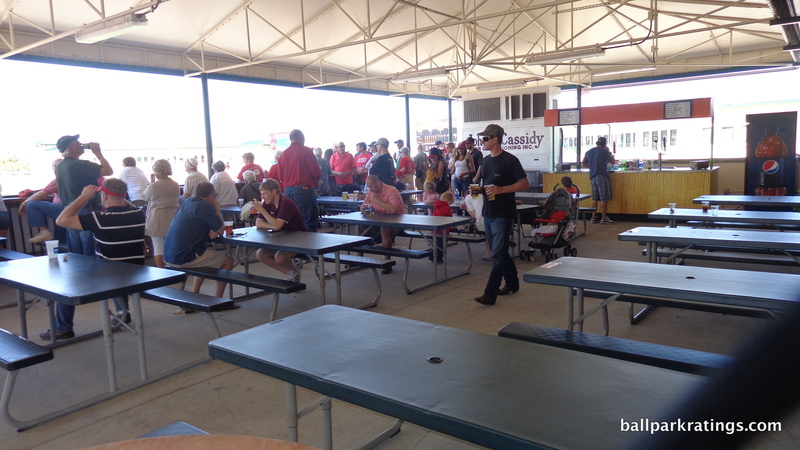 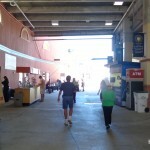 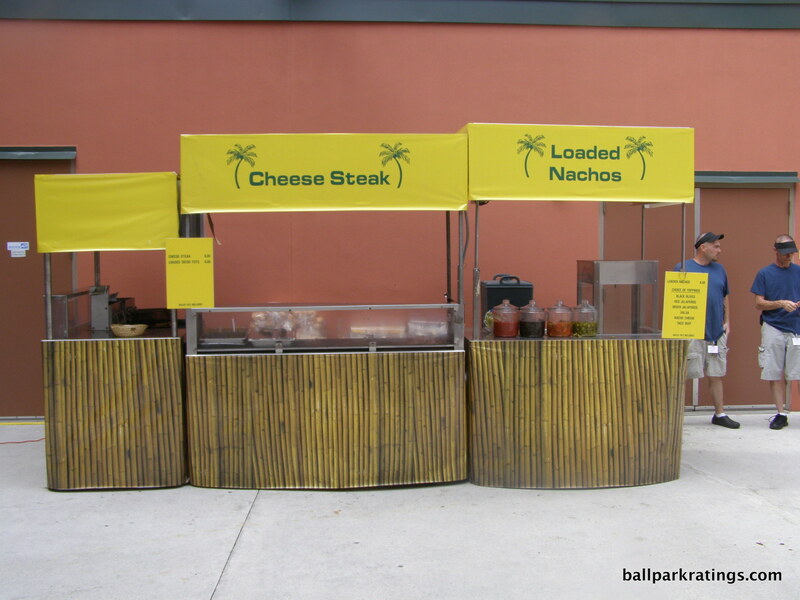 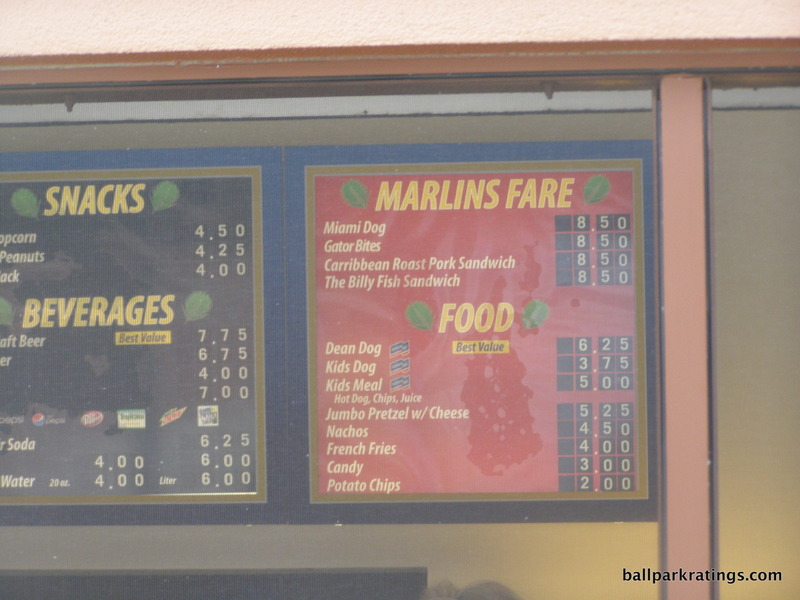 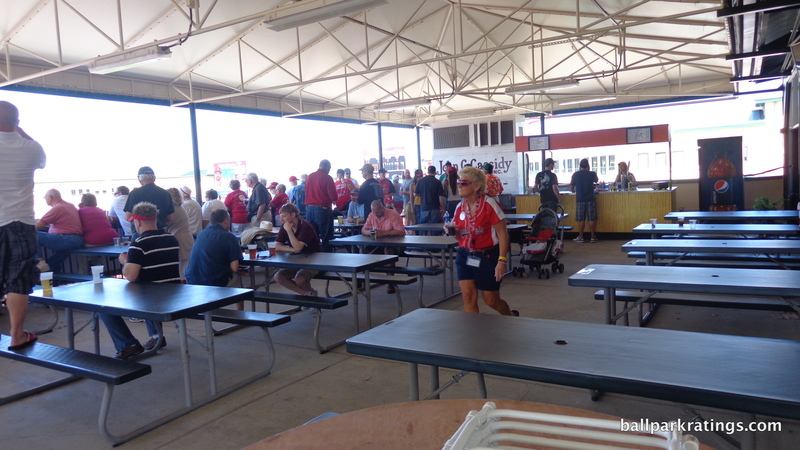 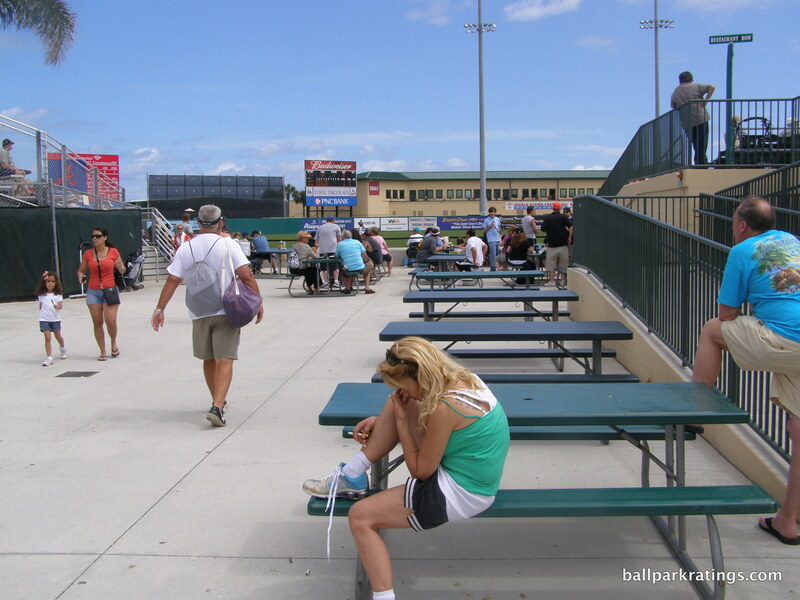 If there were one hallmark of the new and updated parks that followed in the new century, it would be “walkability”, with an emphasis on destination bars and concession areas throughout the main and outfield concourse. 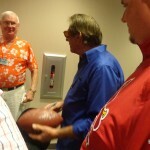 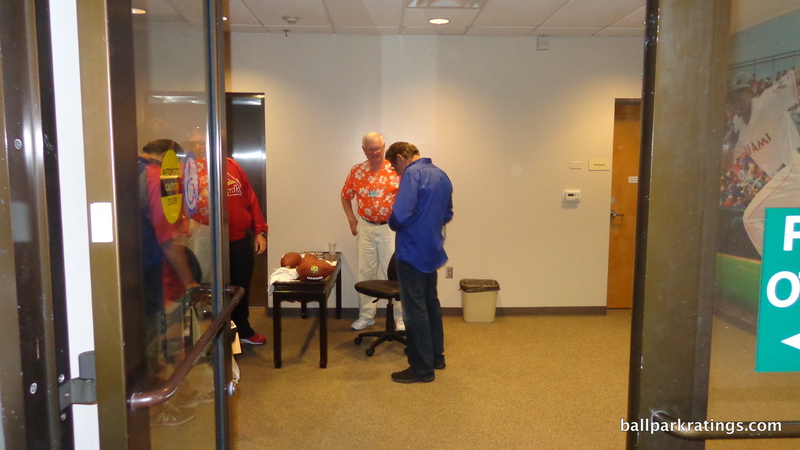 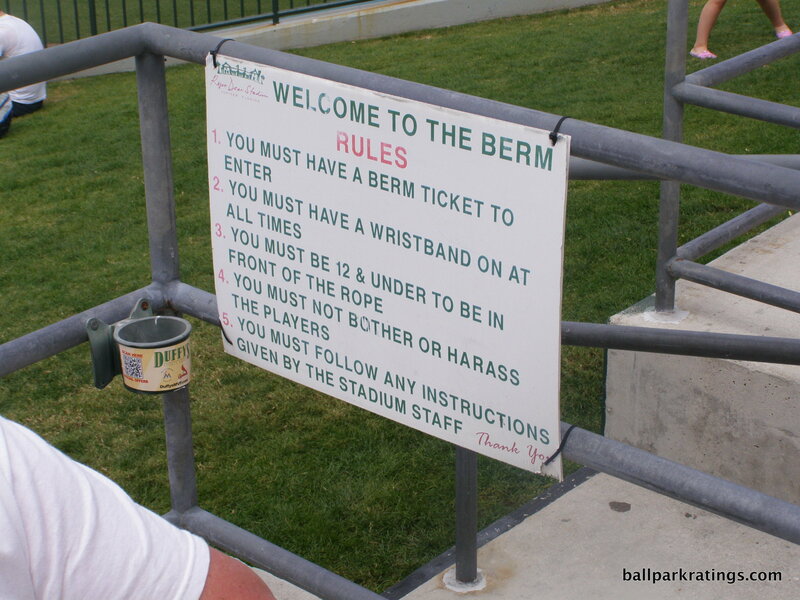 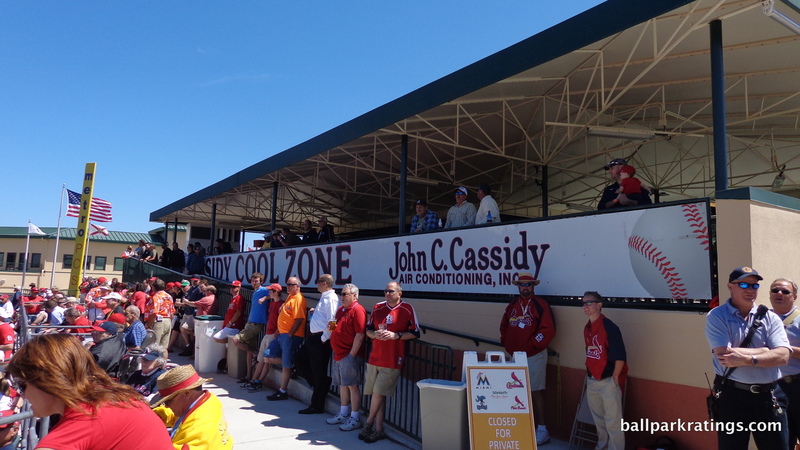 We don’t see any of that at Roger Dean Stadium, which is a testament to the time period. 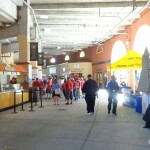 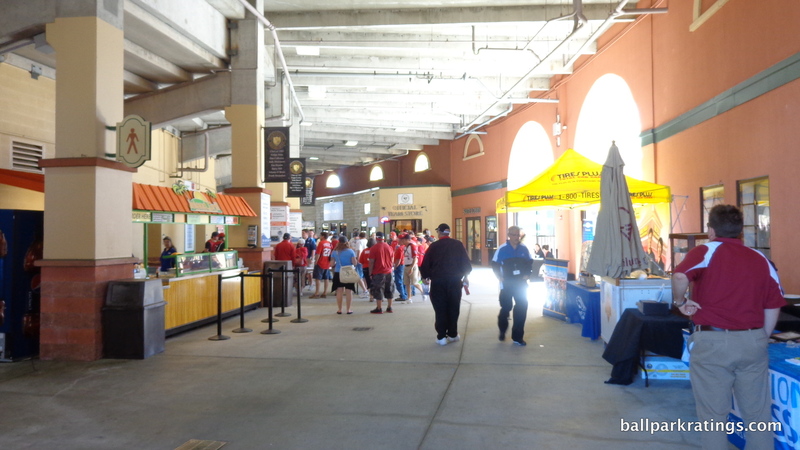 The main concourse is closed from the field, and only extends around the infield. 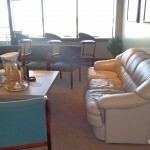 There are no bars or other areas to hang out. 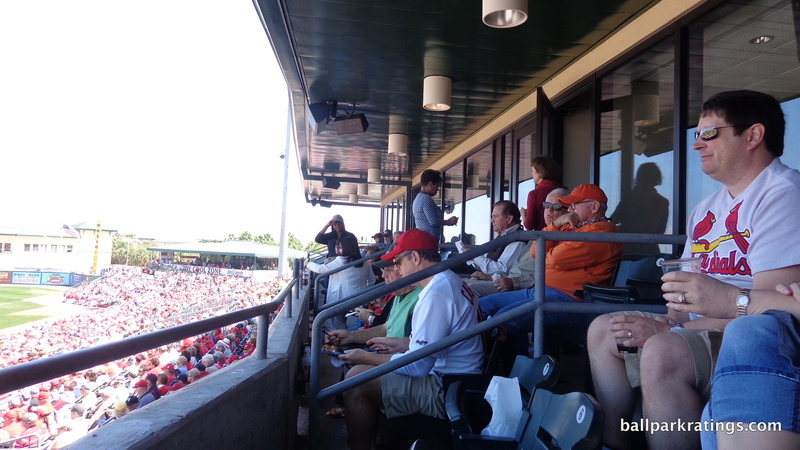 You’re here to watch the game. 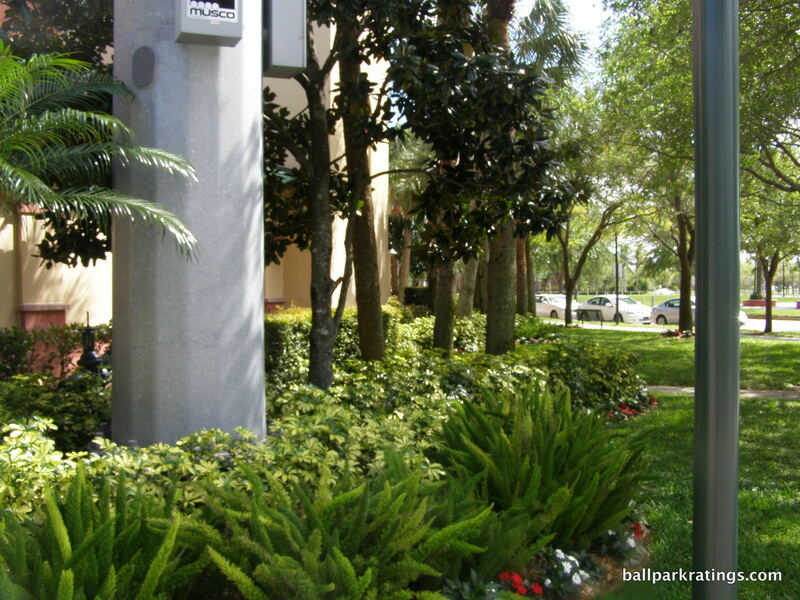 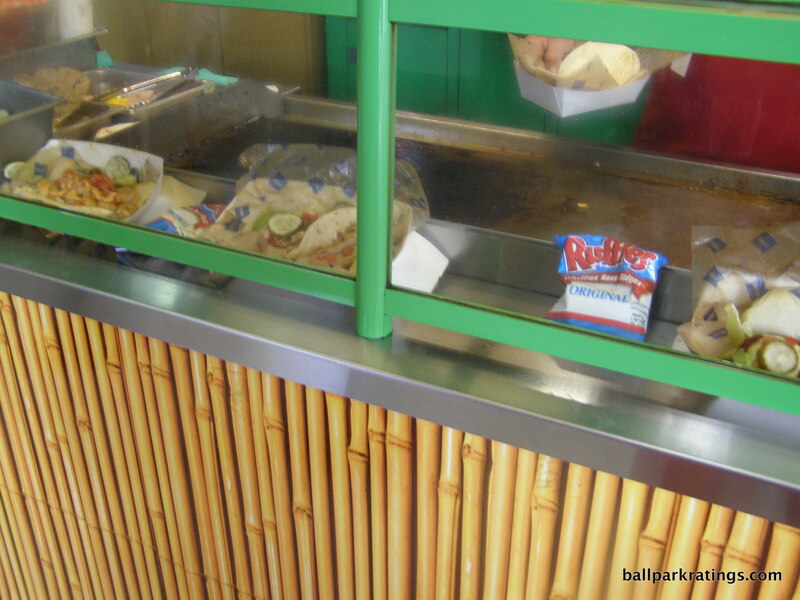 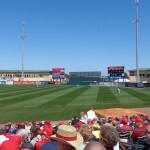 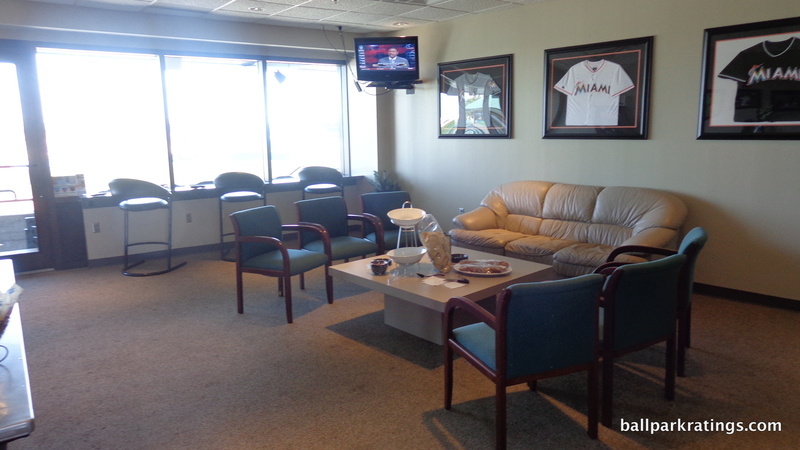 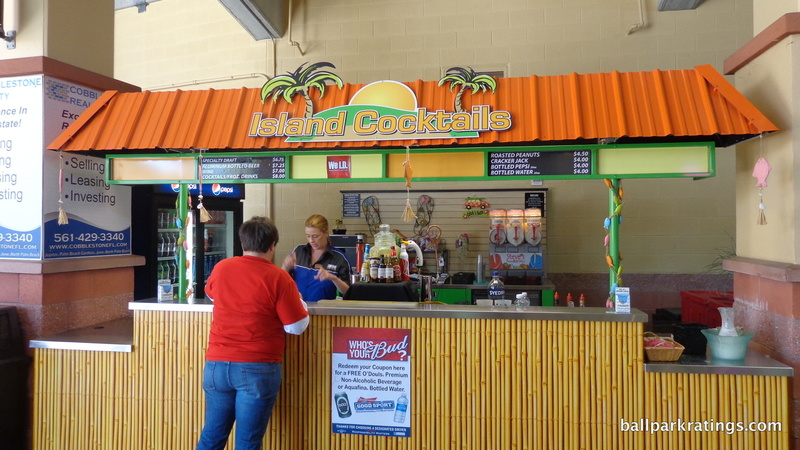 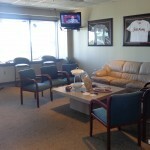 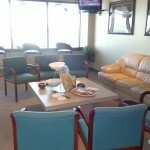 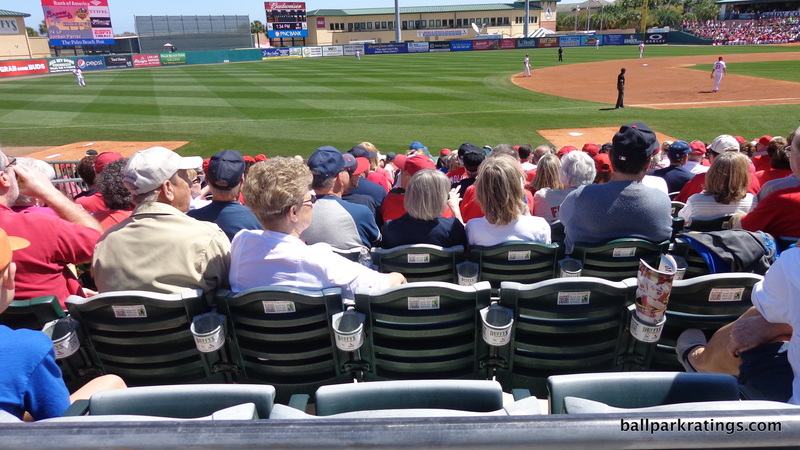 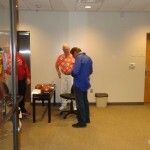 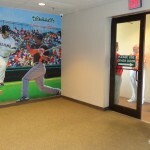 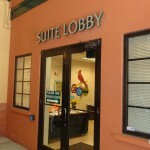 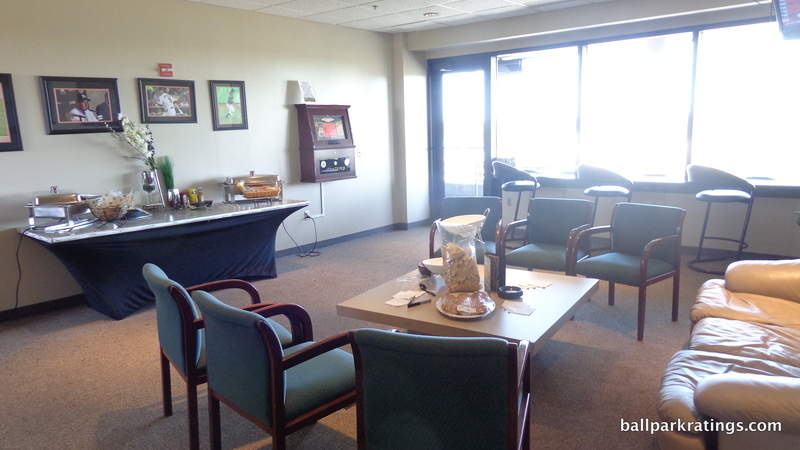 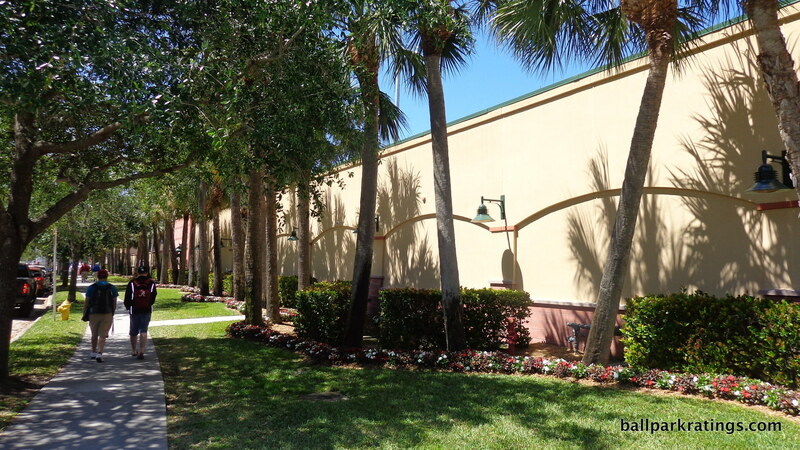 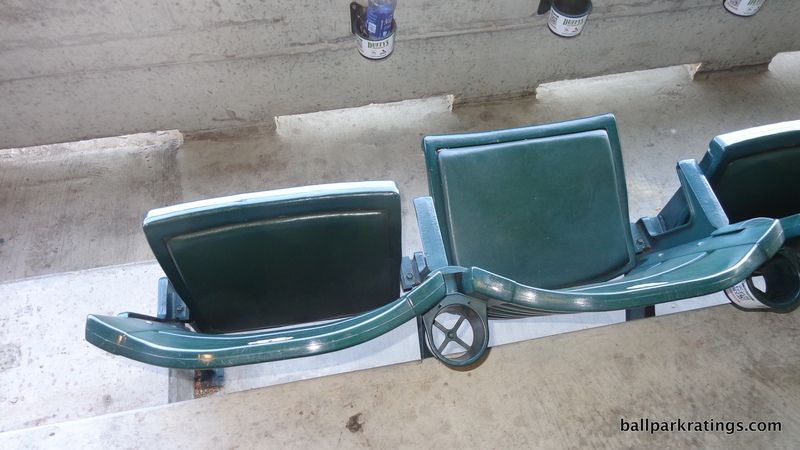 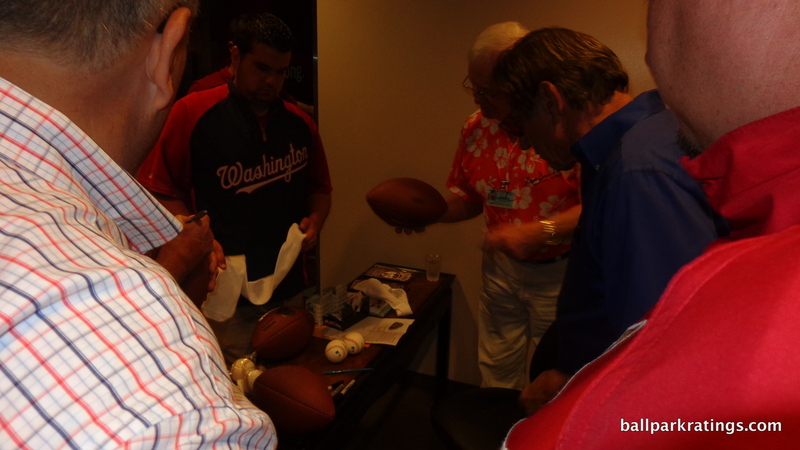 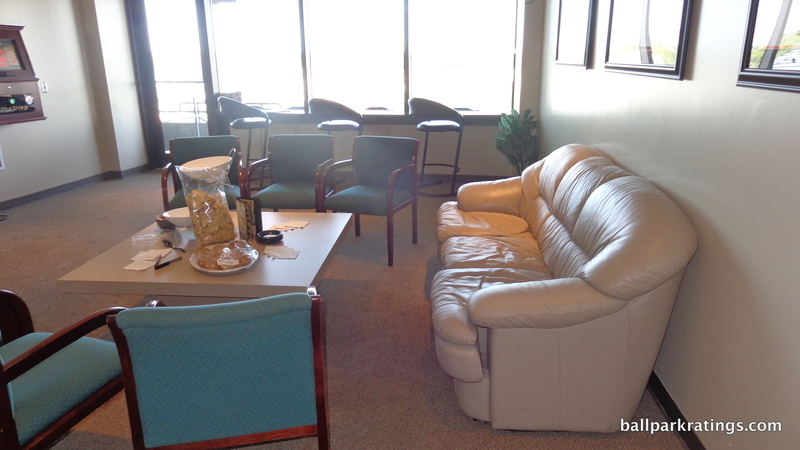 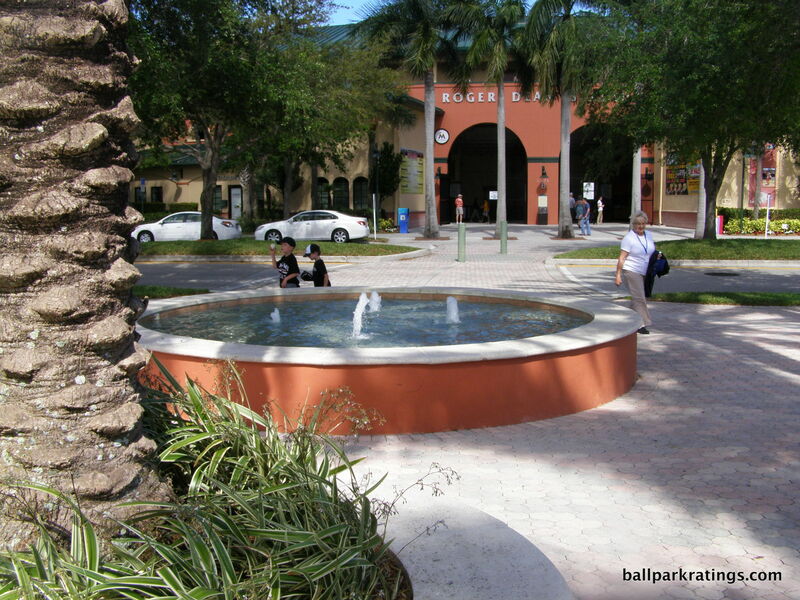 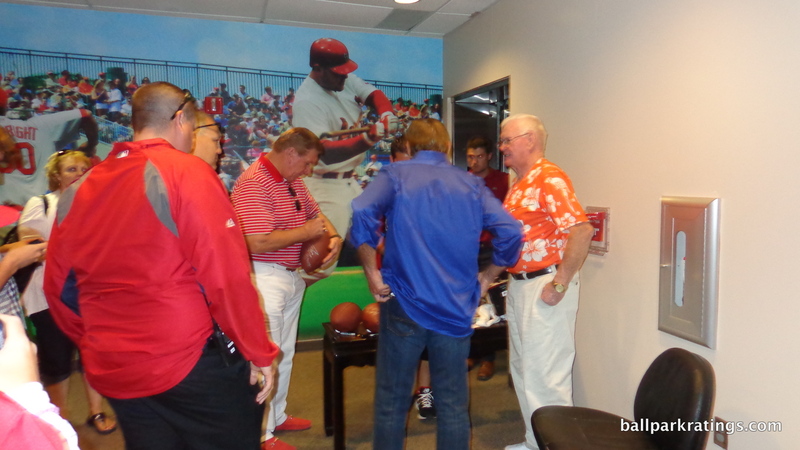 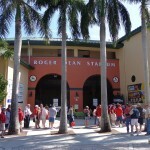 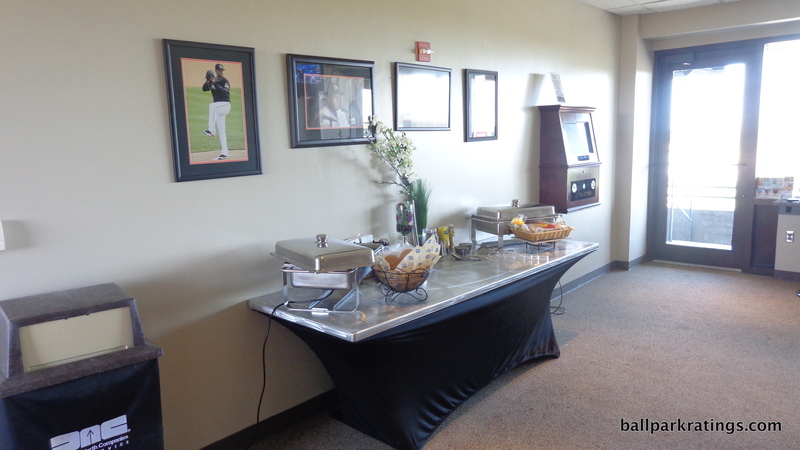 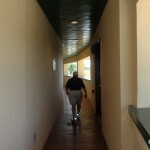 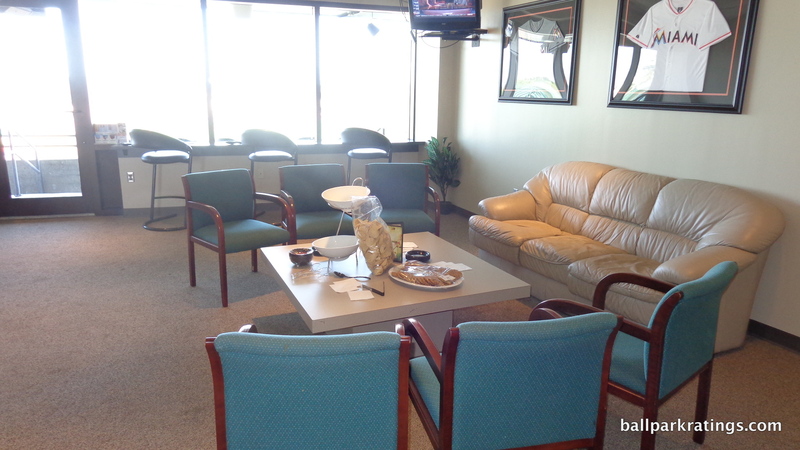 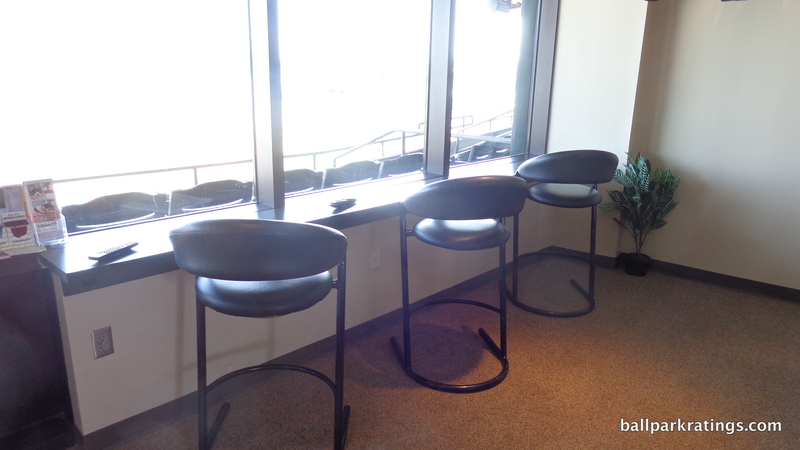 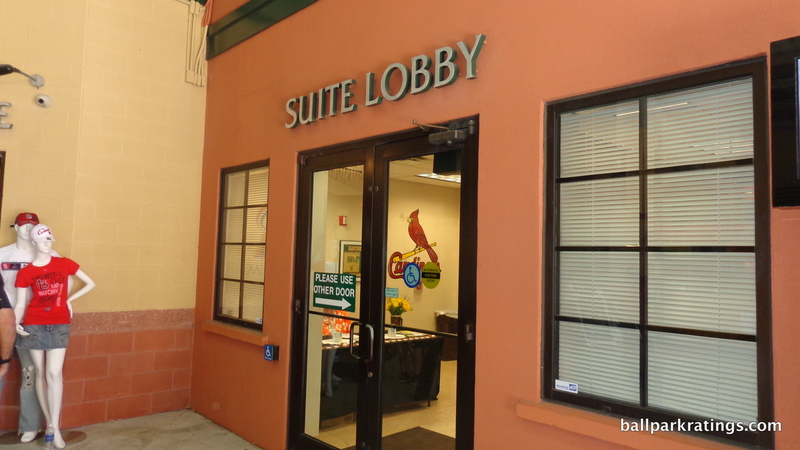 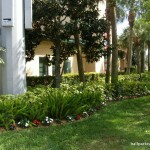 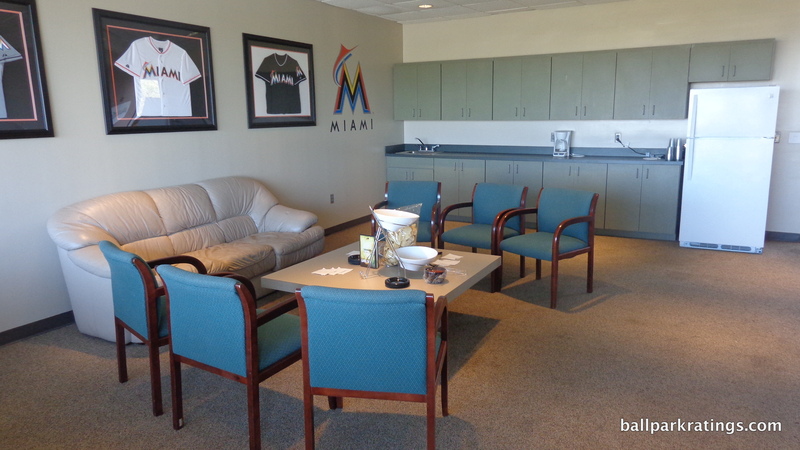 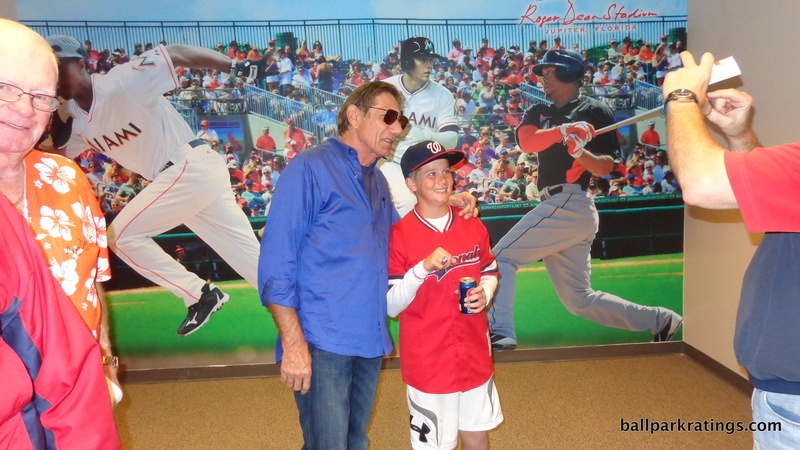 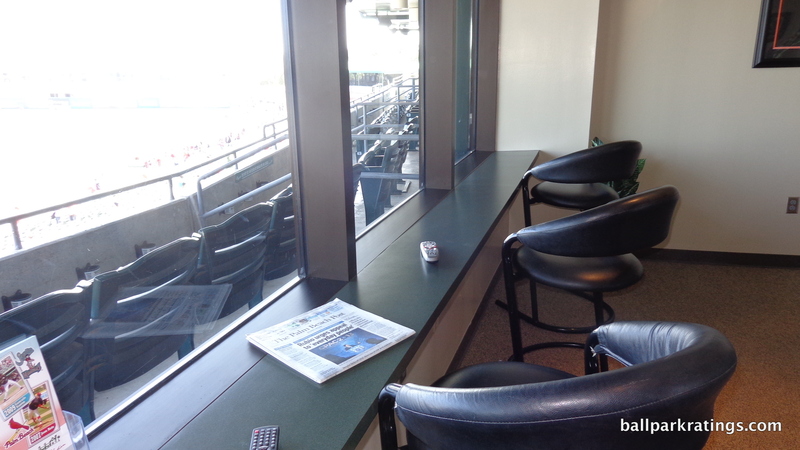 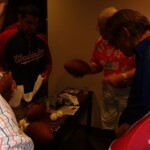 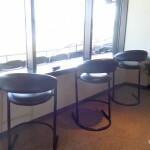 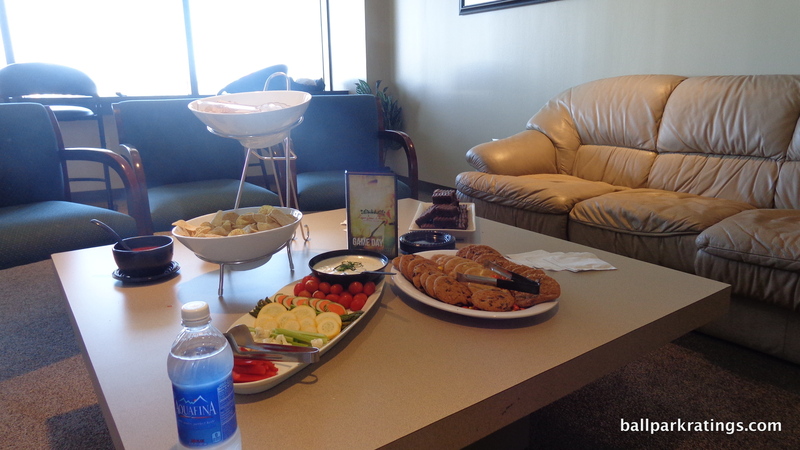 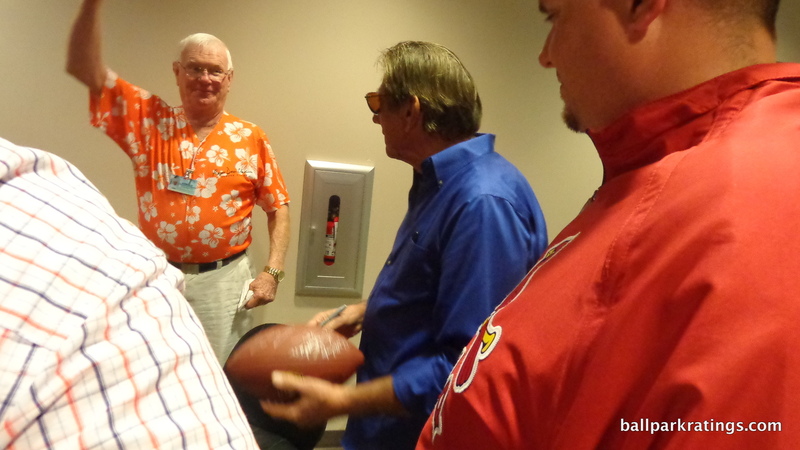 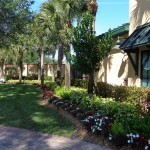 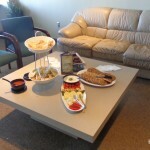 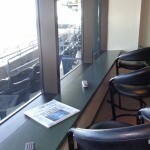 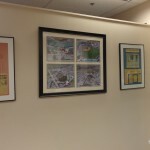 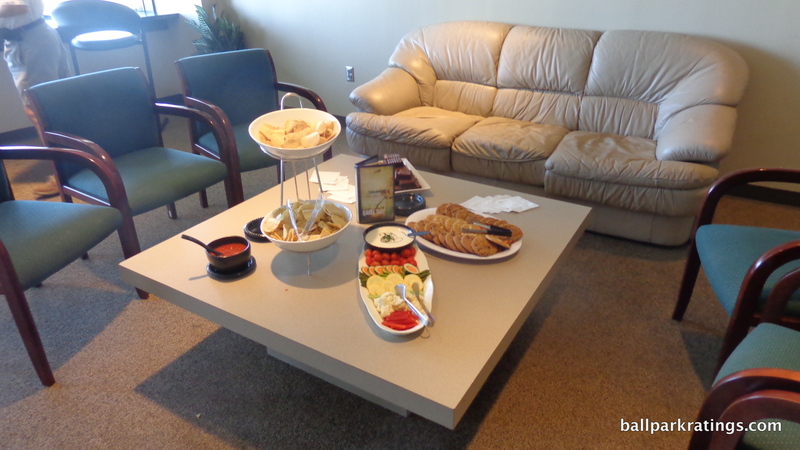 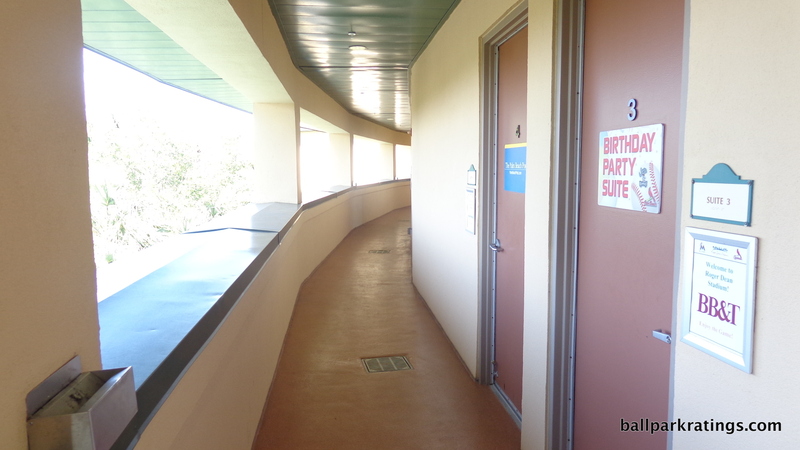 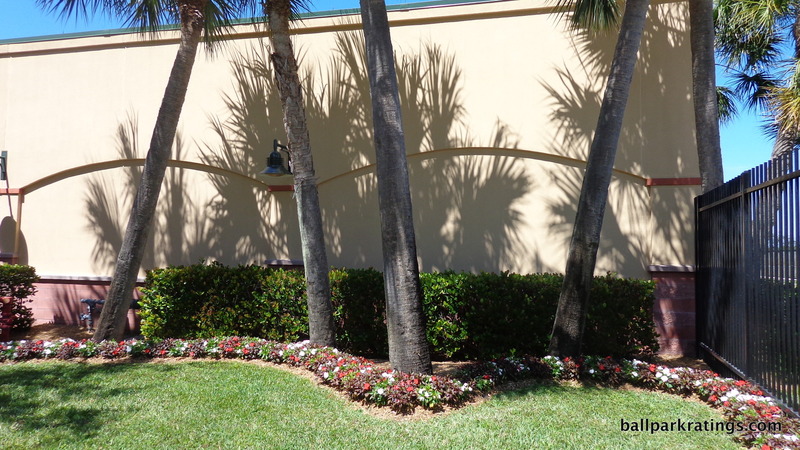 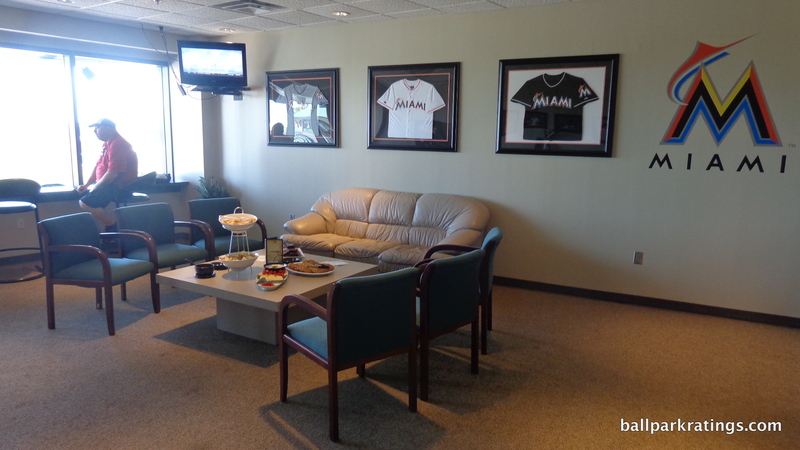 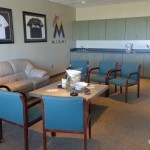 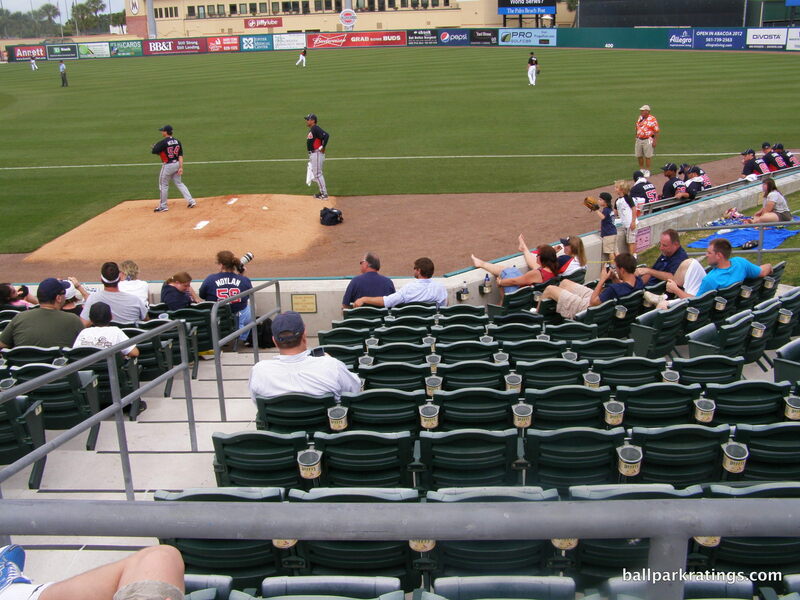 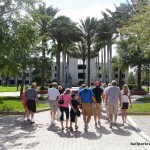 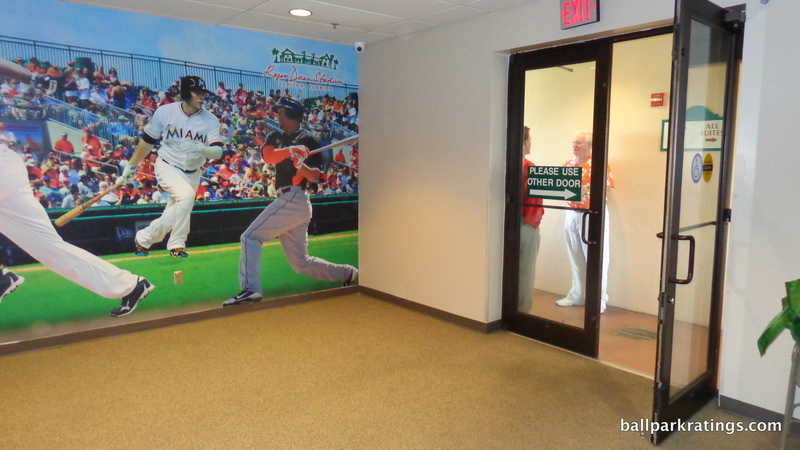 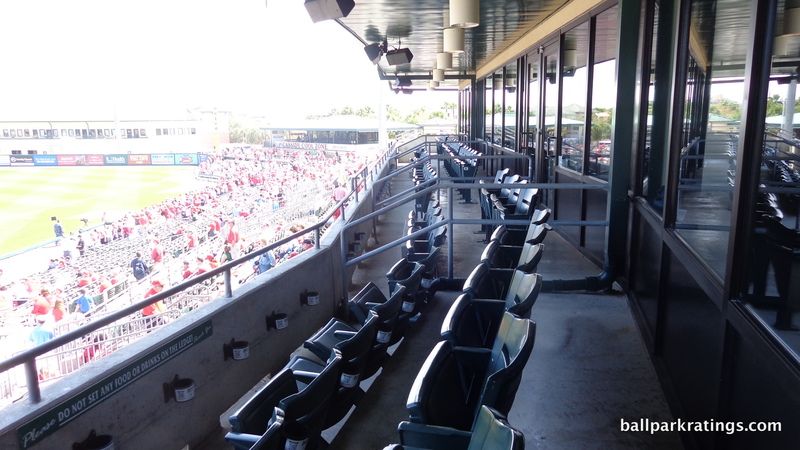 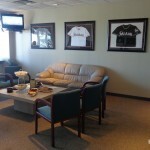 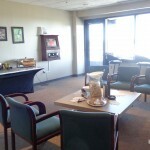 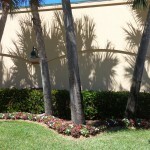 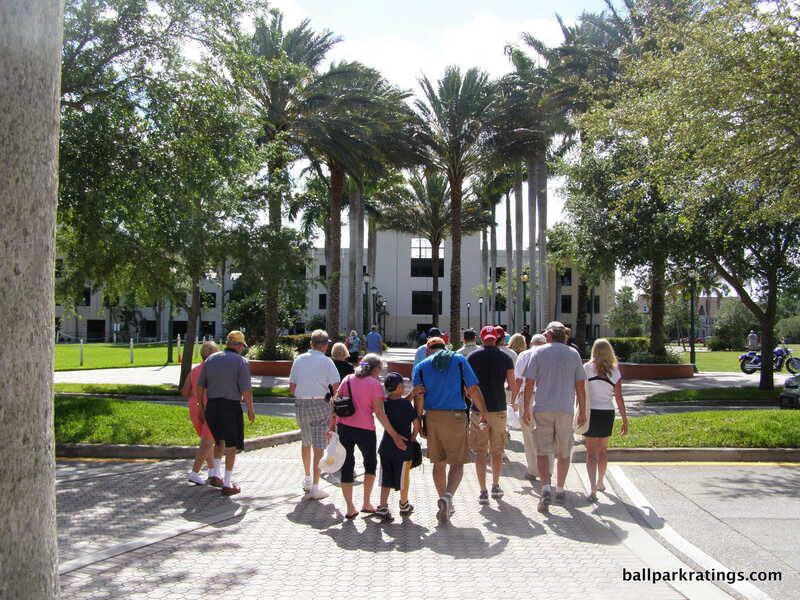 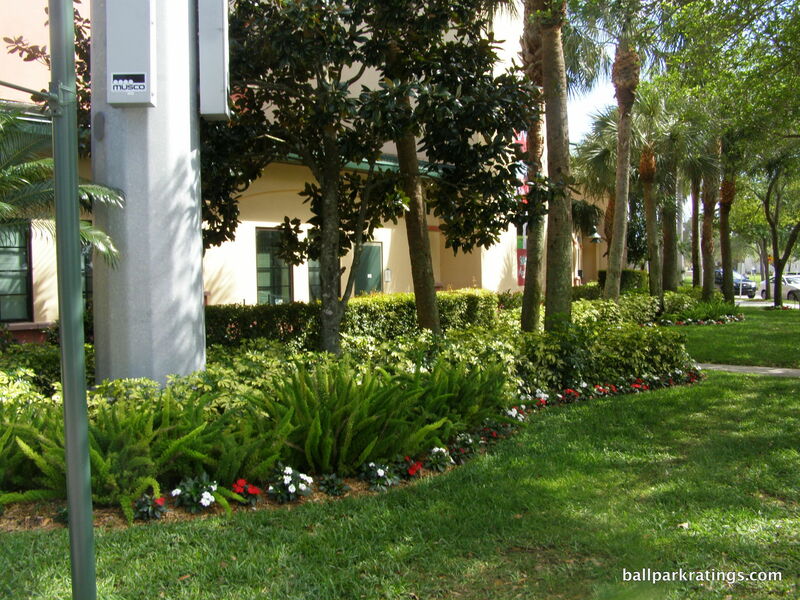 In looking at Roger Dean Stadium in comparison to its peers, intimacy is more emphasized. 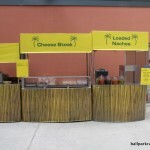 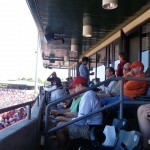 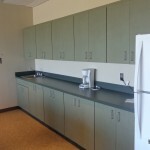 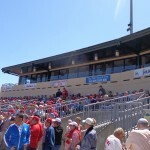 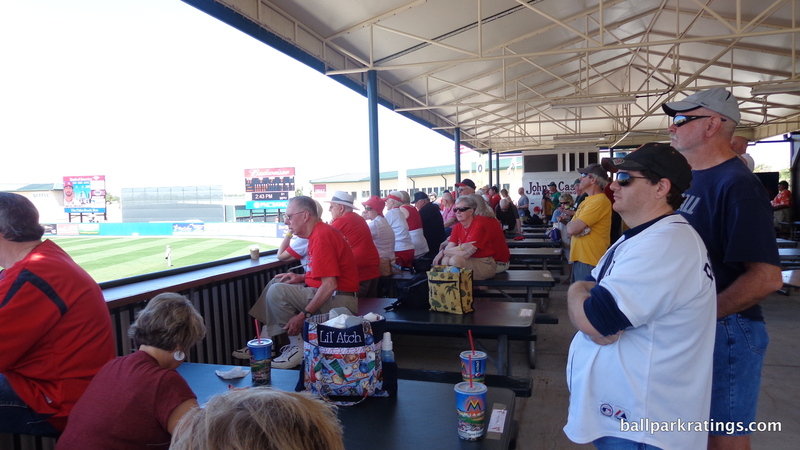 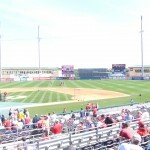 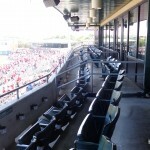 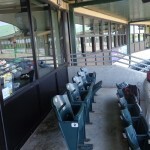 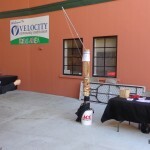 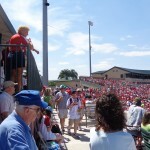 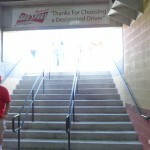 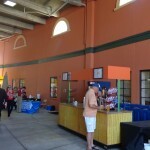 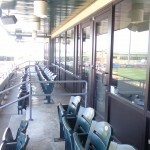 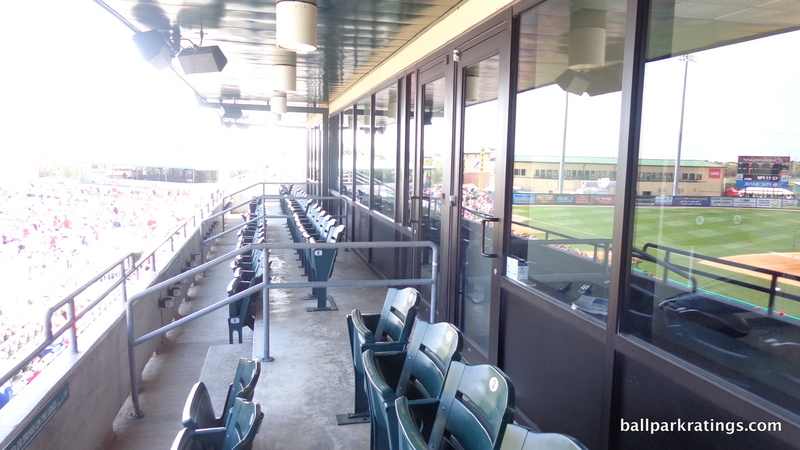 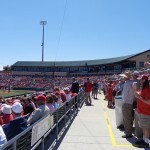 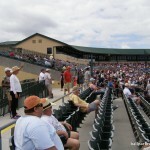 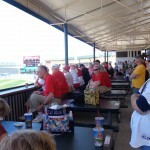 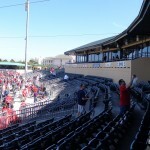 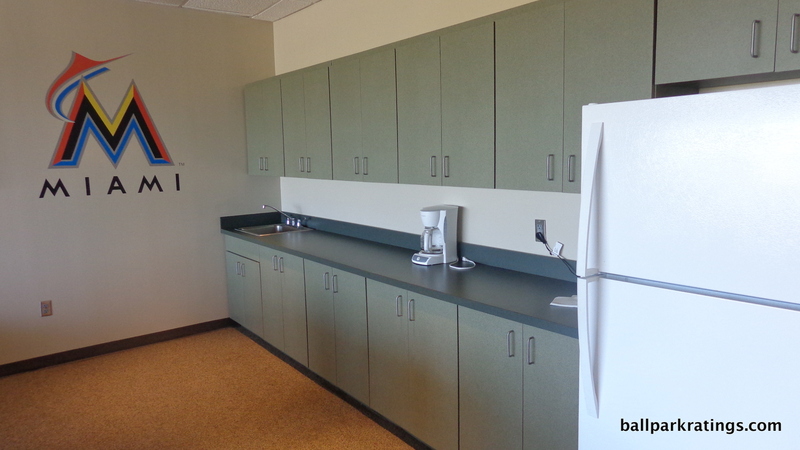 The ballpark features a lower vertical profile and a capacity of only about 6,800. 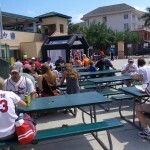 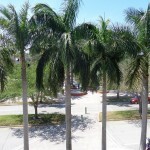 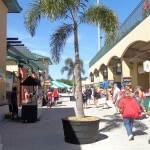 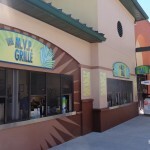 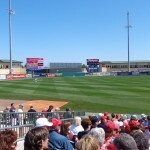 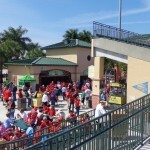 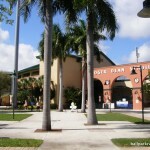 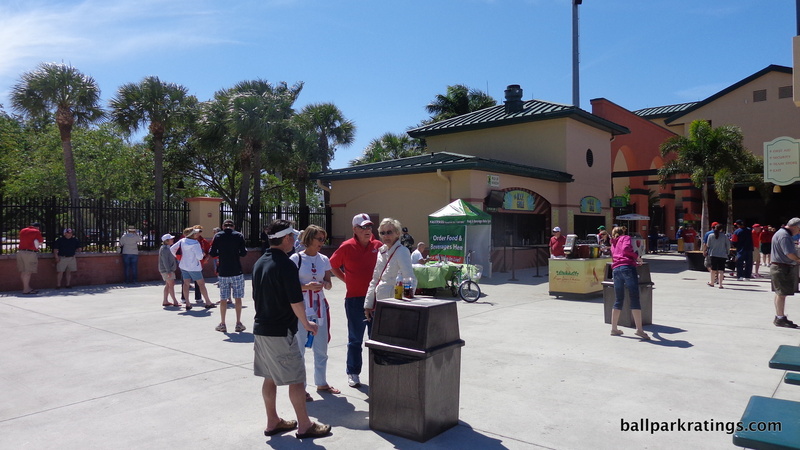 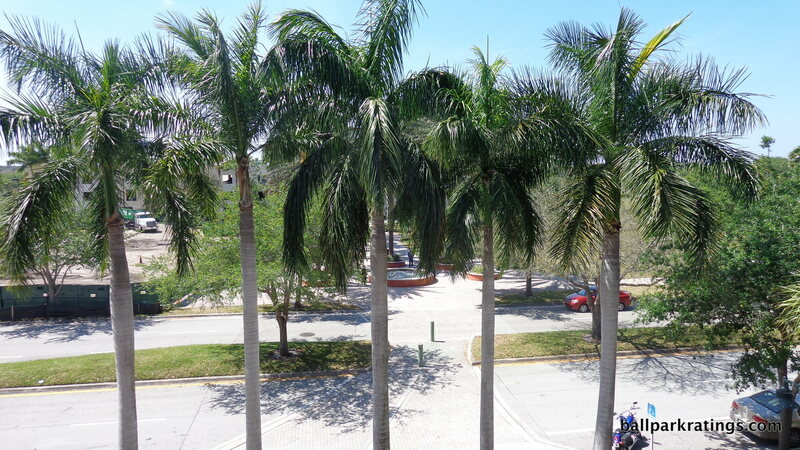 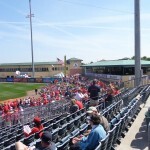 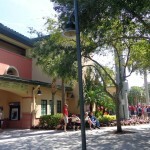 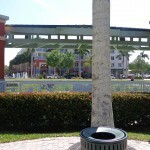 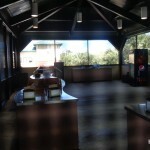 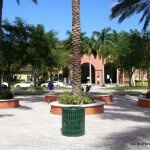 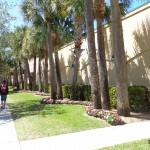 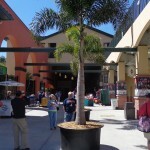 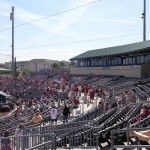 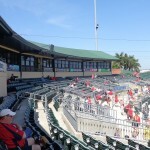 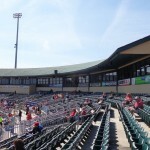 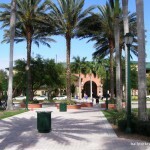 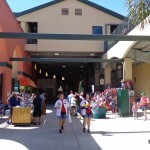 The lack of a roof over the stands was criticized, as the park was conceptualized as a completely open-air Floridian patio. 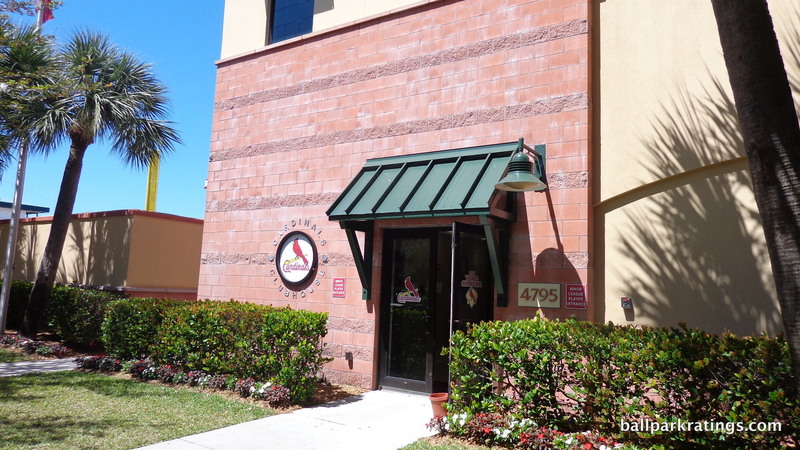 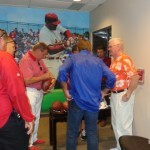 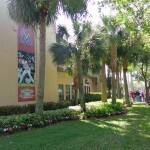 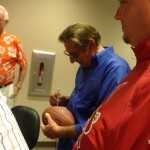 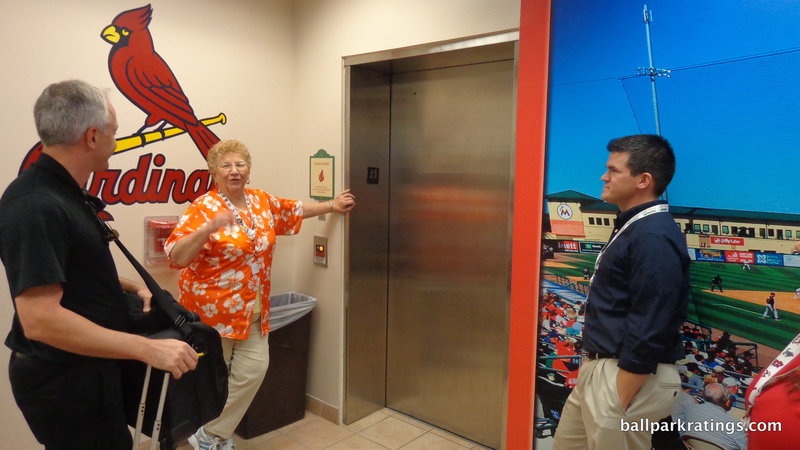 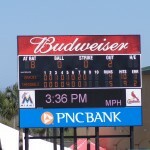 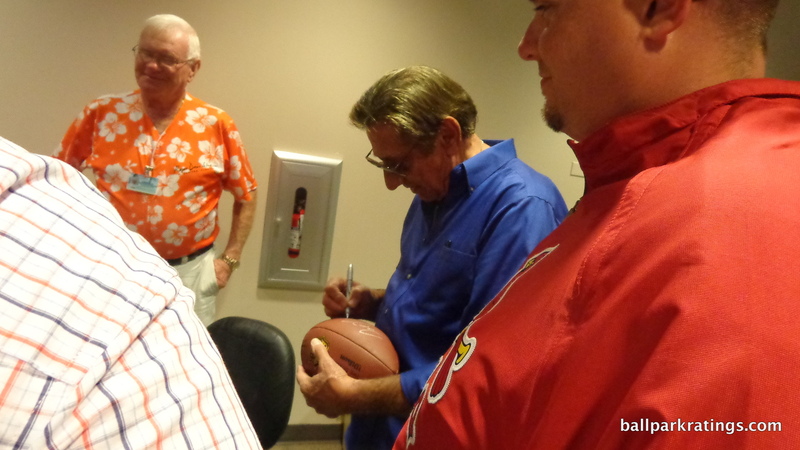 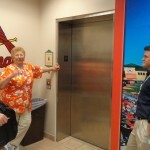 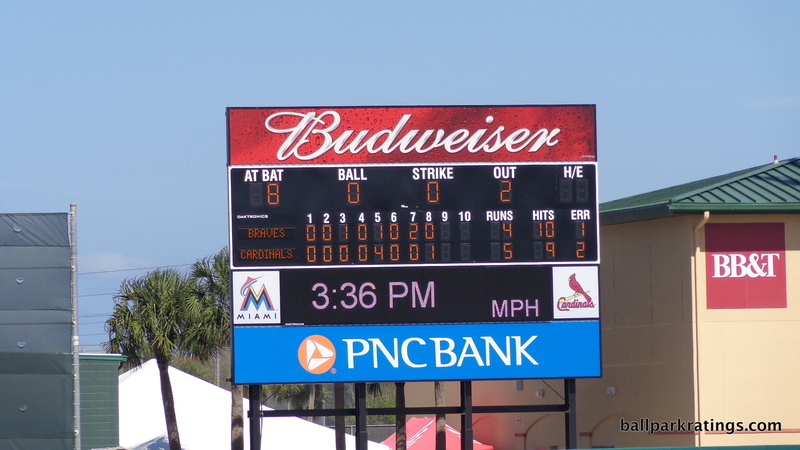 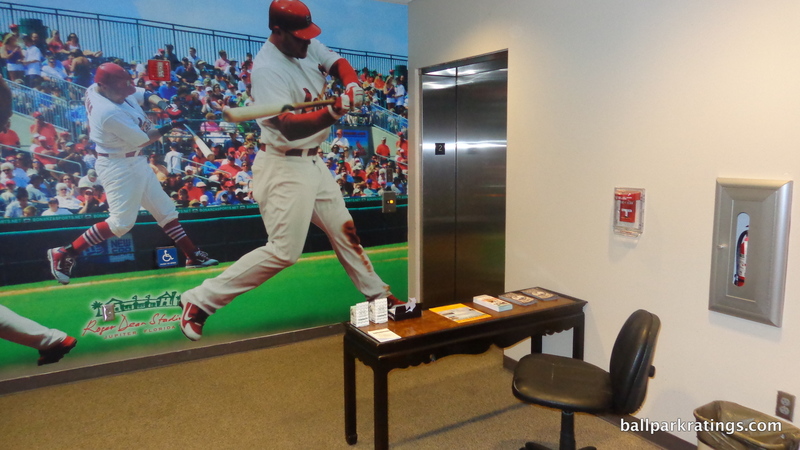 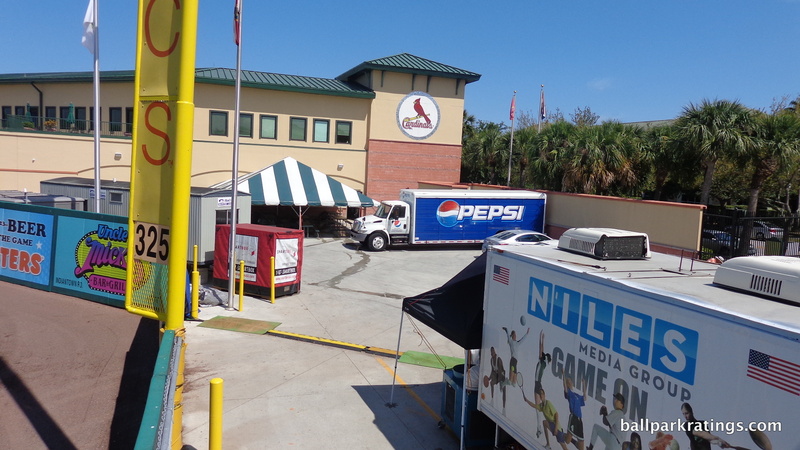 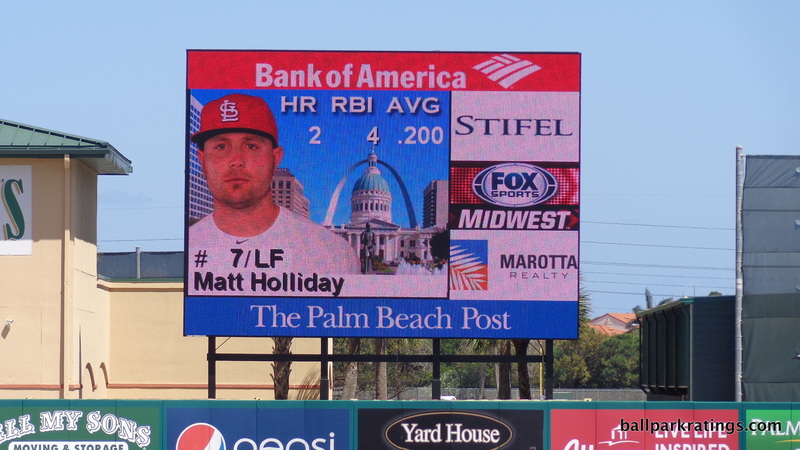 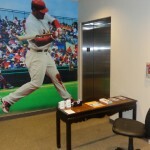 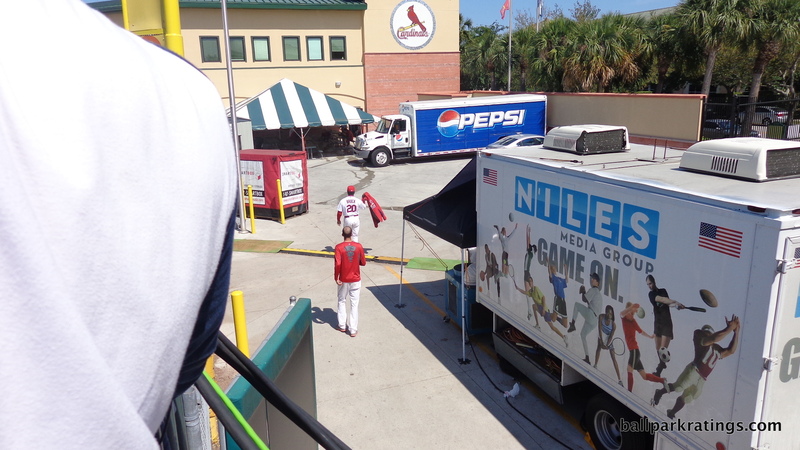 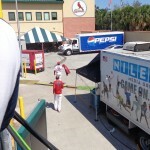 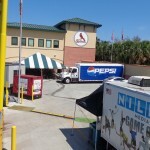 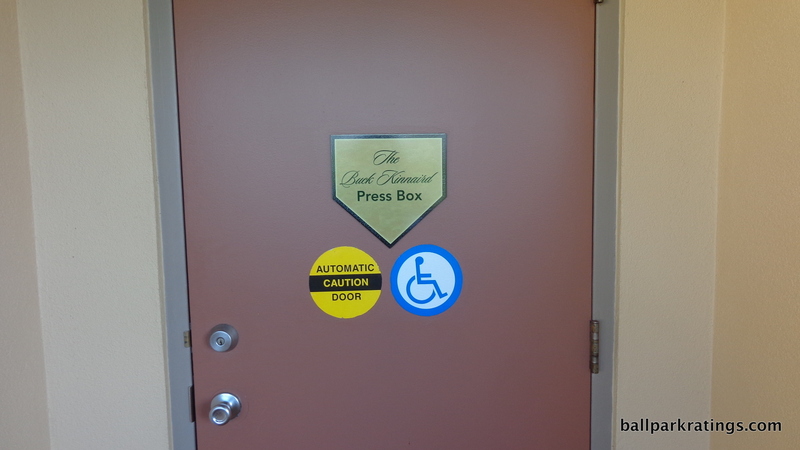 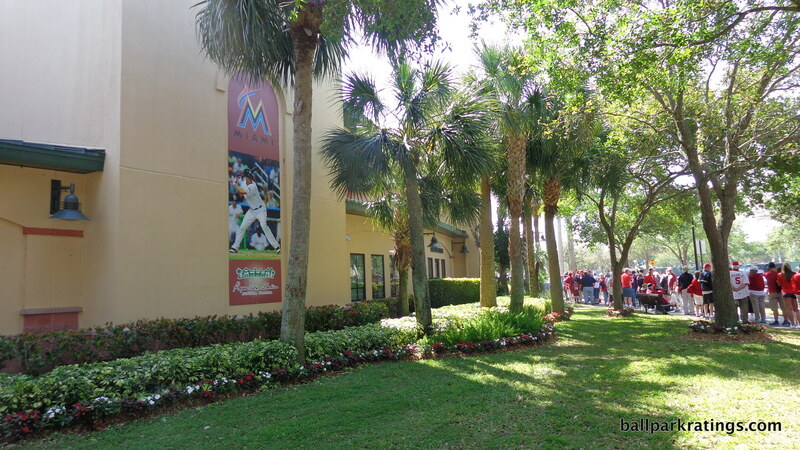 Failing to reflect much character relating to the Cardinals or Marlins, it doesn’t have as much personality as most others, but it retains distinctiveness due to the identifying clubhouse backdrop. 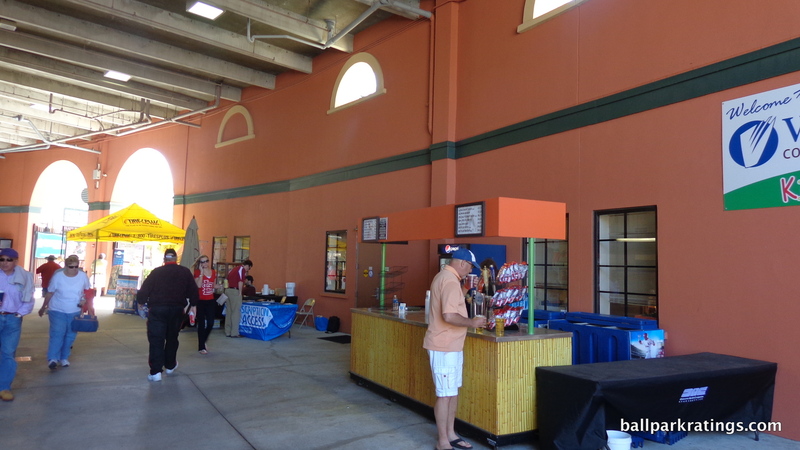 Overall, it represents this era of ballparks well. 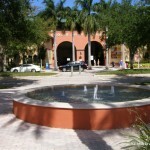 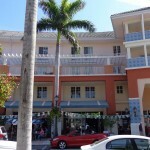 Abacoa Town Center. 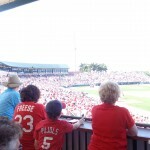 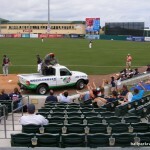 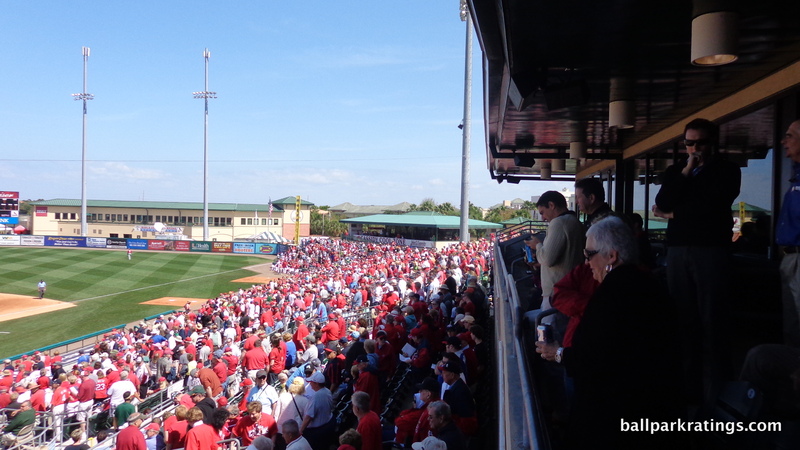 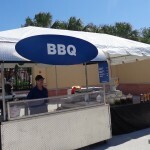 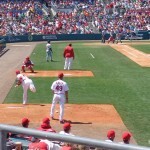 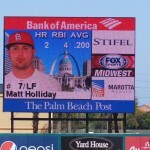 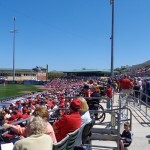 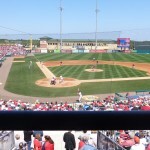 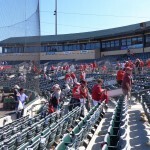 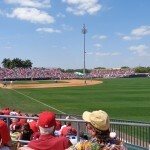 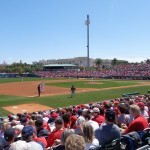 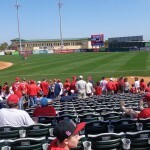 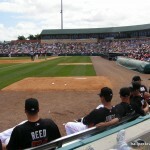 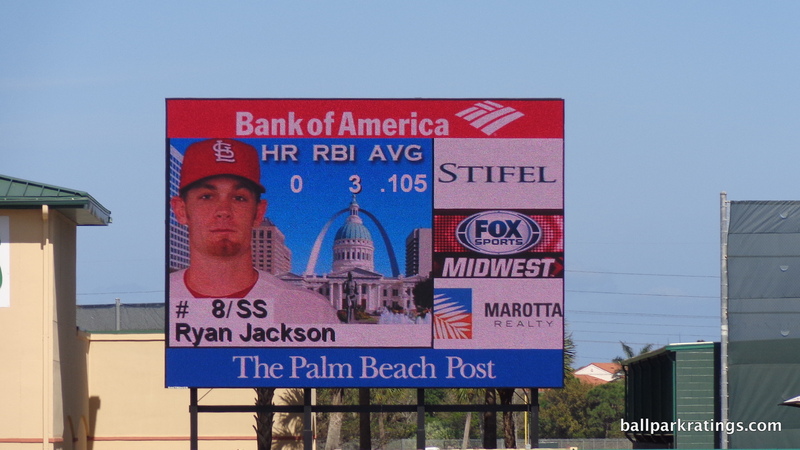 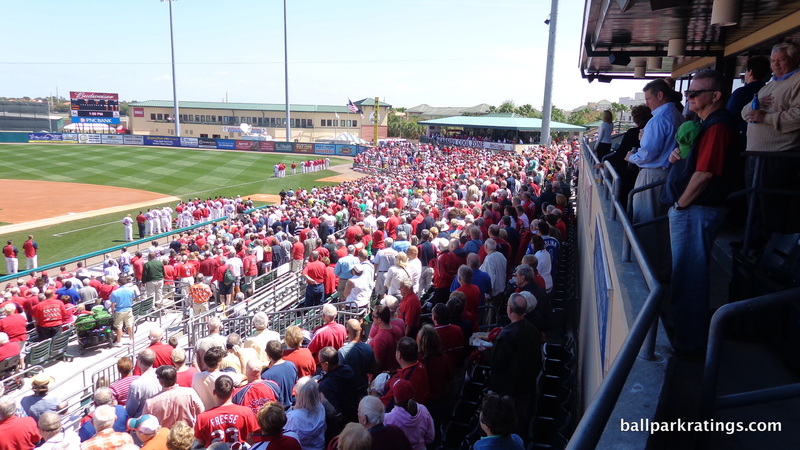 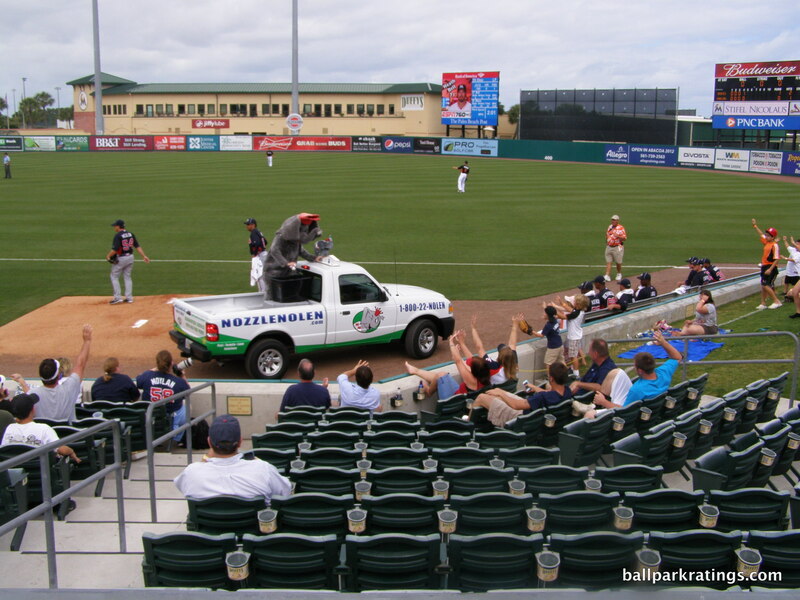 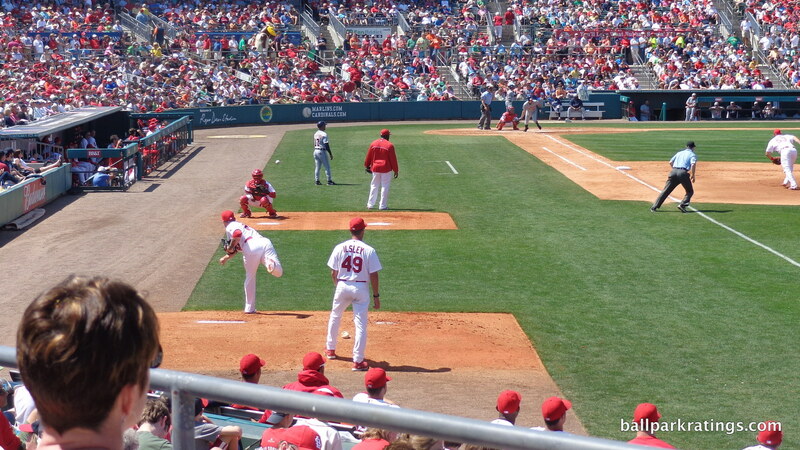 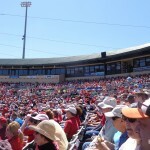 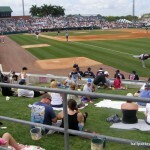 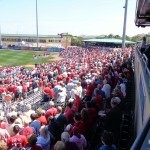 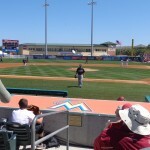 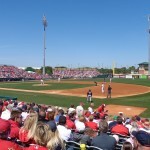 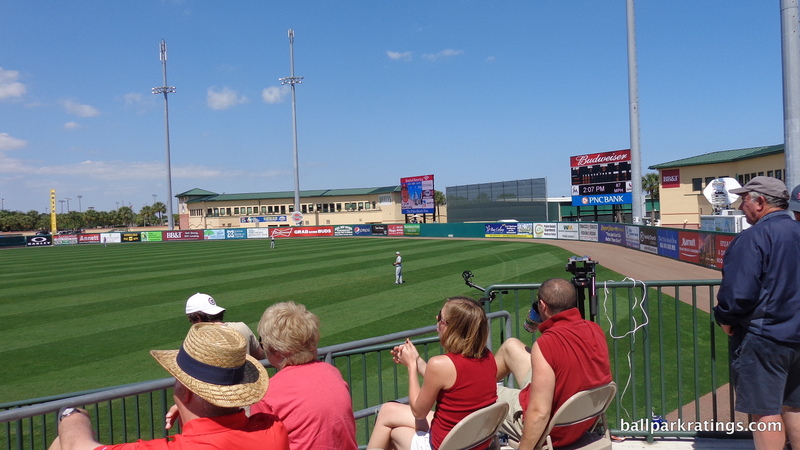 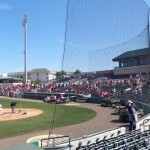 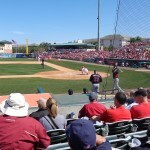 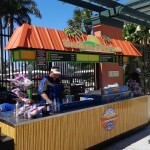 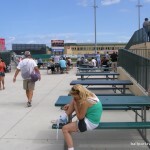 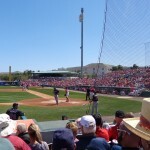 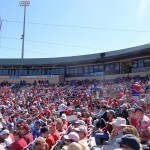 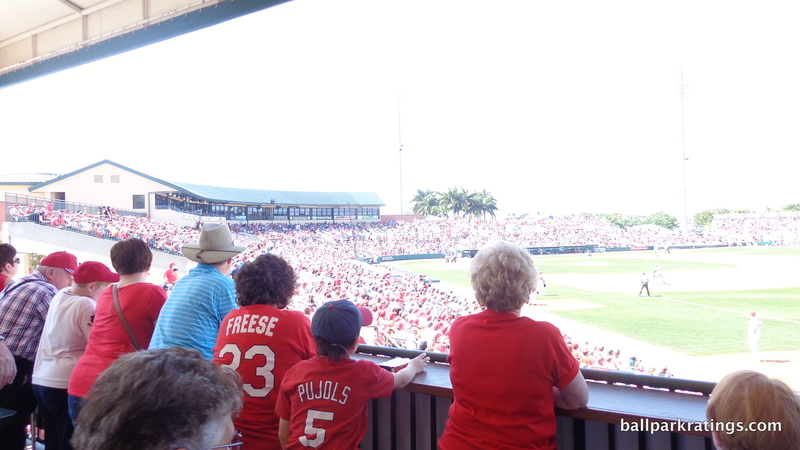 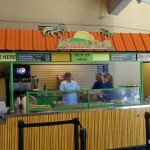 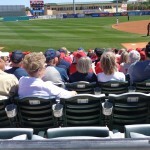 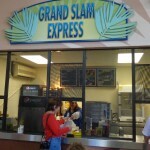 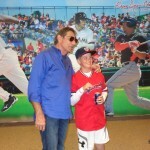 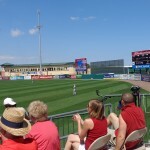 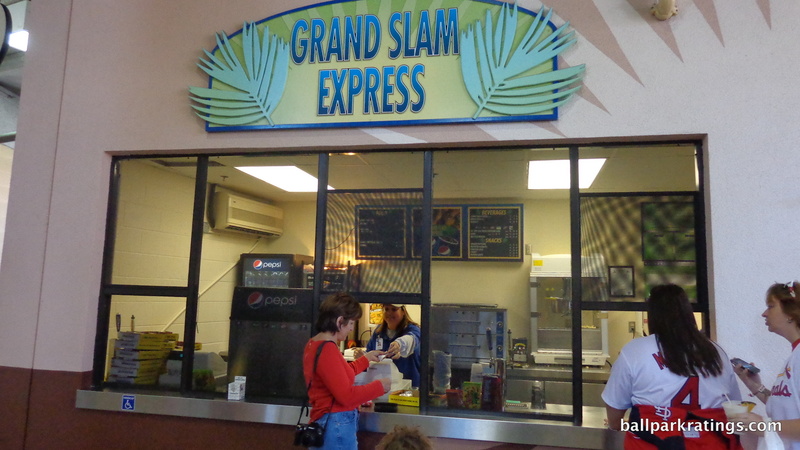 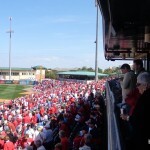 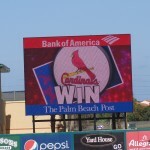 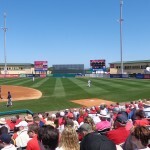 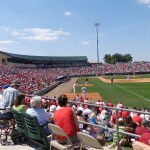 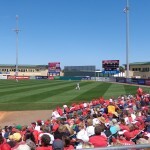 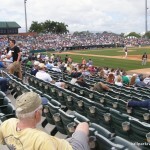 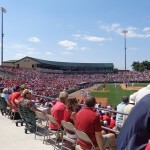 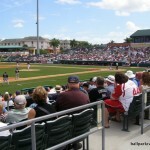 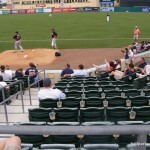 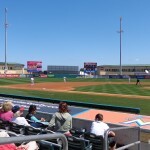 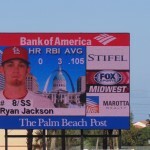 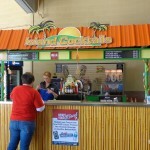 Roger Dean Stadium has the best local scene in Florida spring training. 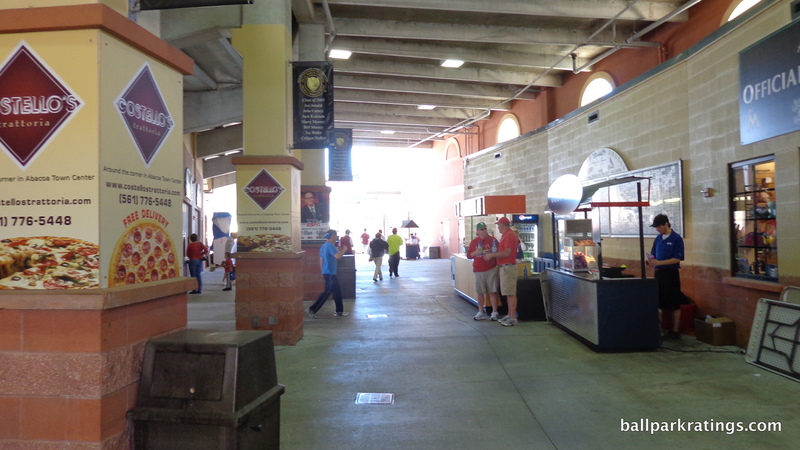 Unfortunately, this “walkability” is not emulated inside the park, as the concourse doesn’t encircle the stadium and there are no bars or places to hang out and watch the game. 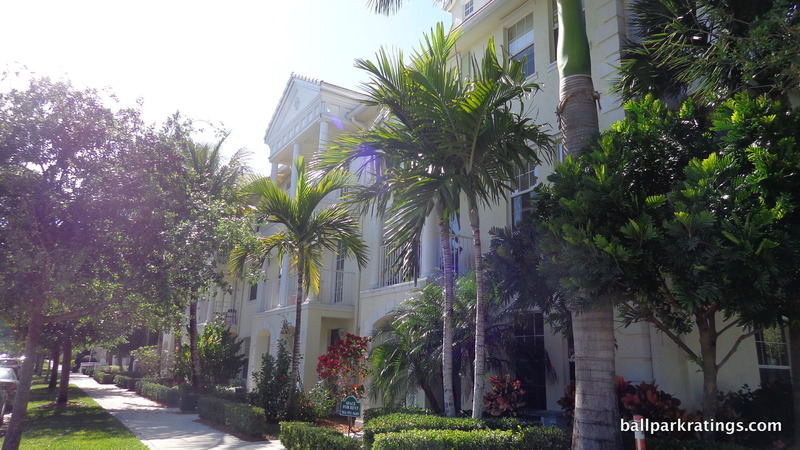 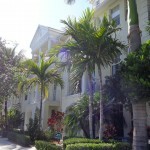 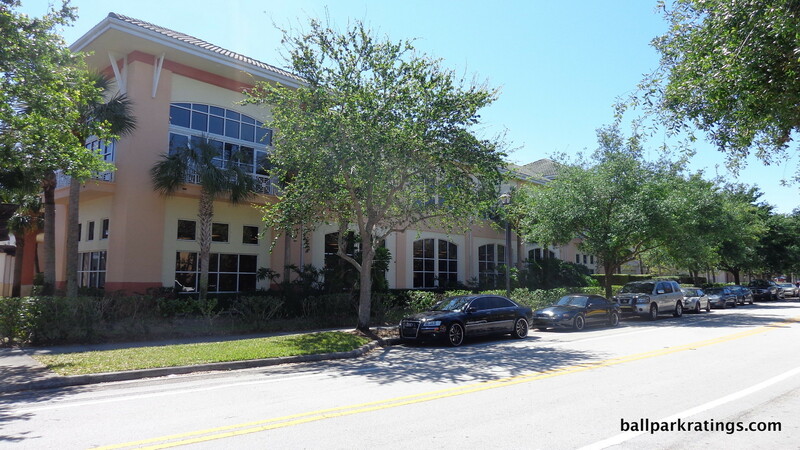 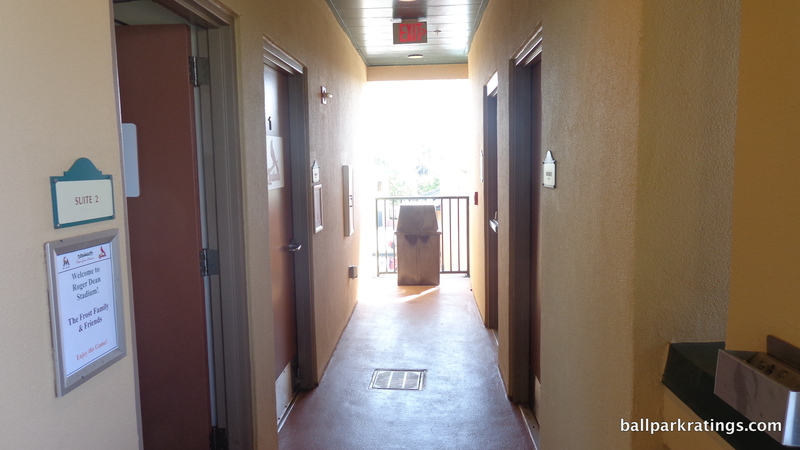 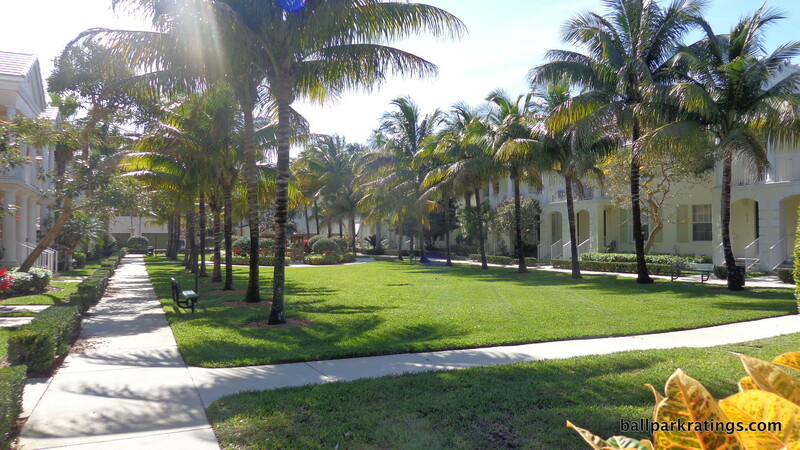 The future of Jupiter’s sparkling pad depends on the practicality of large-scale renovations. 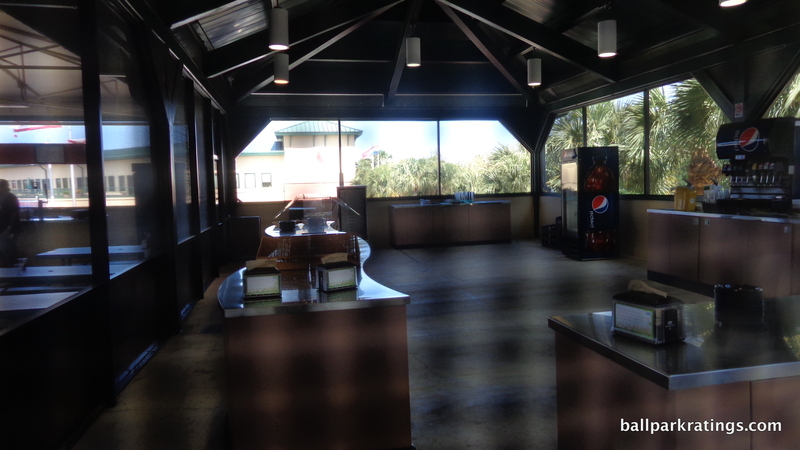 At first glance, a 360-degree concourse might be difficult to construct, due the location of the aforementioned clubhouses. 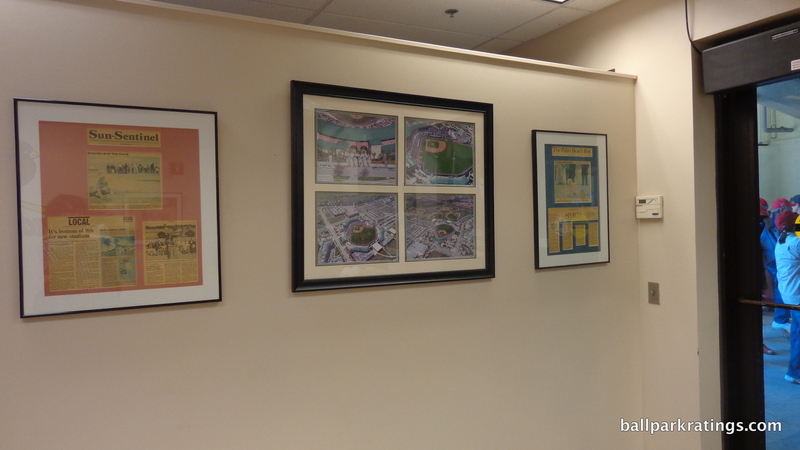 But looking at an overhead view of the complex, there appears to be some of space to build an outfield concourse. 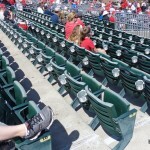 At the same time, the incremental nature of the current enhancements suggests that could be incorrect. 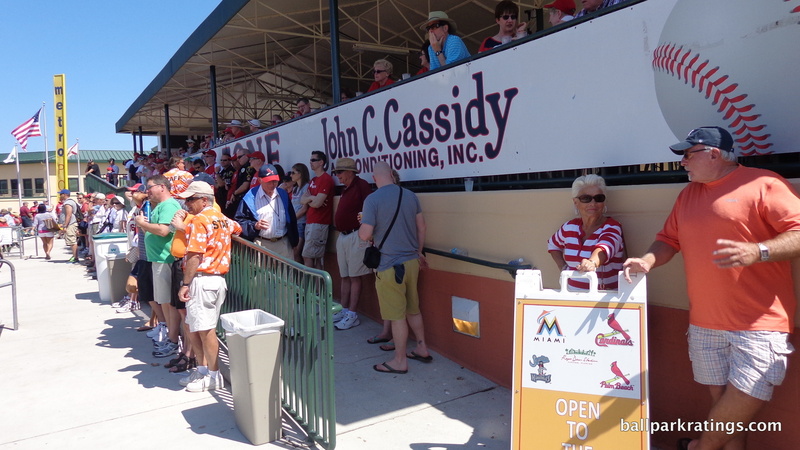 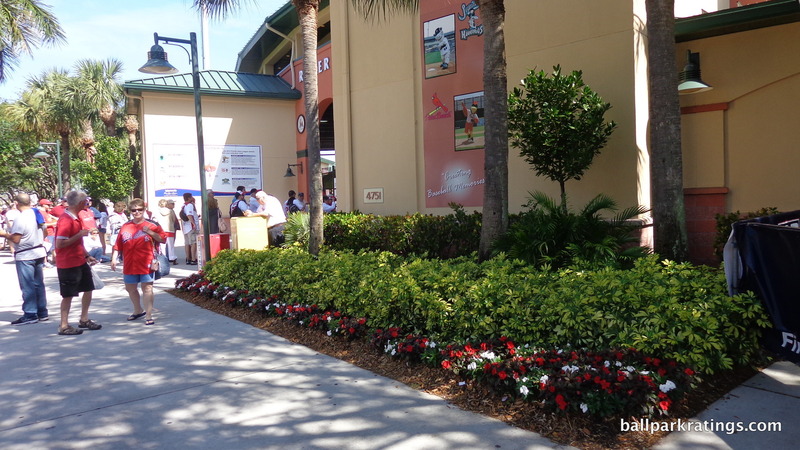 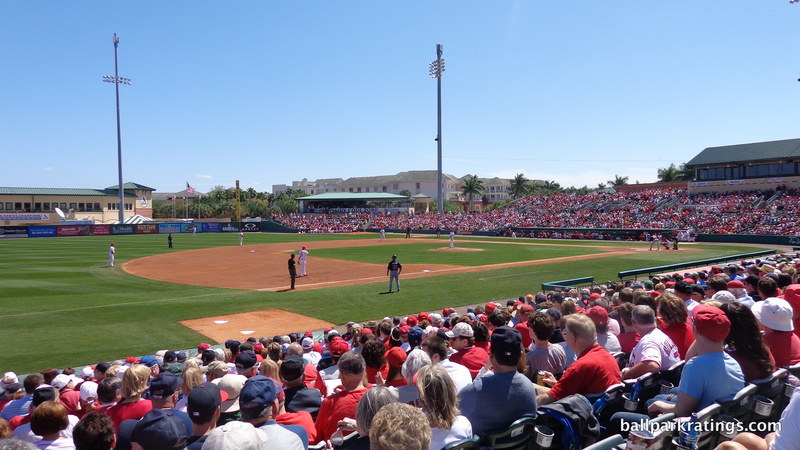 The Cardinals and Marlins refuse to commit to the ballpark beyond 2027, and the county has periodically enhanced the park year-to-year (new seats, bullpen club, new canopy covering stands), while most parks have done one large-scale renovation. 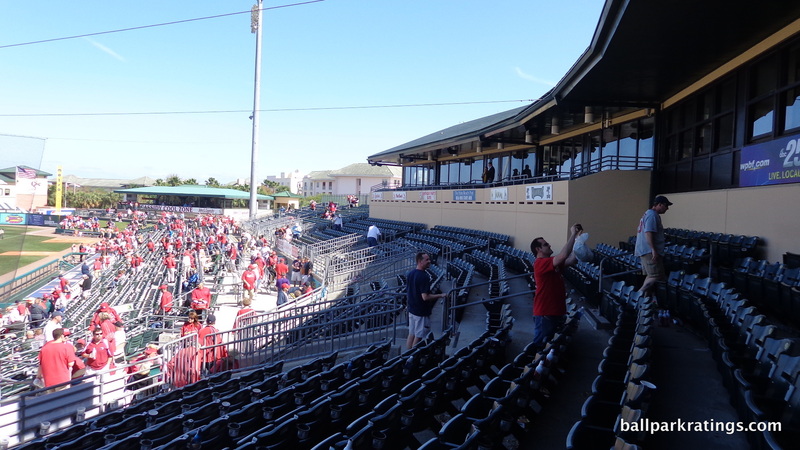 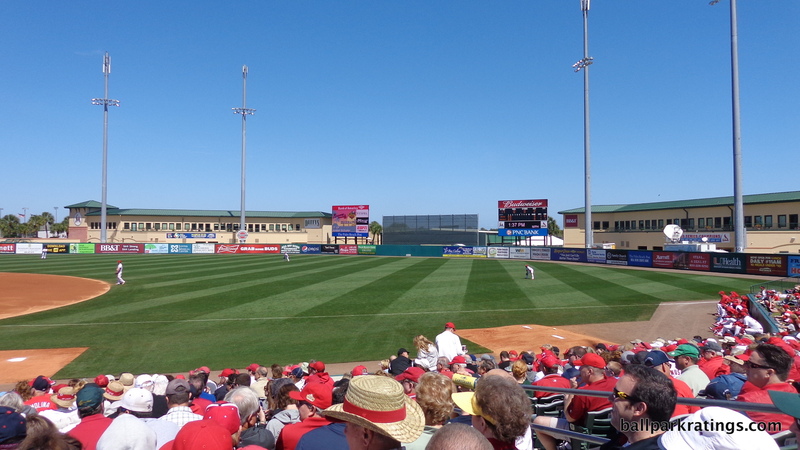 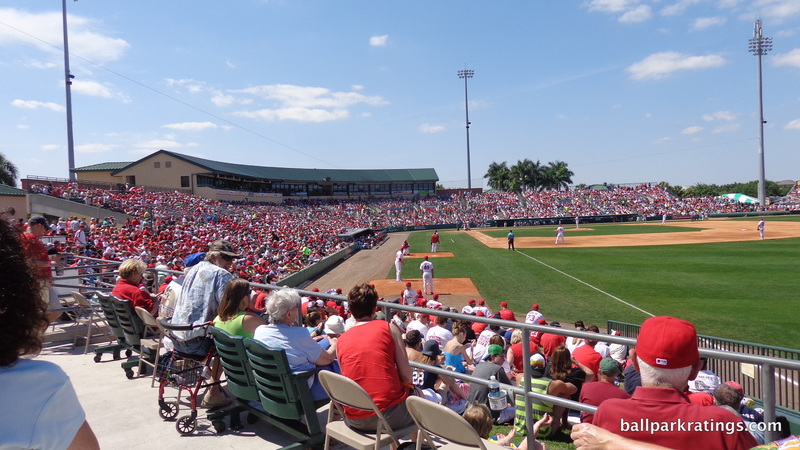 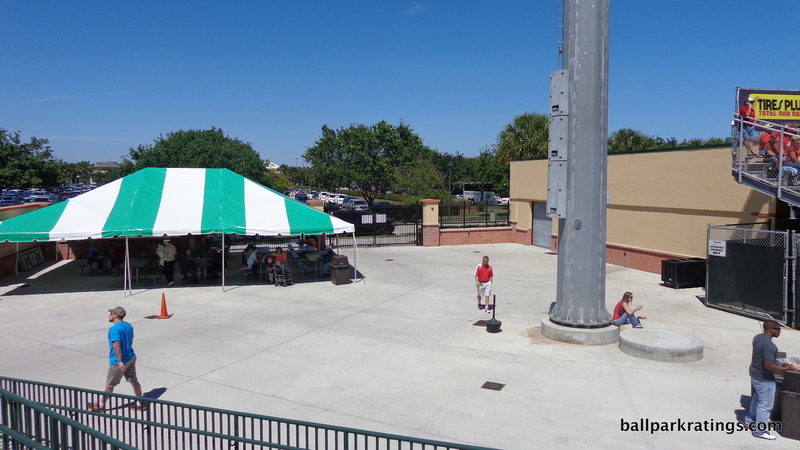 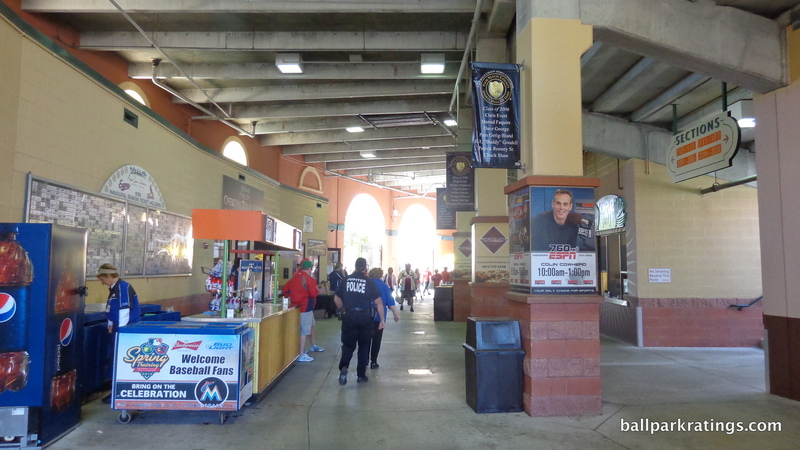 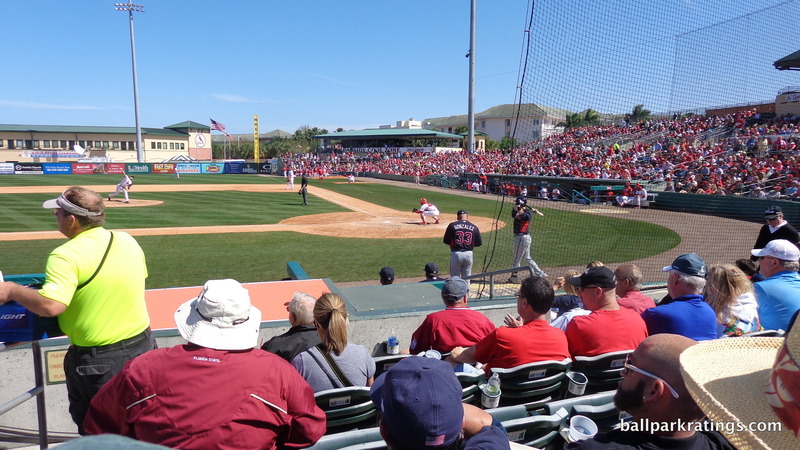 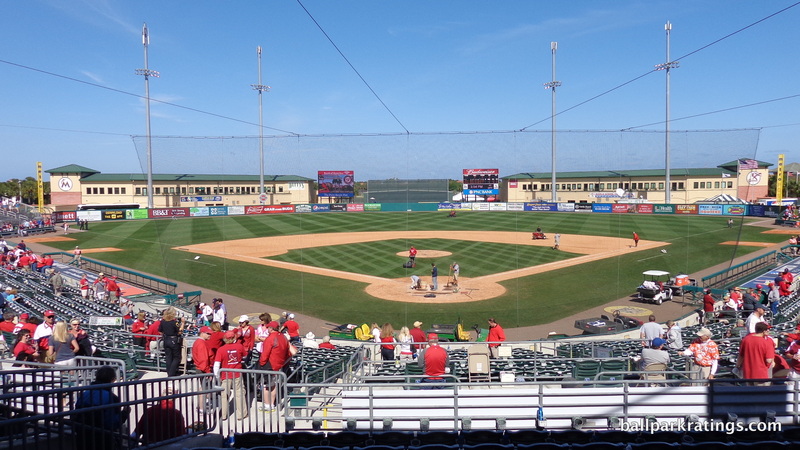 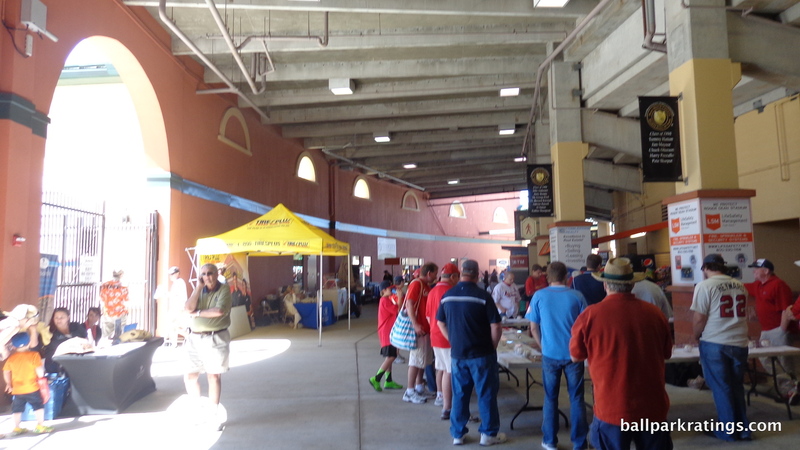 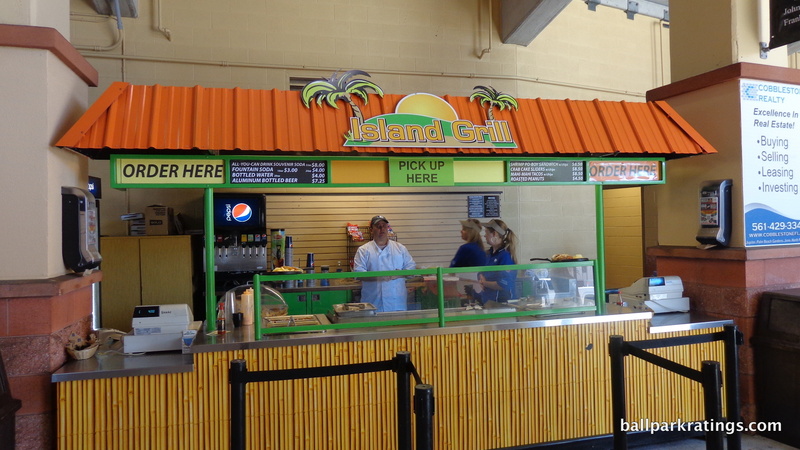 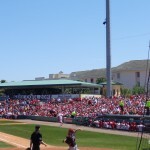 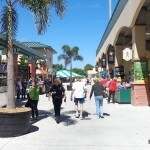 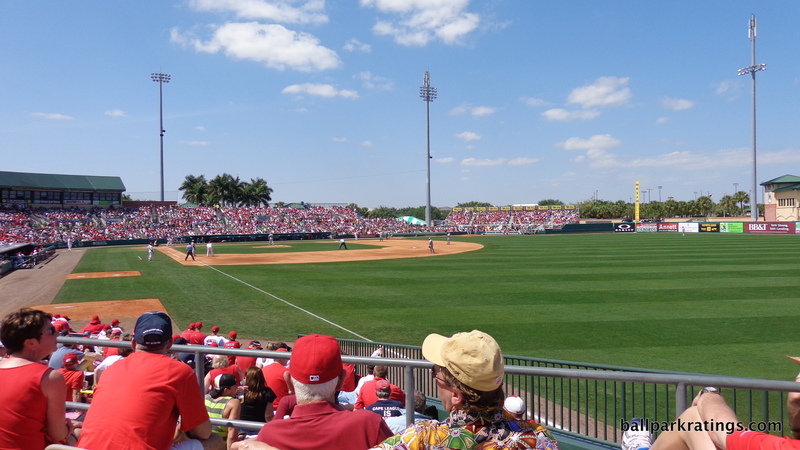 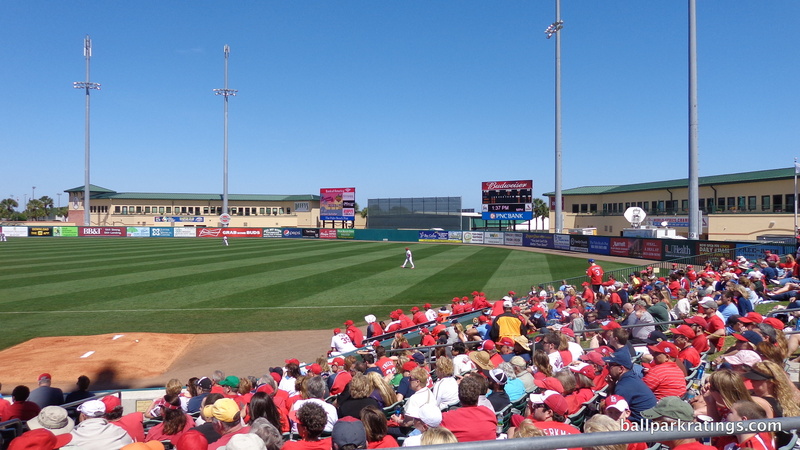 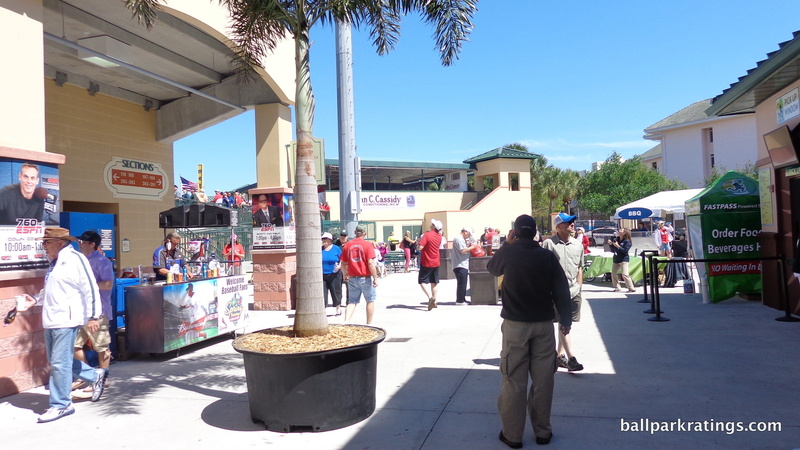 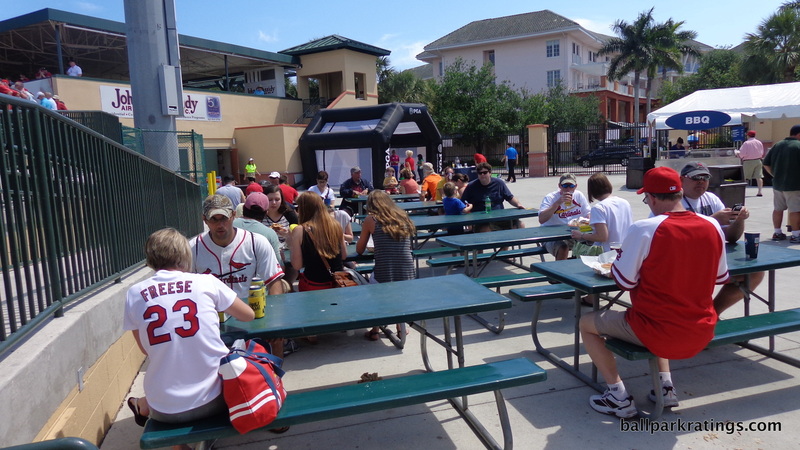 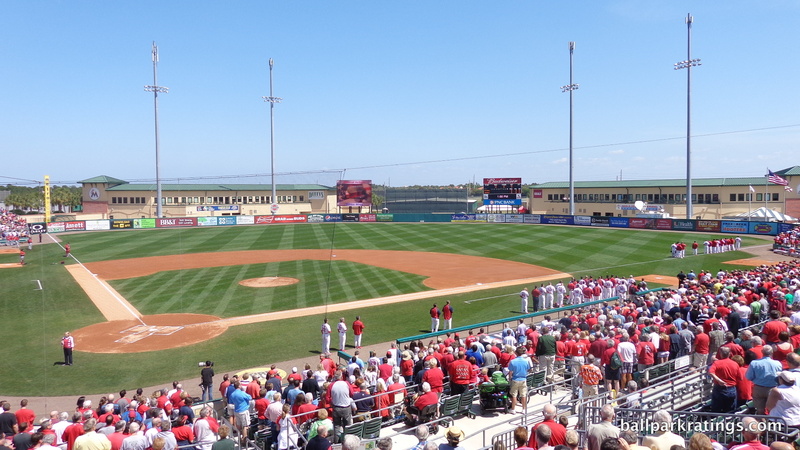 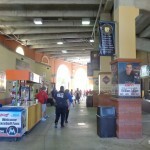 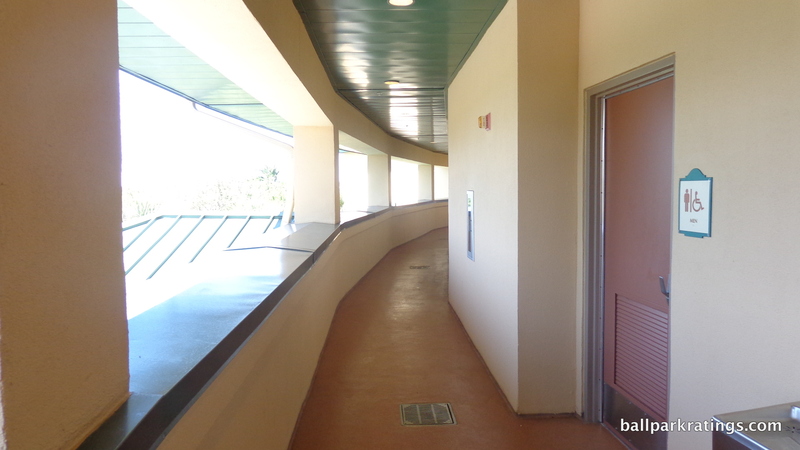 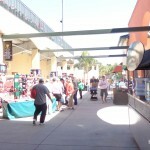 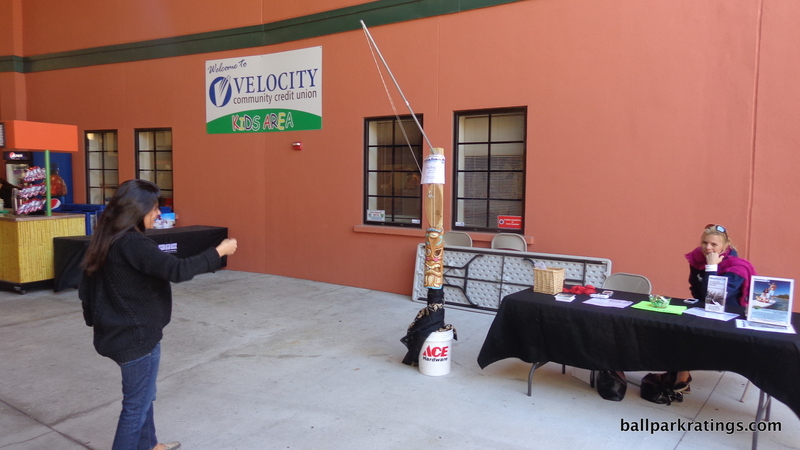 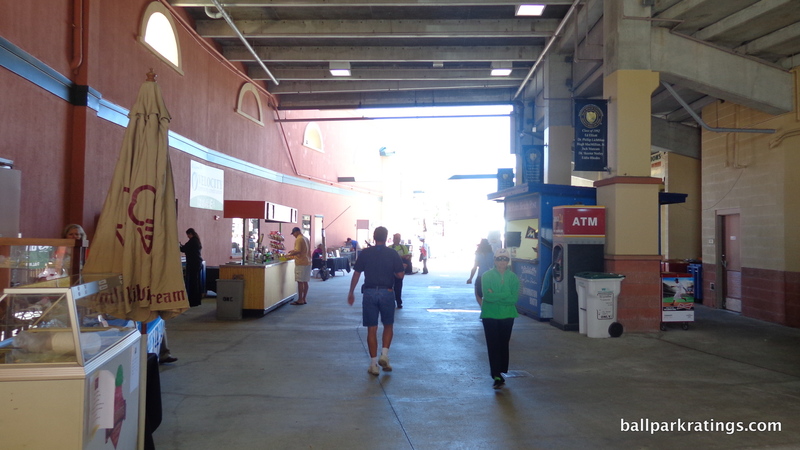 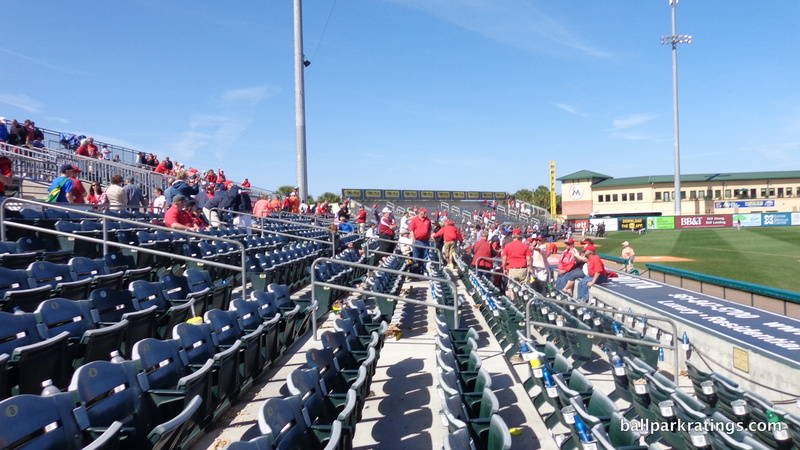 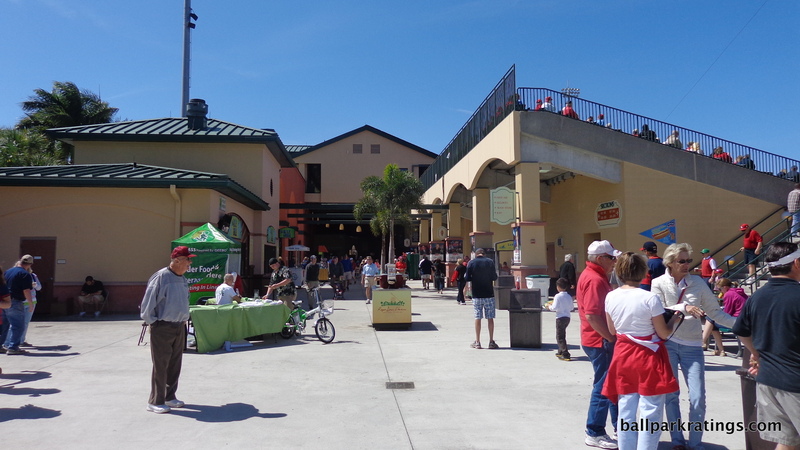 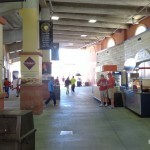 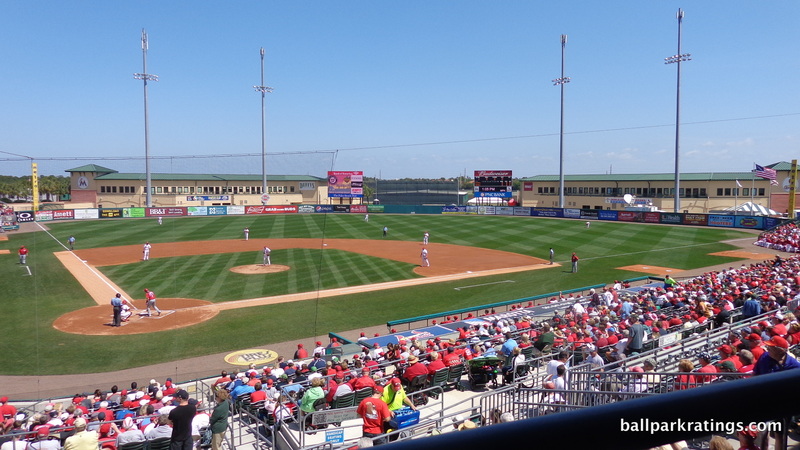 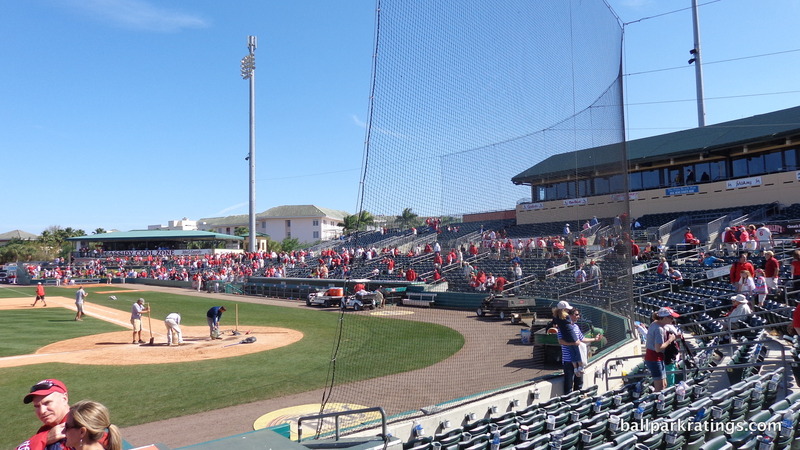 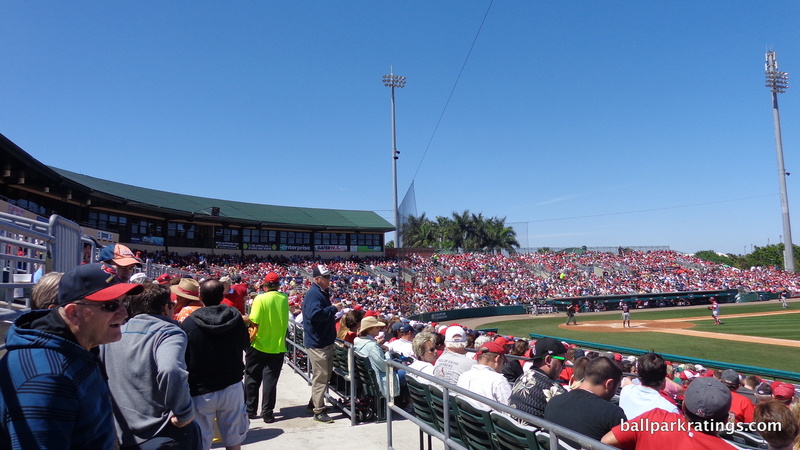 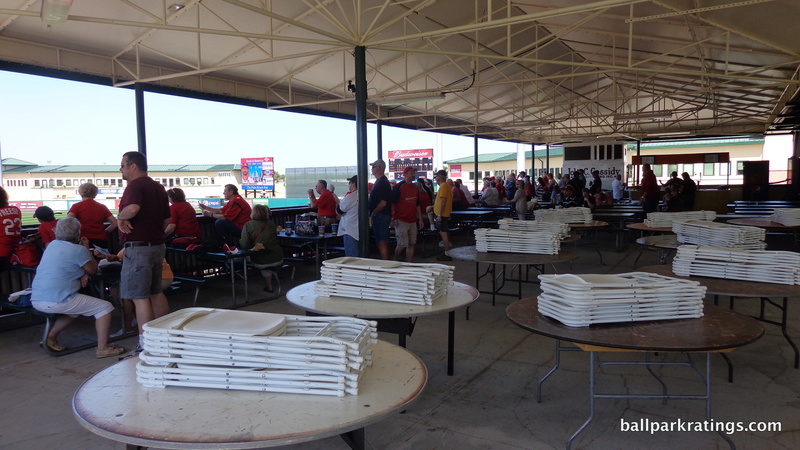 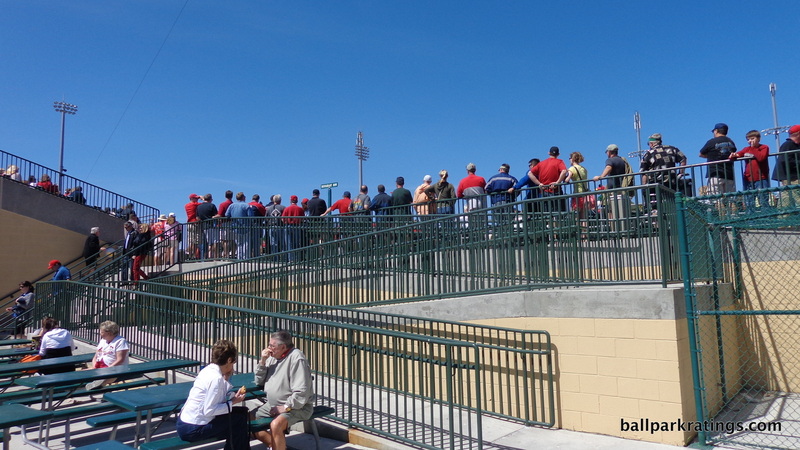 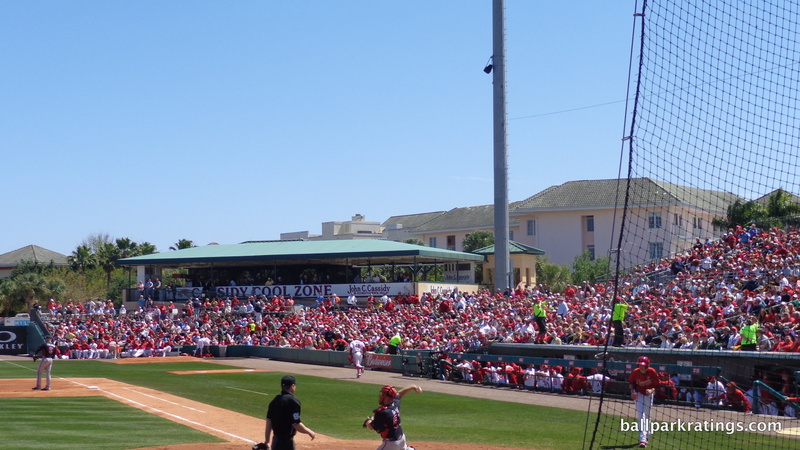 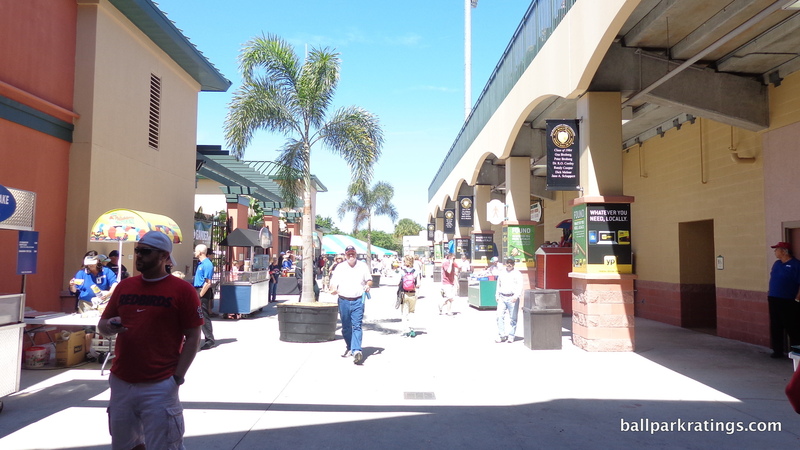 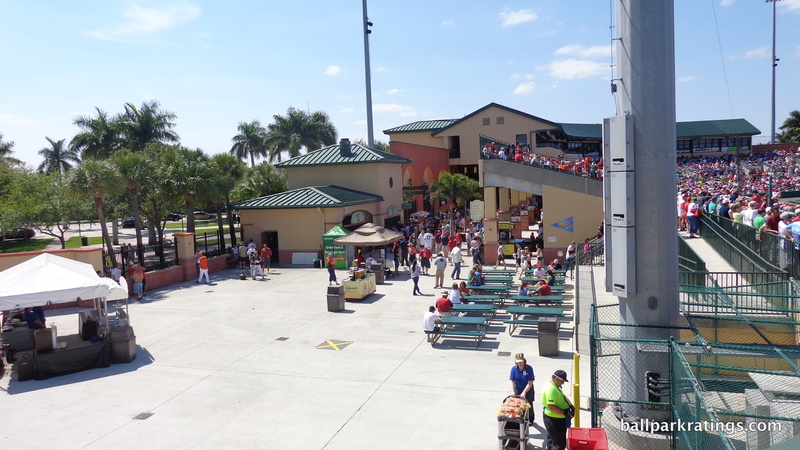 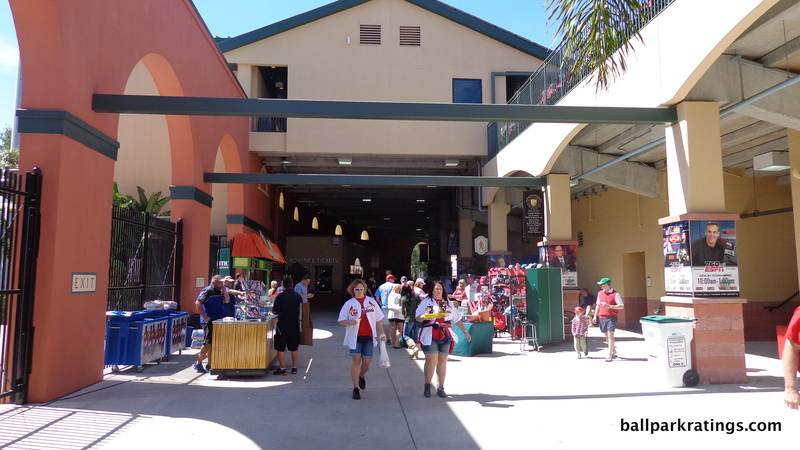 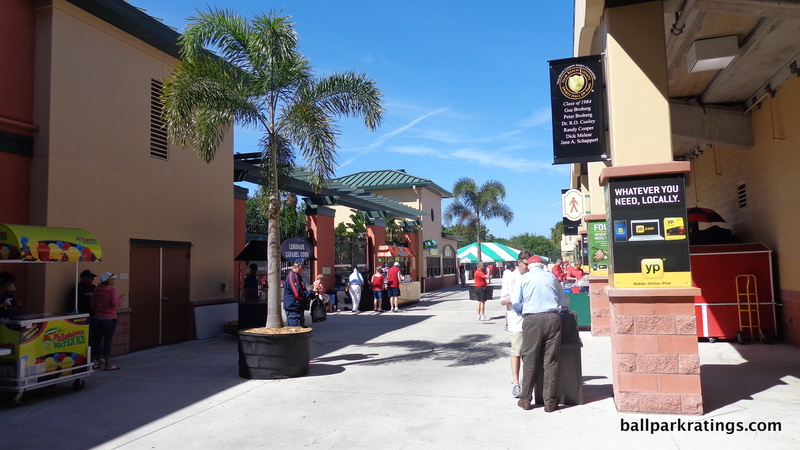 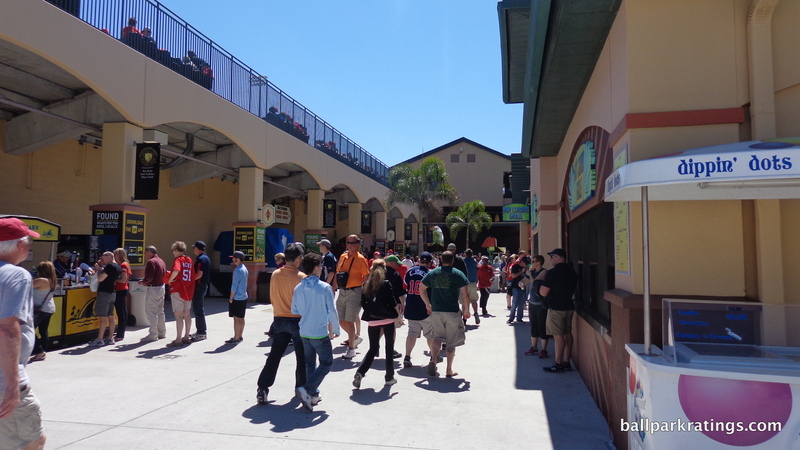 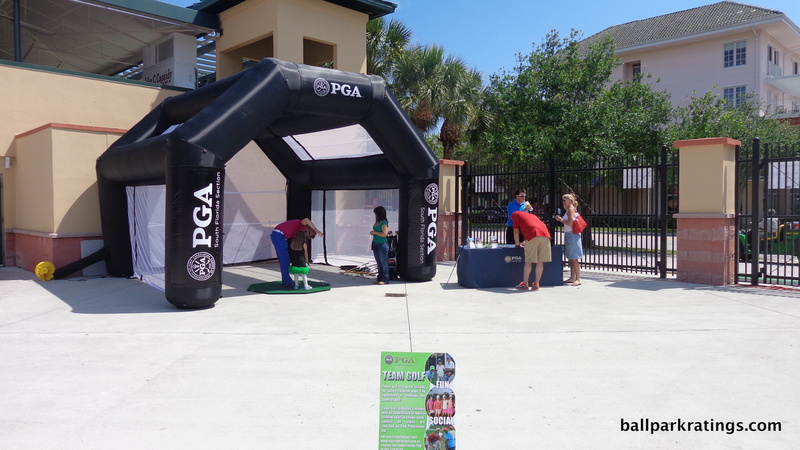 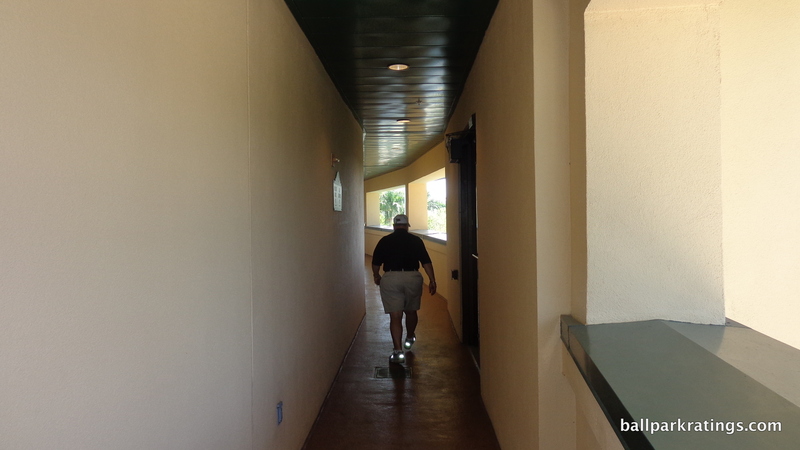 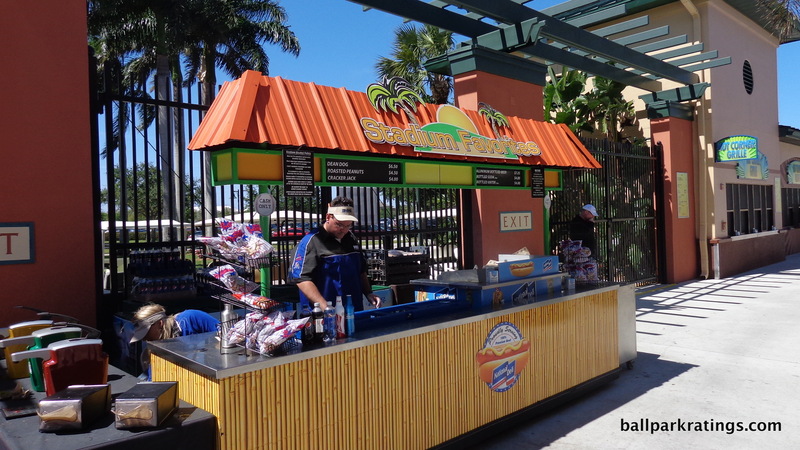 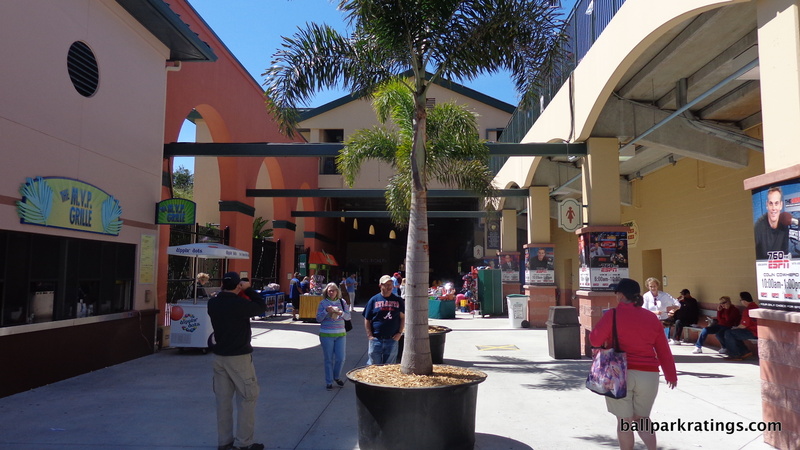 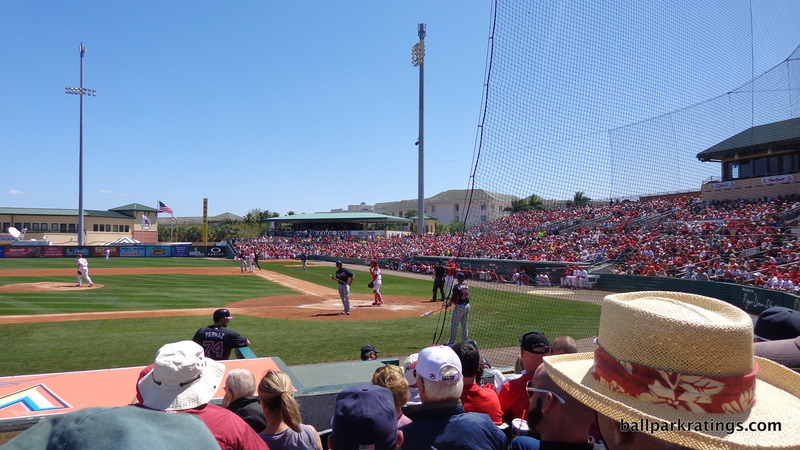 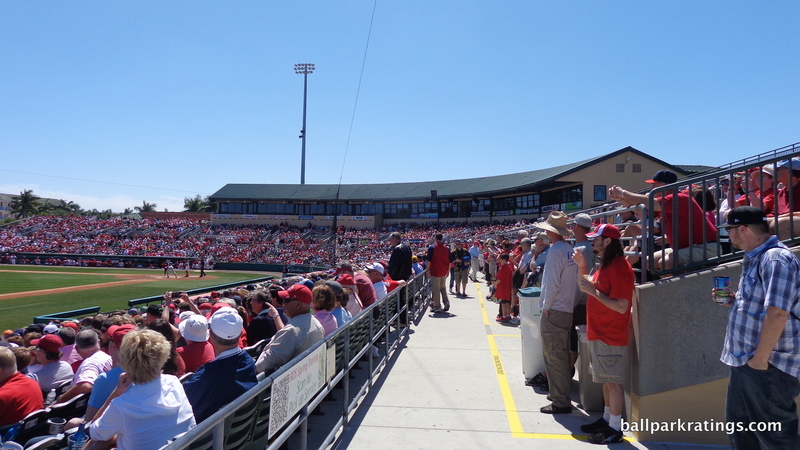 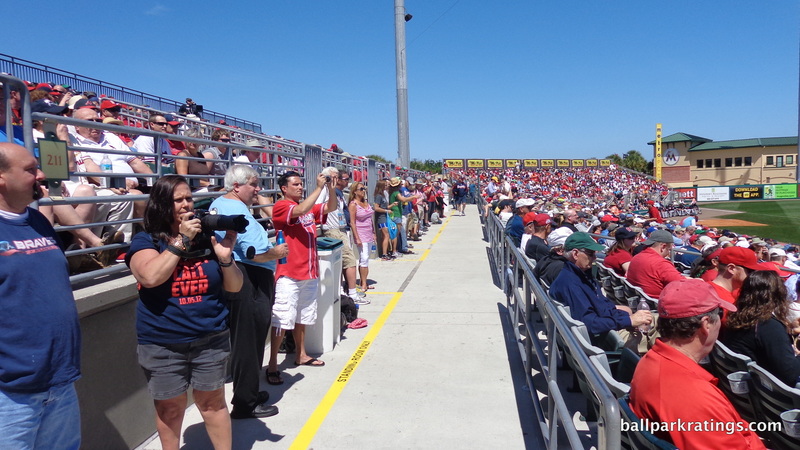 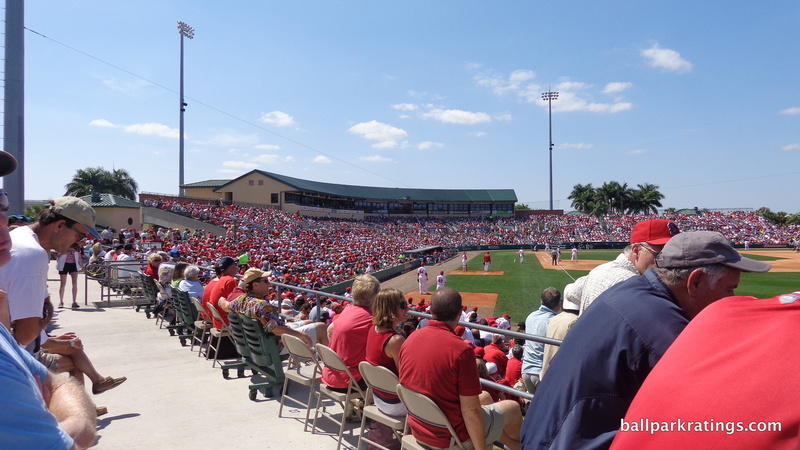 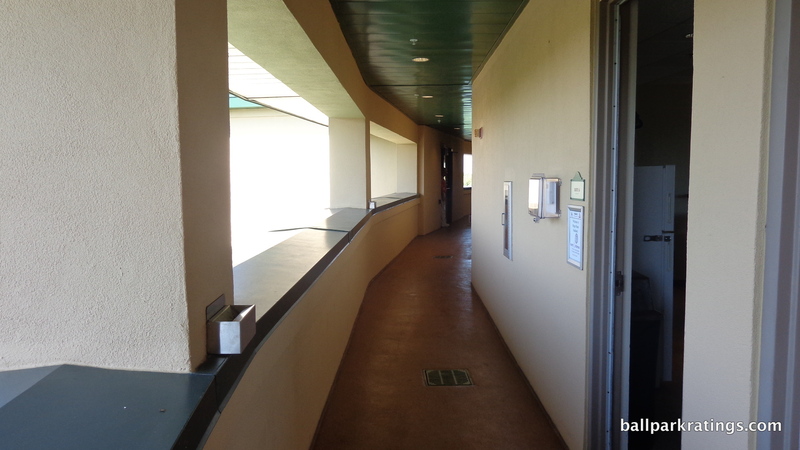 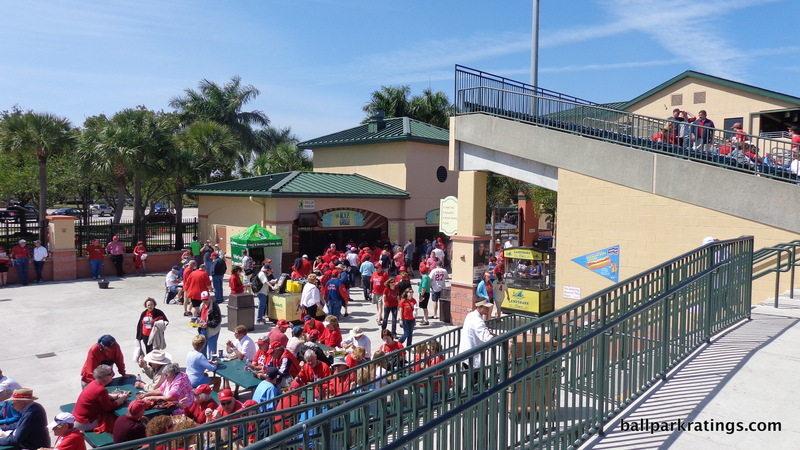 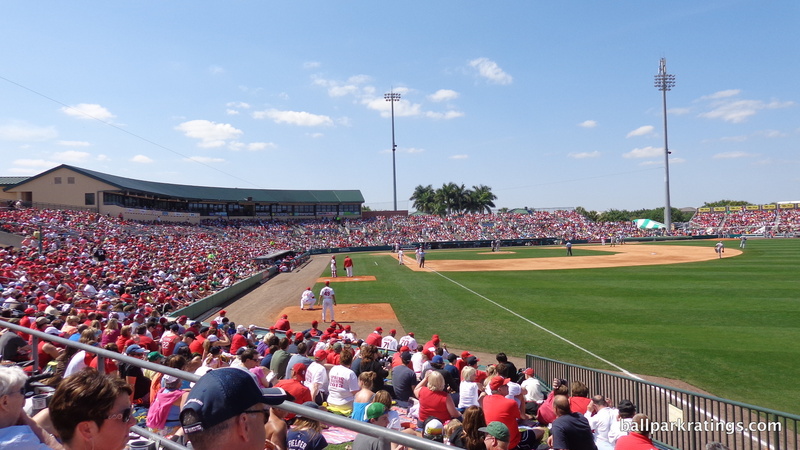 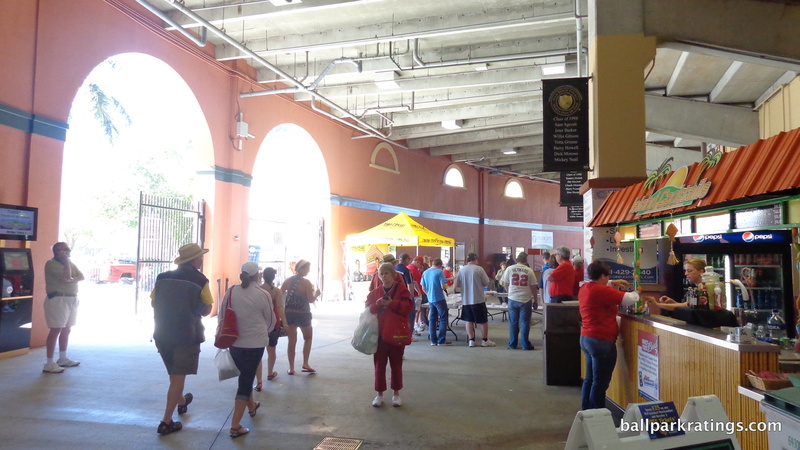 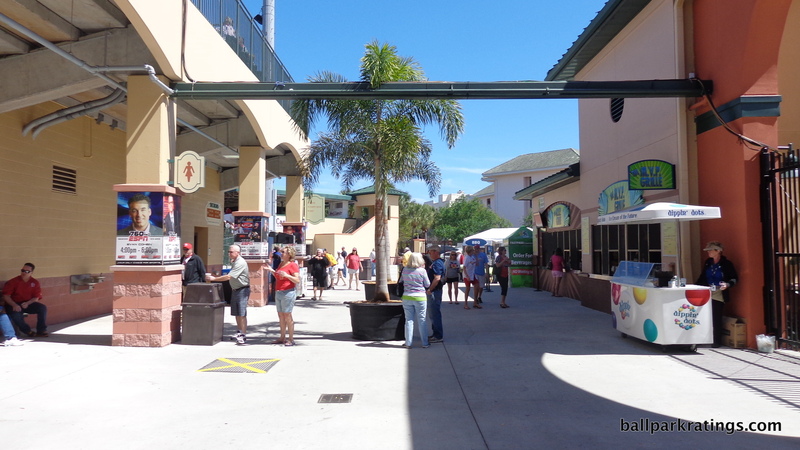 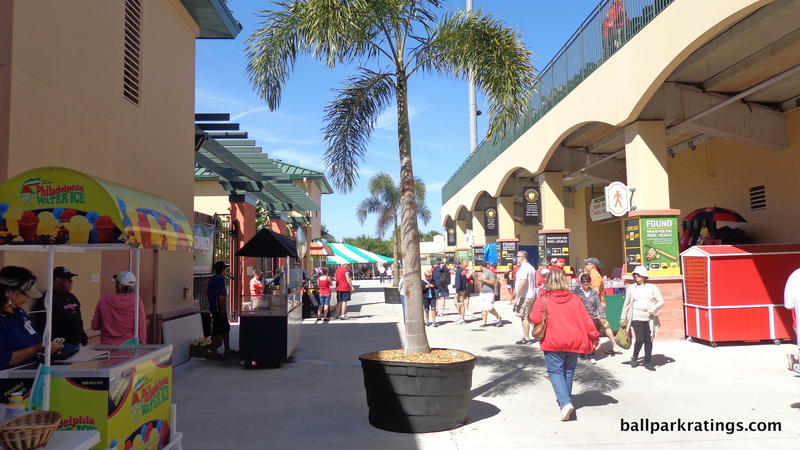 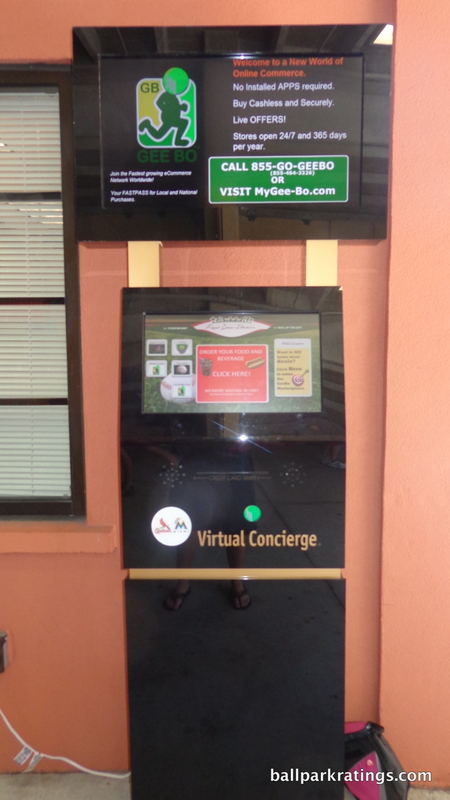 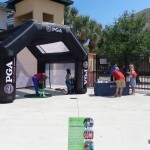 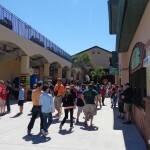 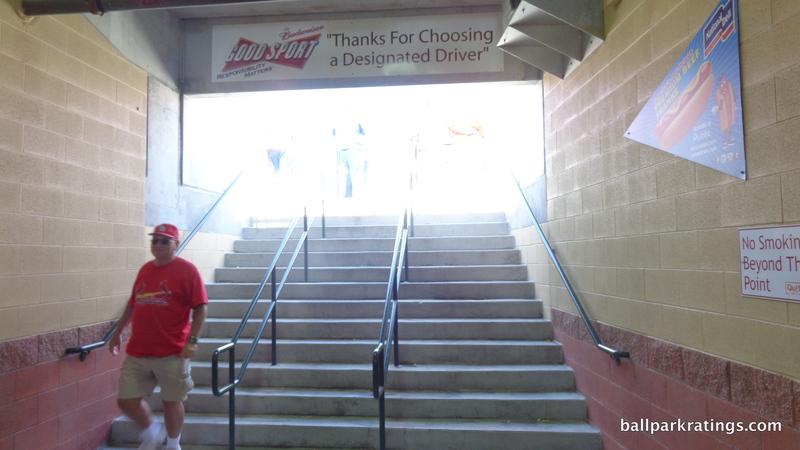 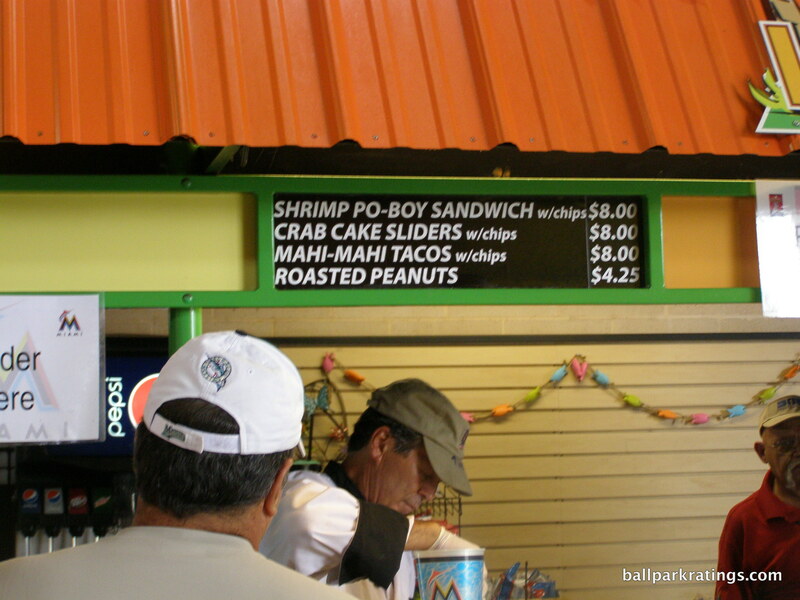 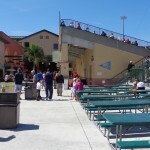 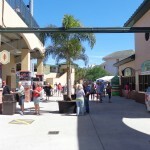 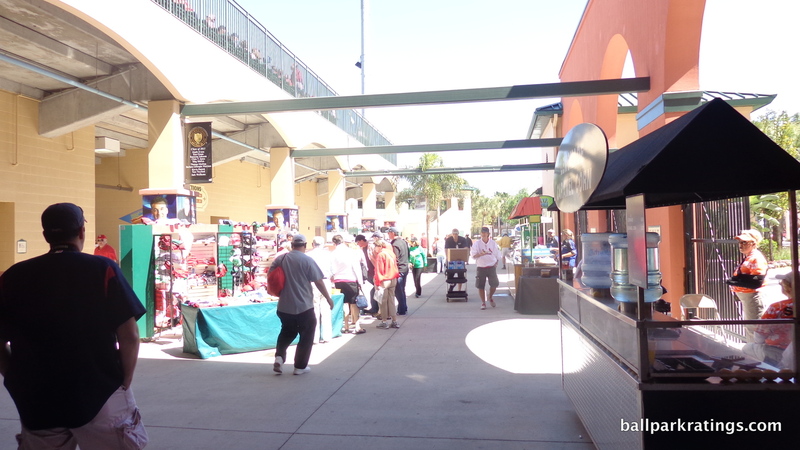 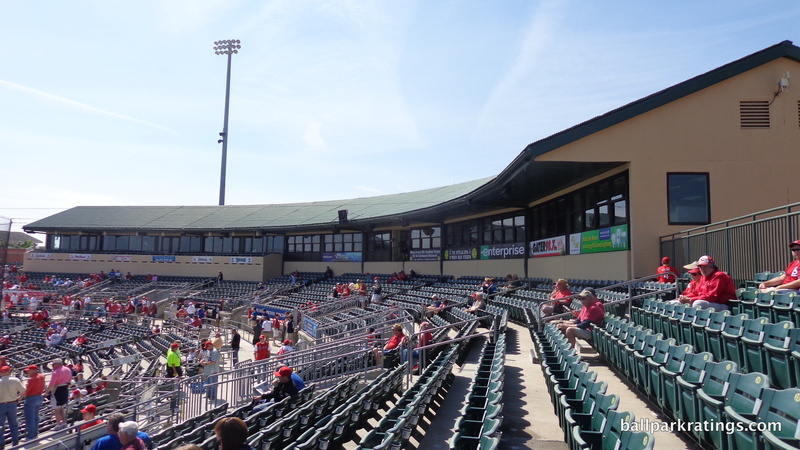 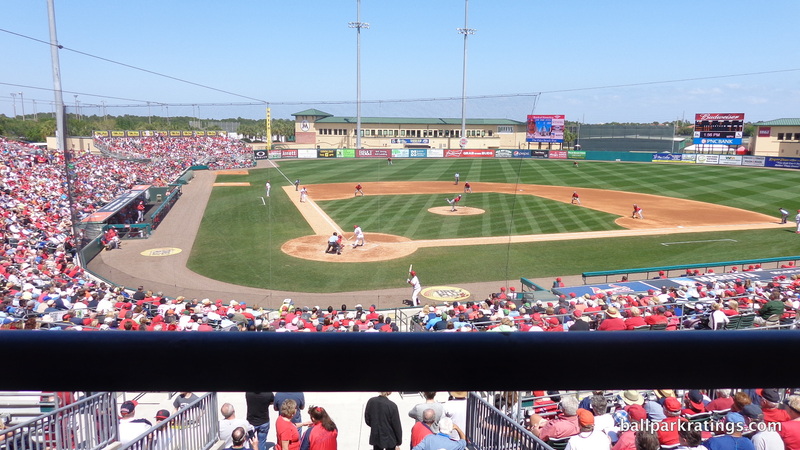 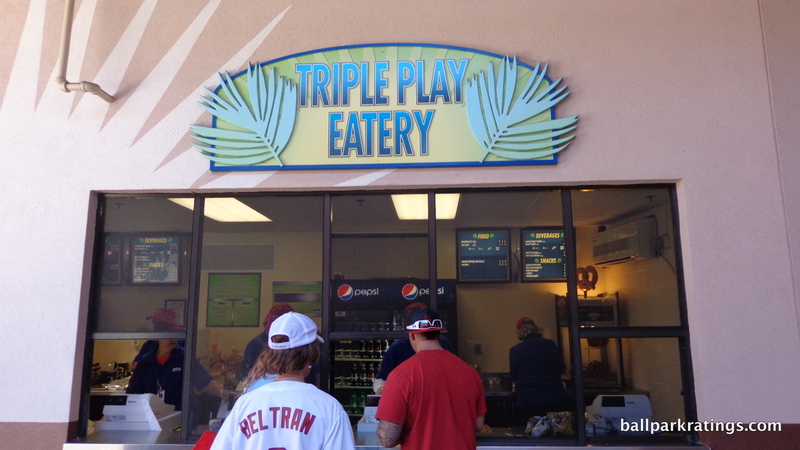 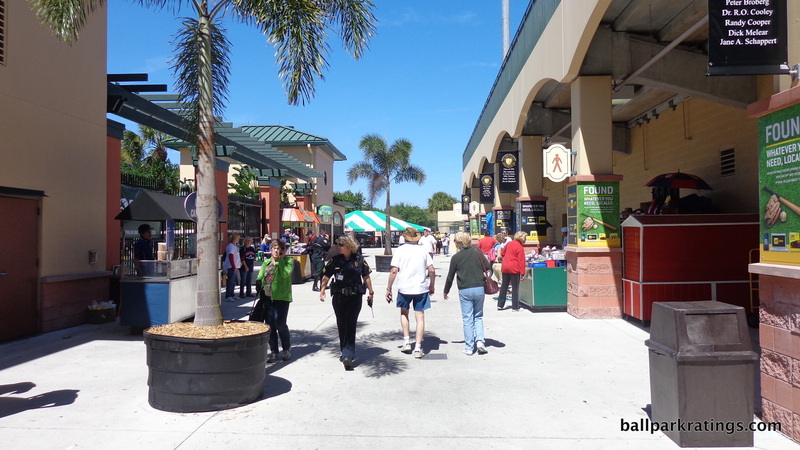 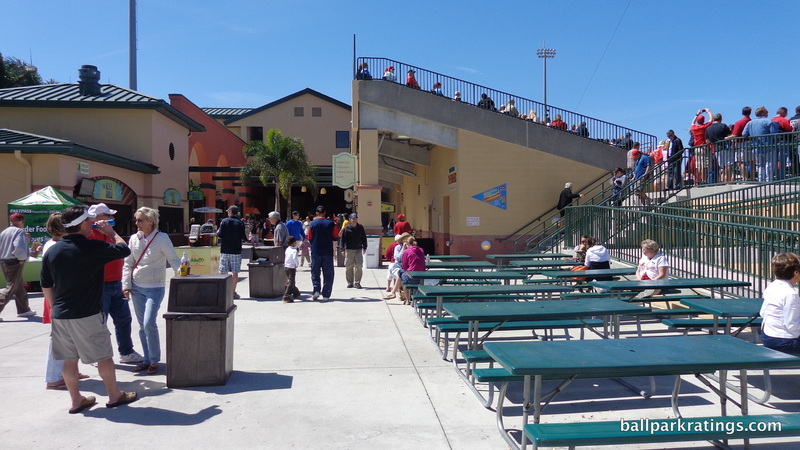 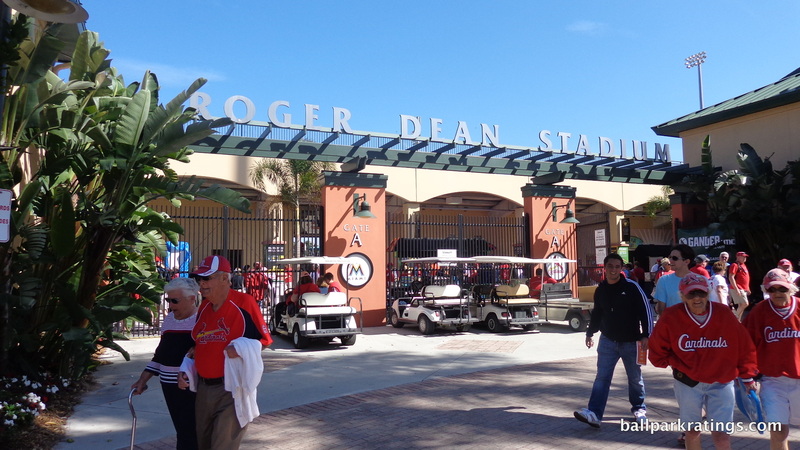 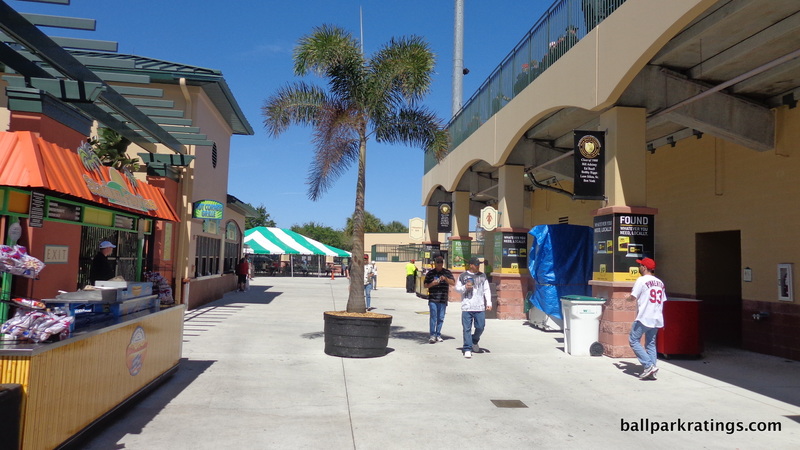 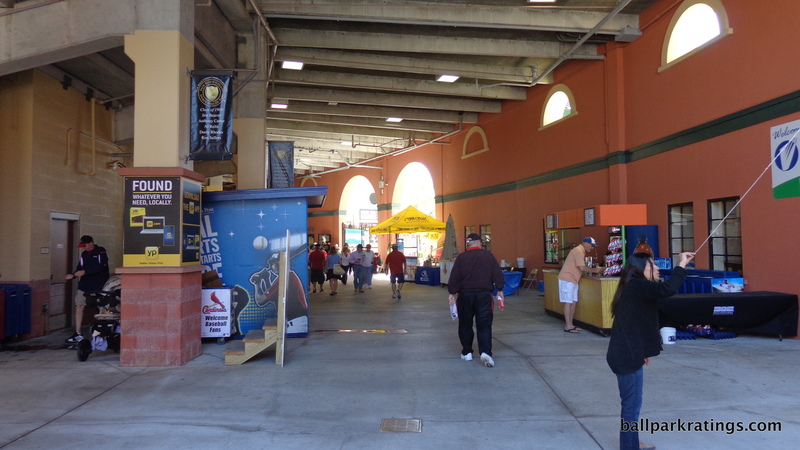 A 360-degree concourse is almost certainly necessary for Roger Dean Stadium to remain viable. 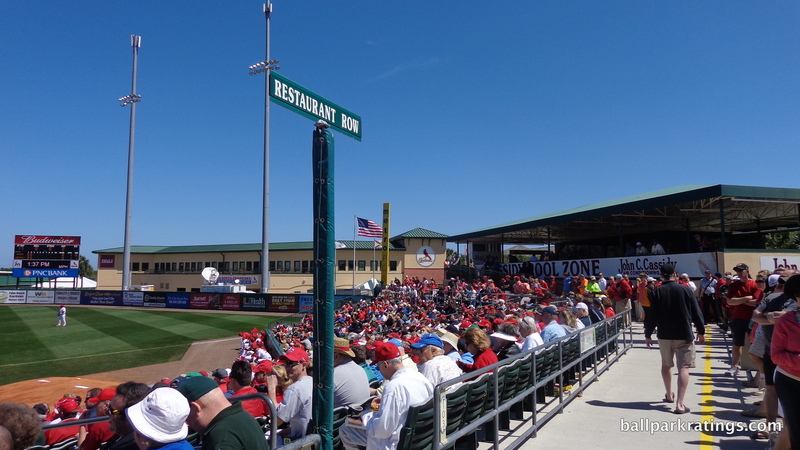 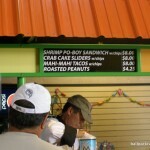 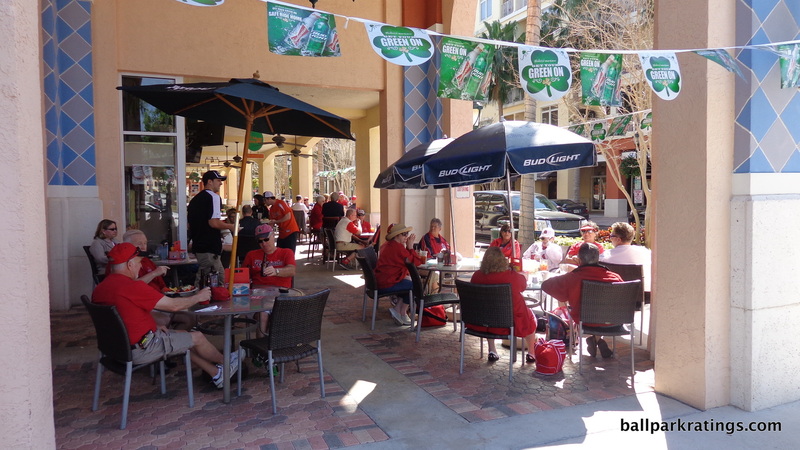 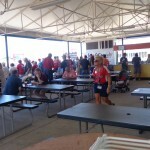 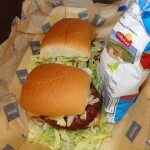 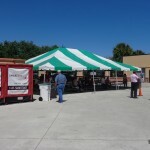 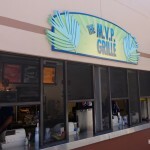 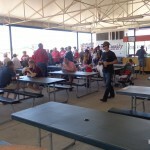 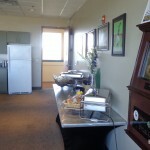 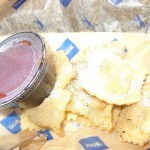 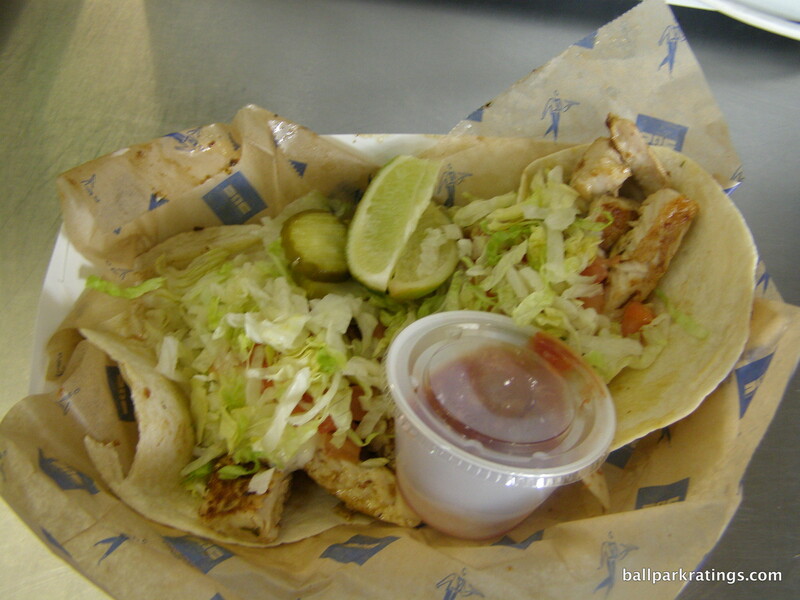 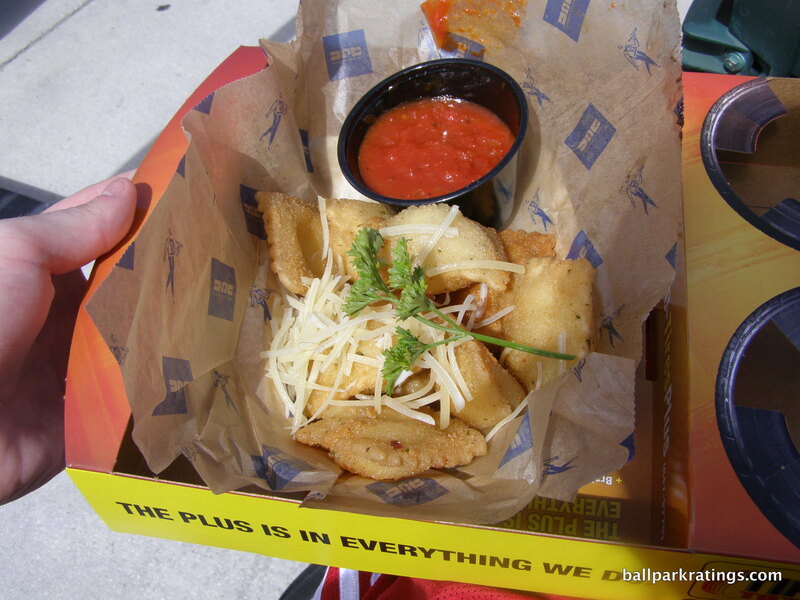 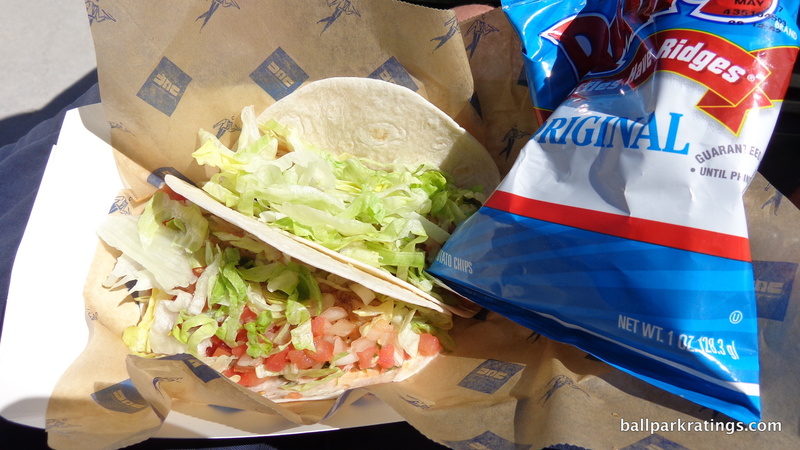 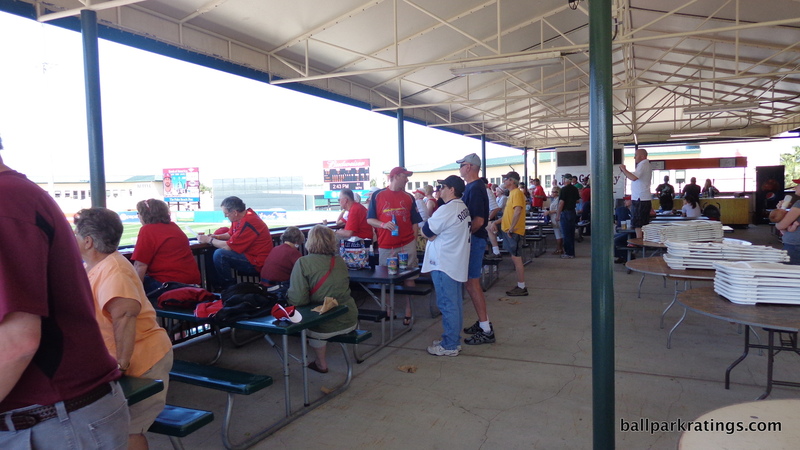 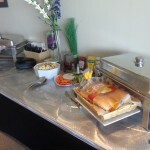 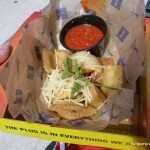 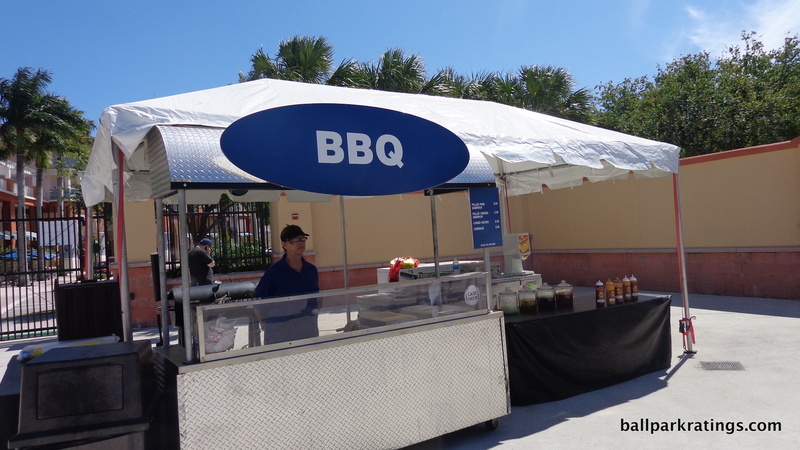 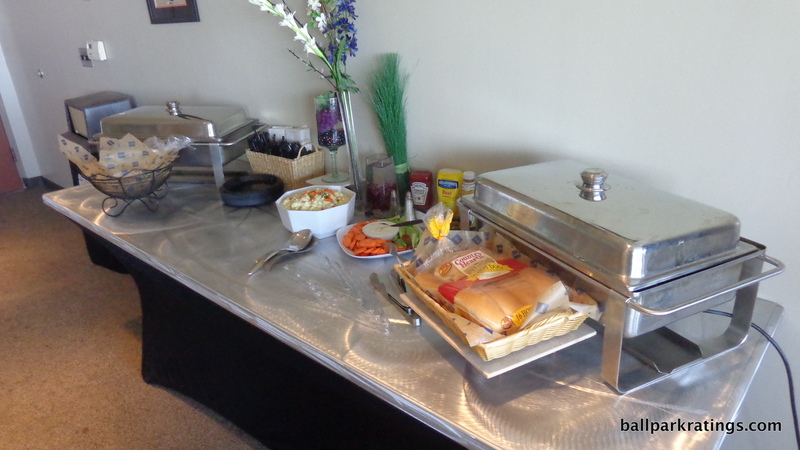 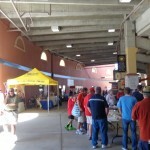 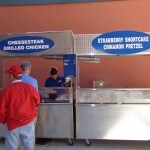 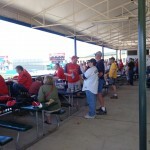 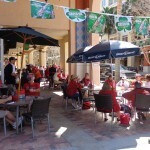 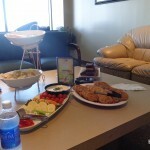 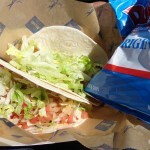 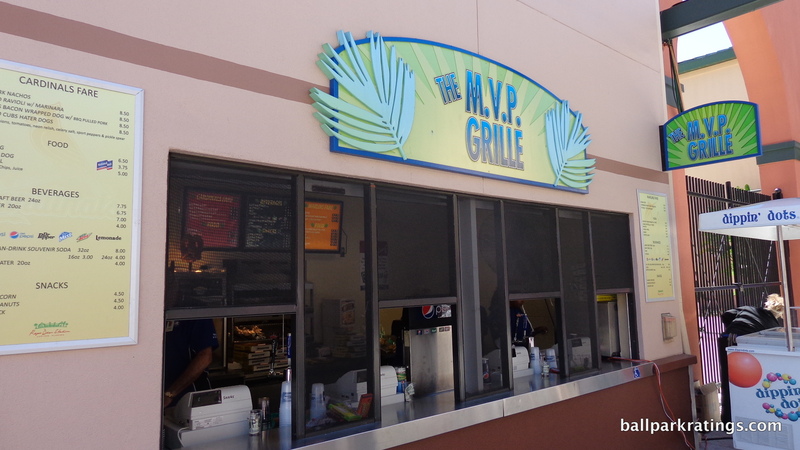 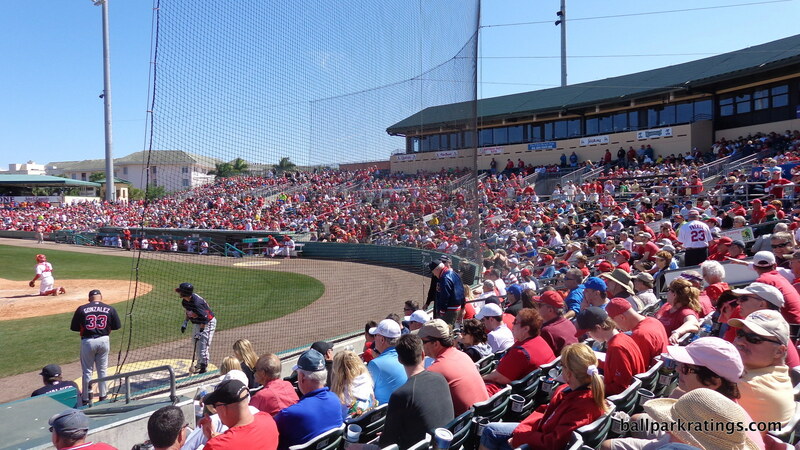 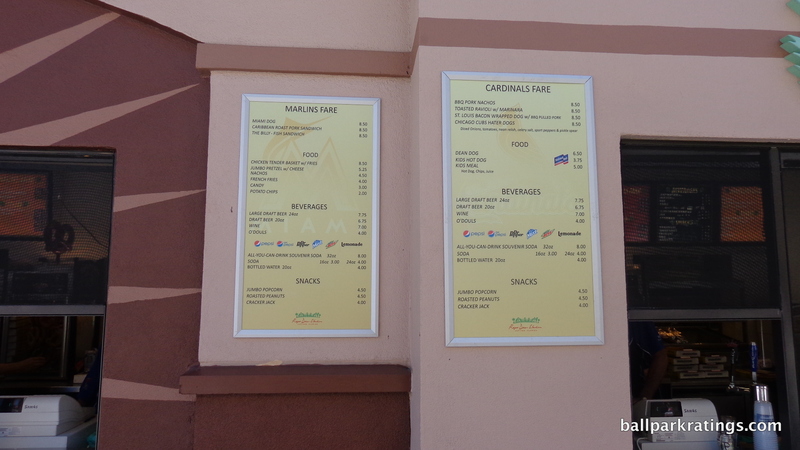 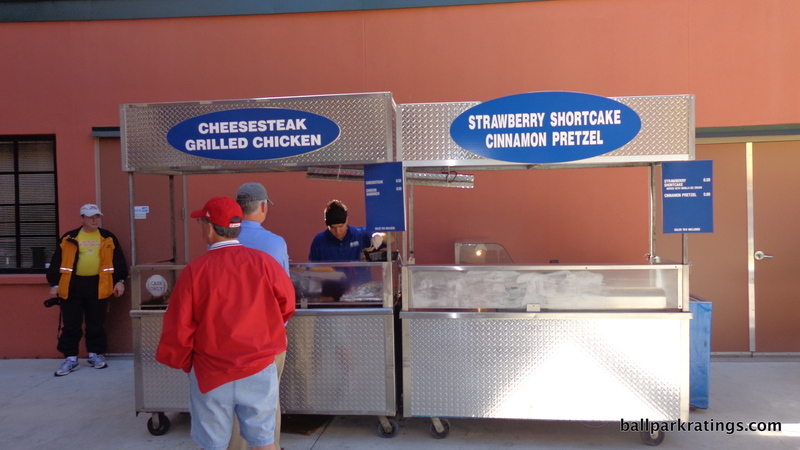 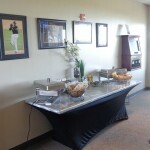 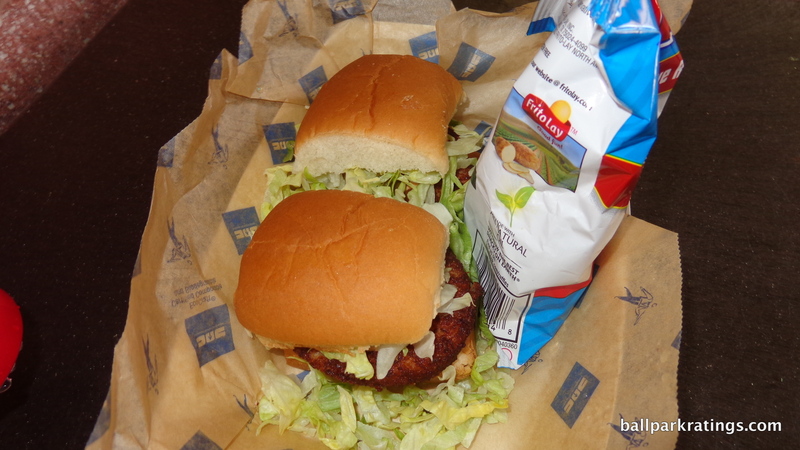 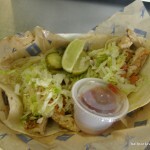 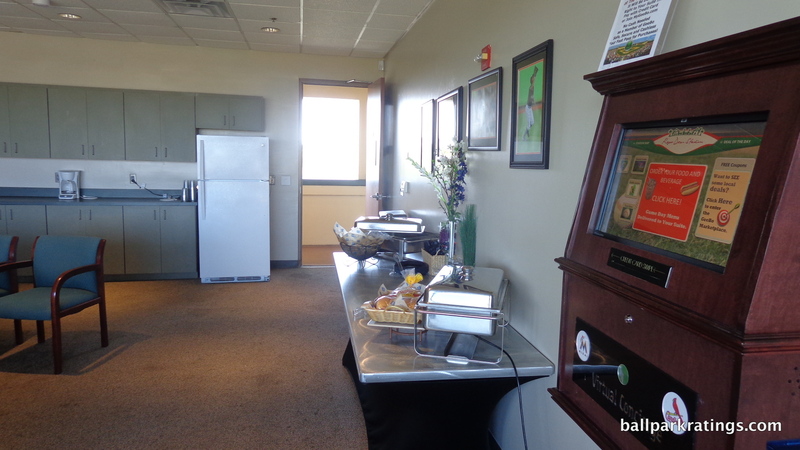 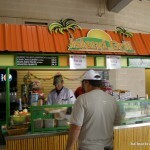 One reason to keep the ballpark around is its local scene and location, arguably the best in all of spring training. 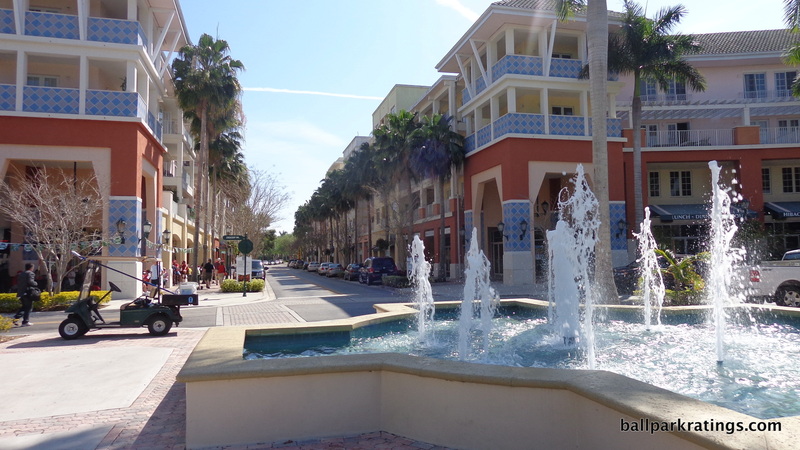 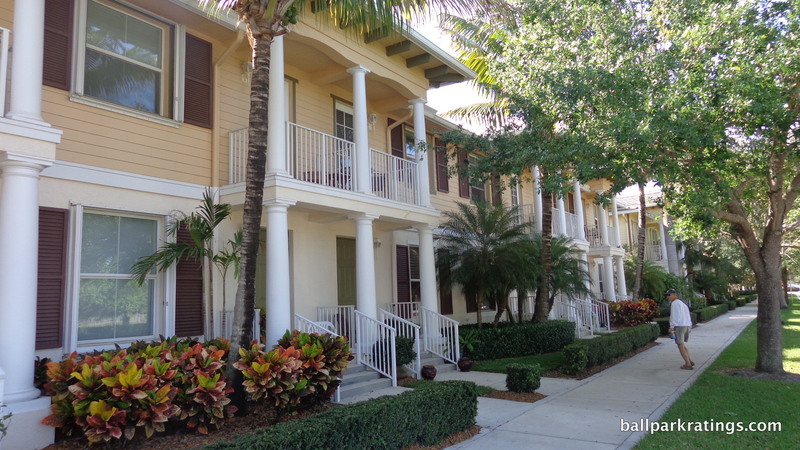 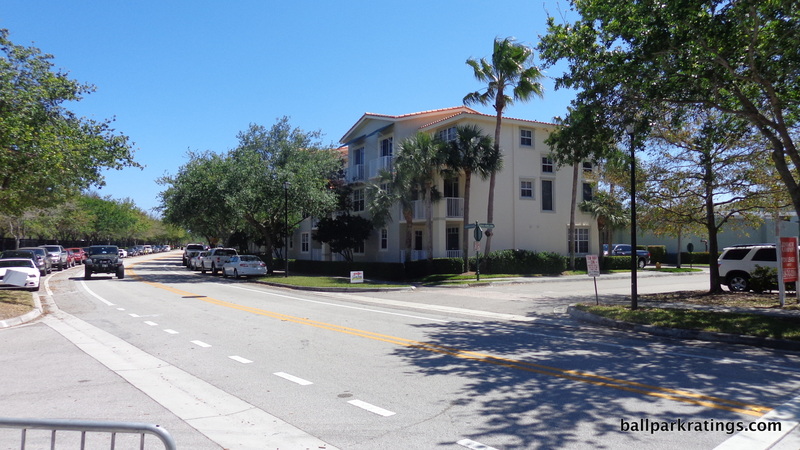 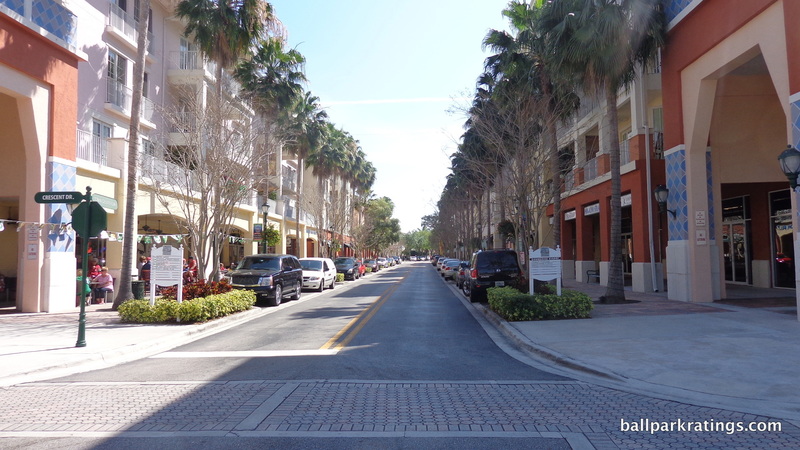 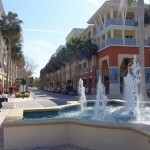 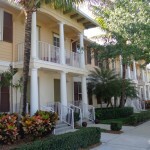 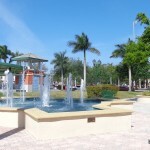 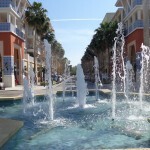 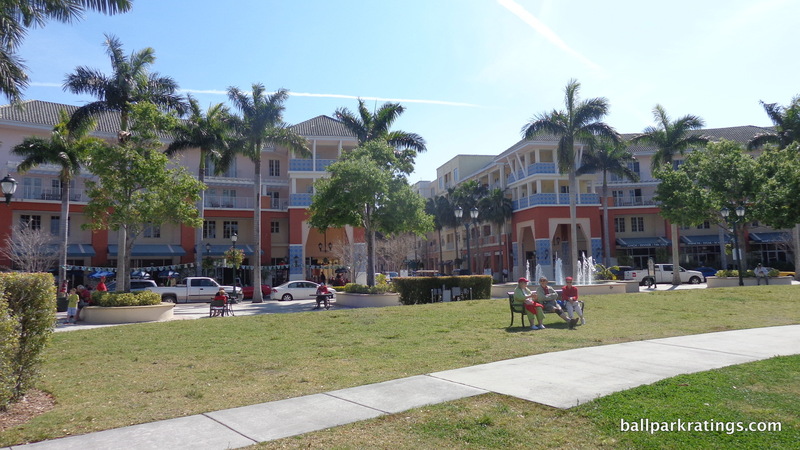 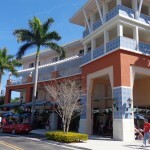 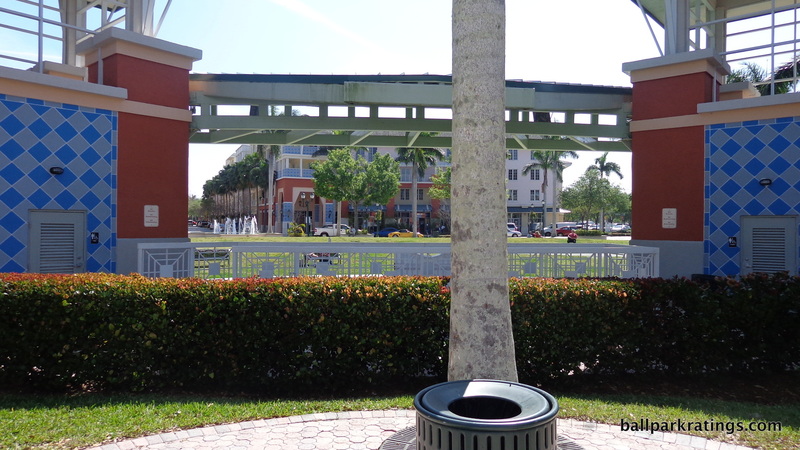 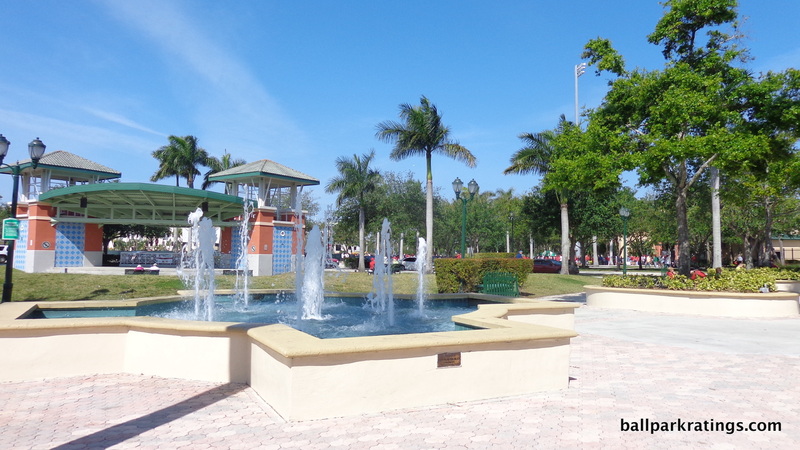 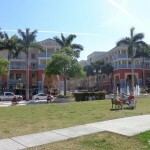 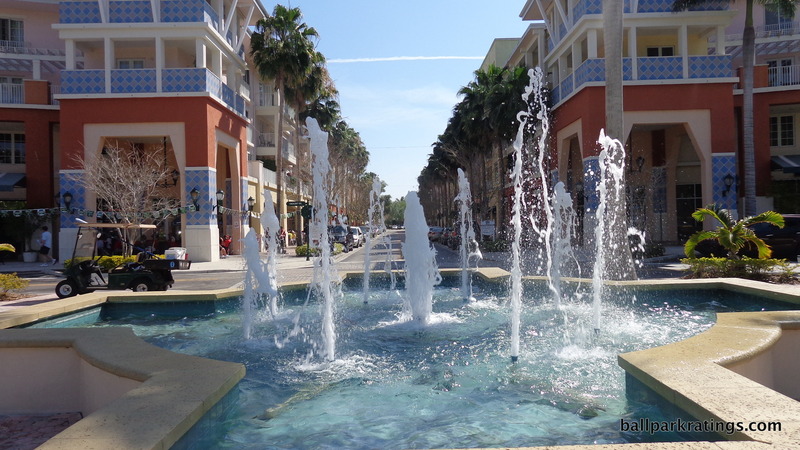 Few other parks are rooted in a vibrant mixed-use development community like Abacoa, one of the first examples of the New Urbanism movement in Florida. 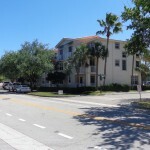 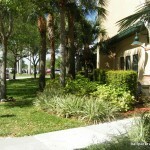 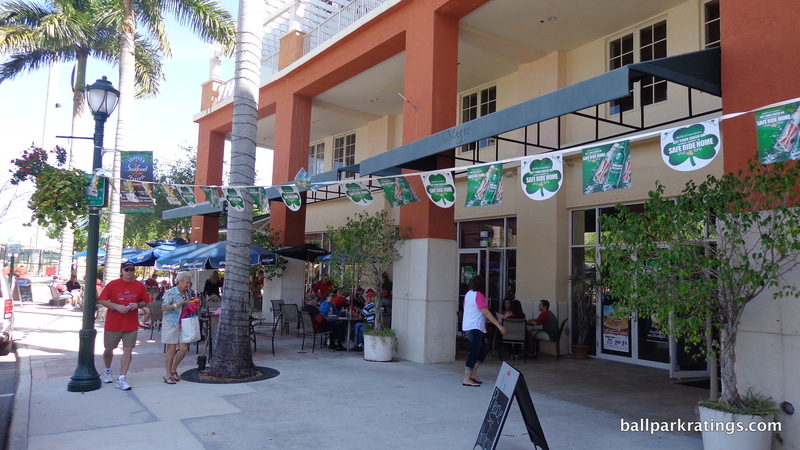 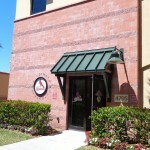 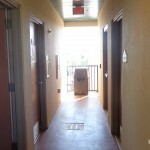 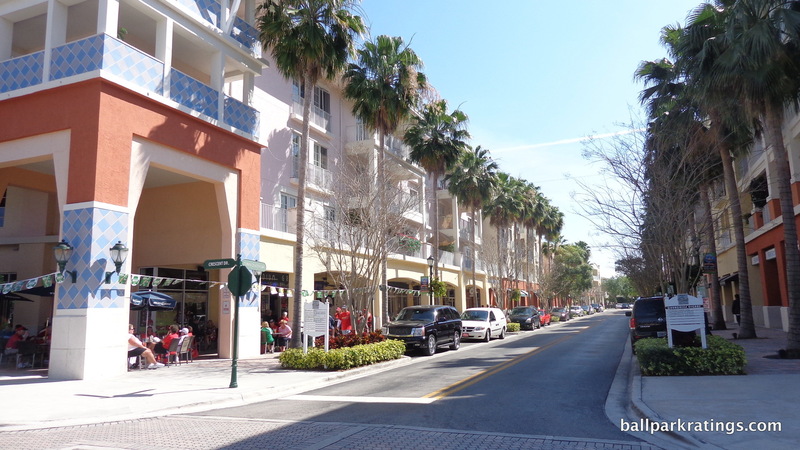 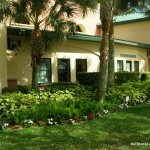 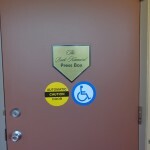 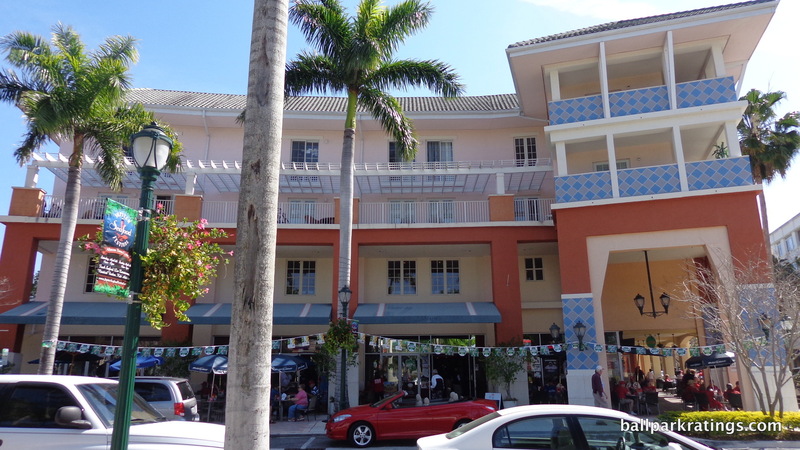 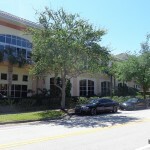 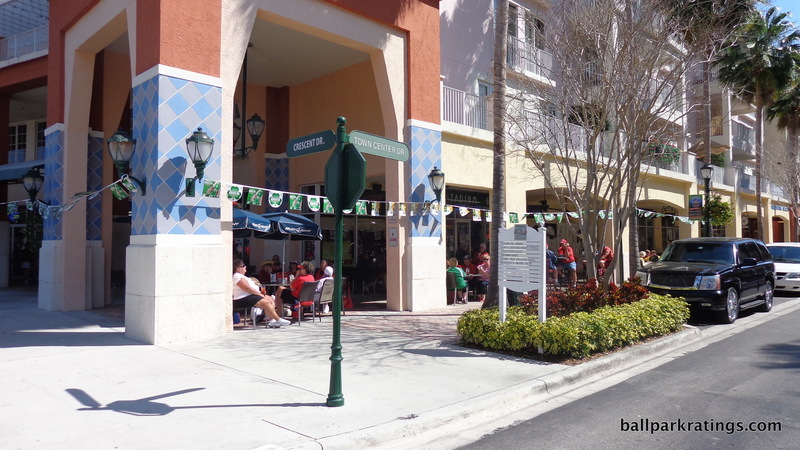 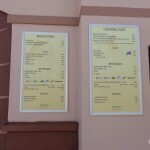 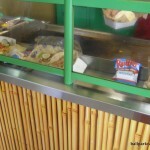 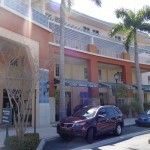 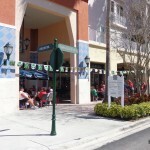 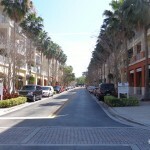 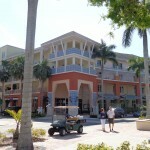 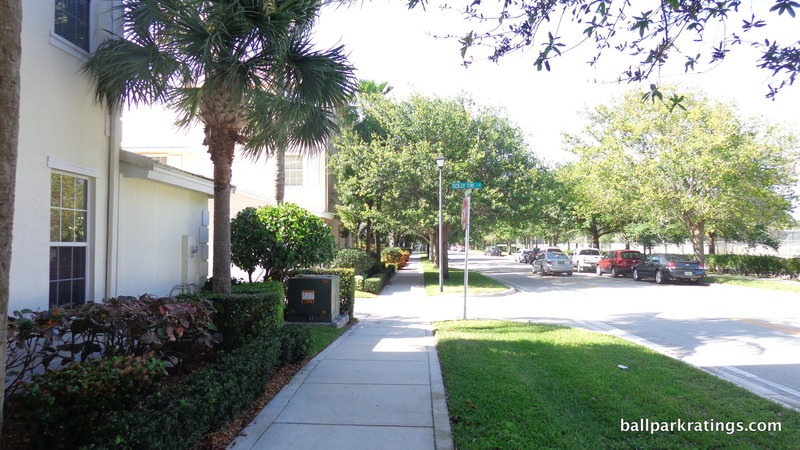 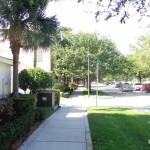 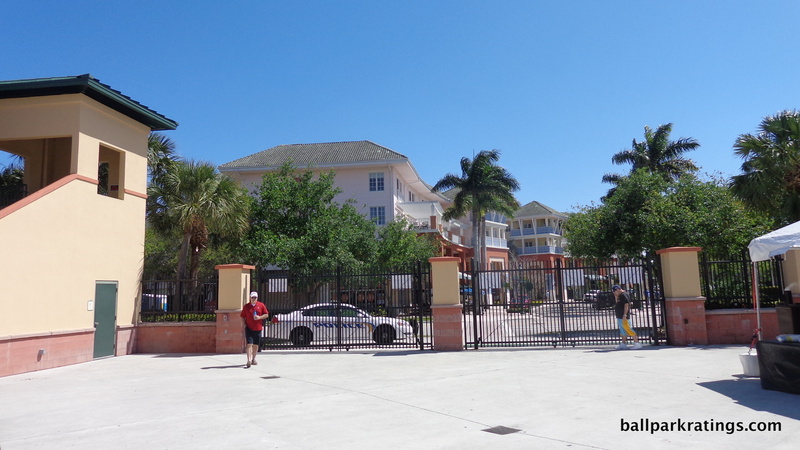 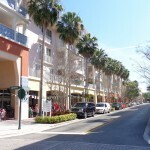 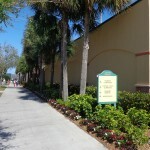 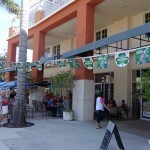 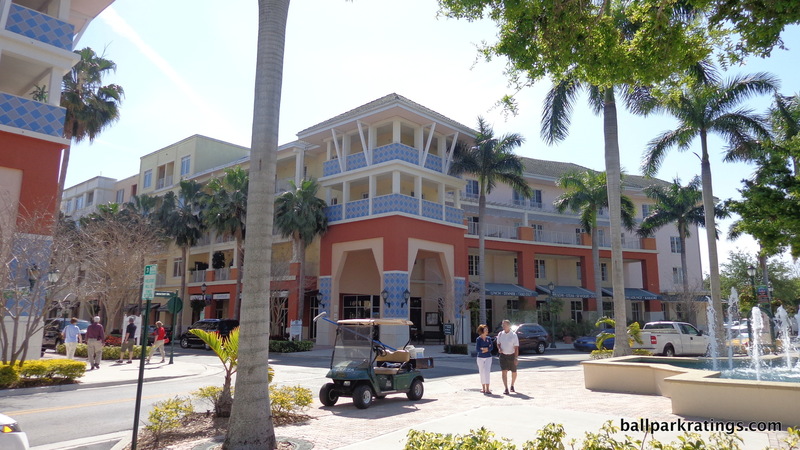 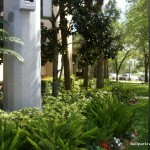 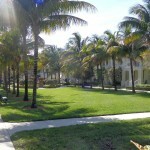 There are plenty of shops, restaurants, bars, and condos in the area. 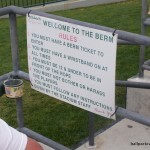 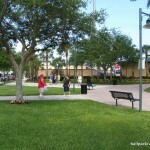 A community makes a ballpark timeless, and I hope that’s true here. 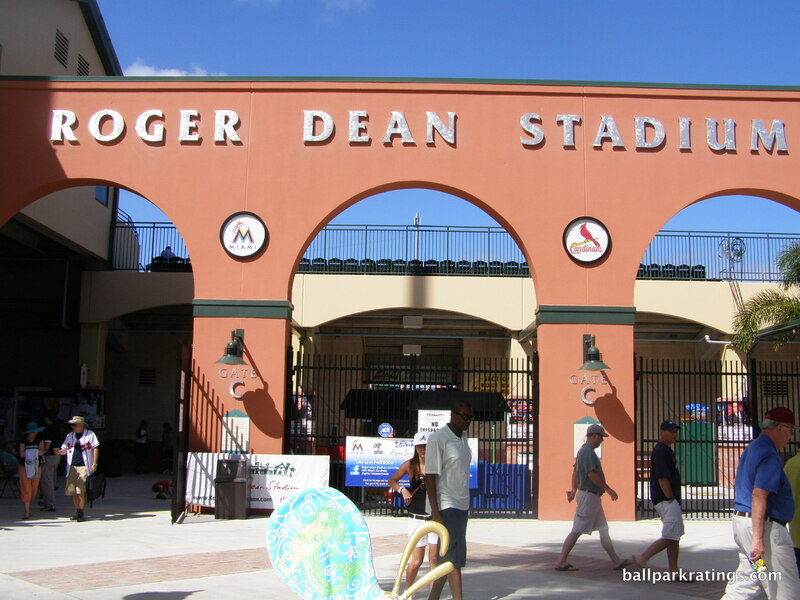 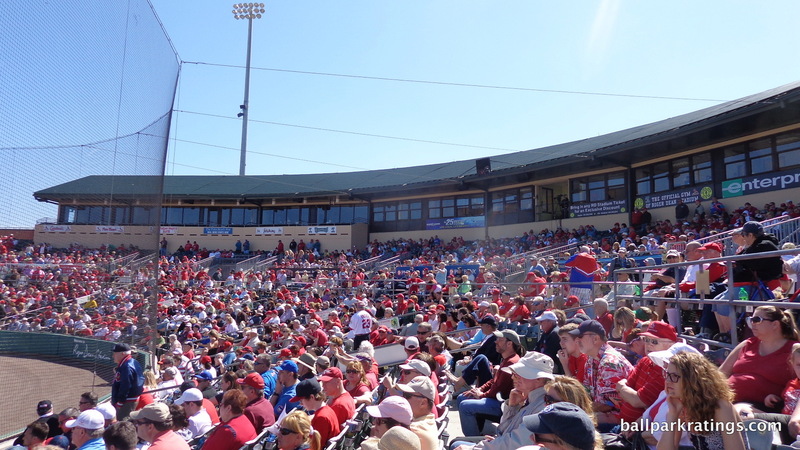 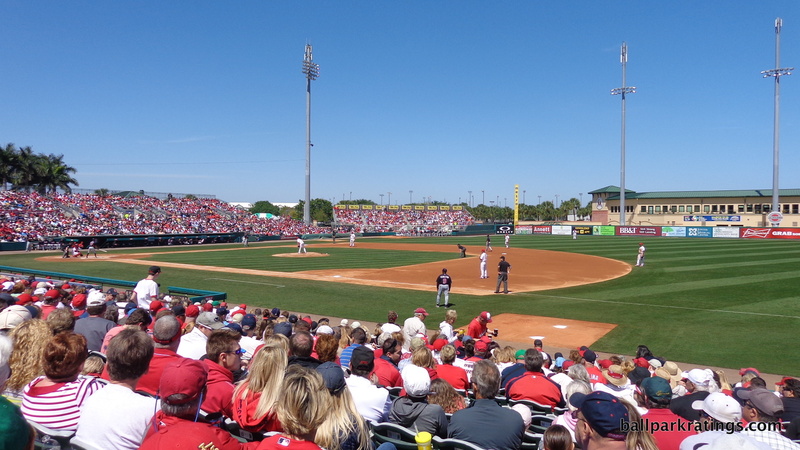 As it stands now, Roger Dean Stadium is a nice place to see spring training baseball, but one that ranks in the lower tier around baseball, believe it or not (look at how far we’ve come!). 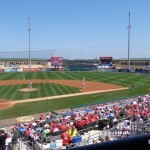 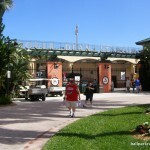 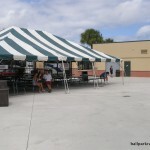 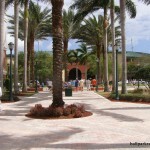 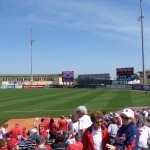 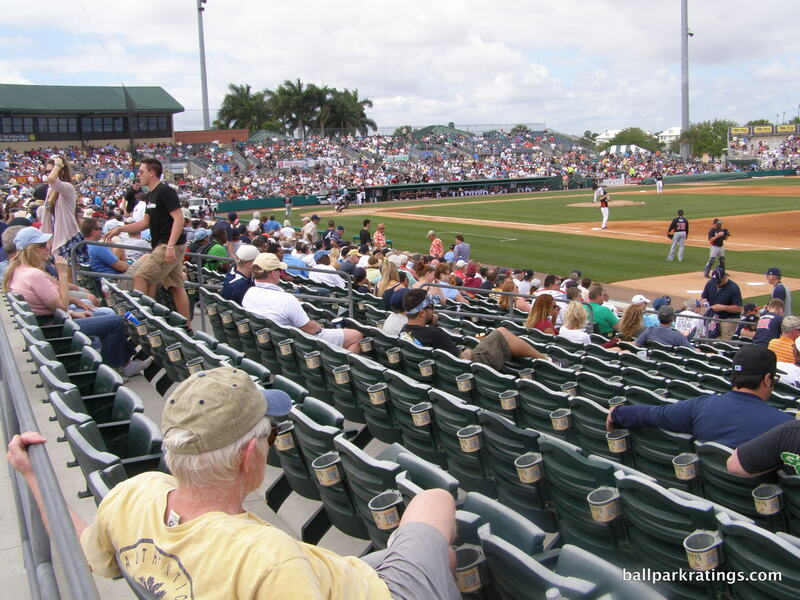 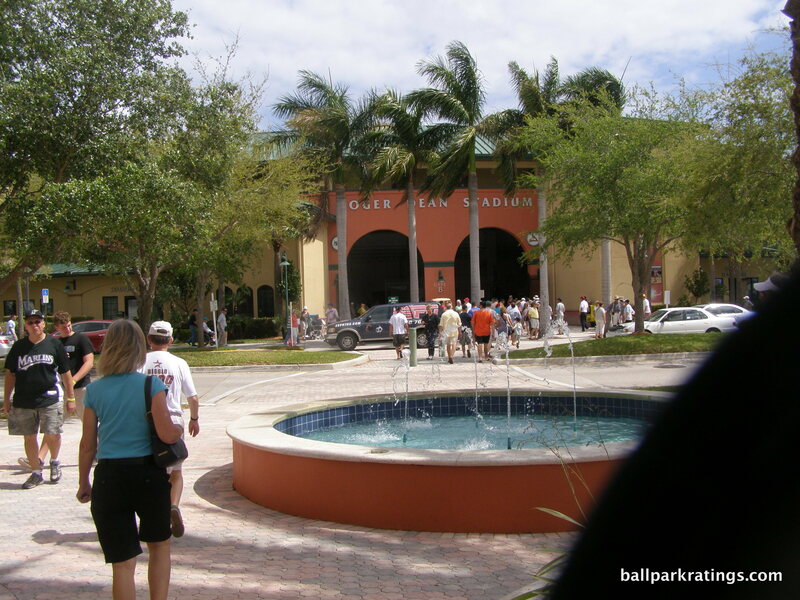 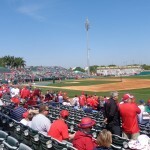 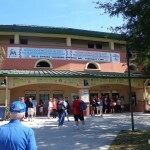 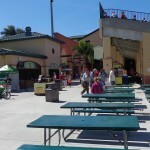 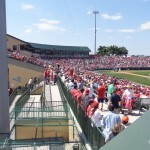 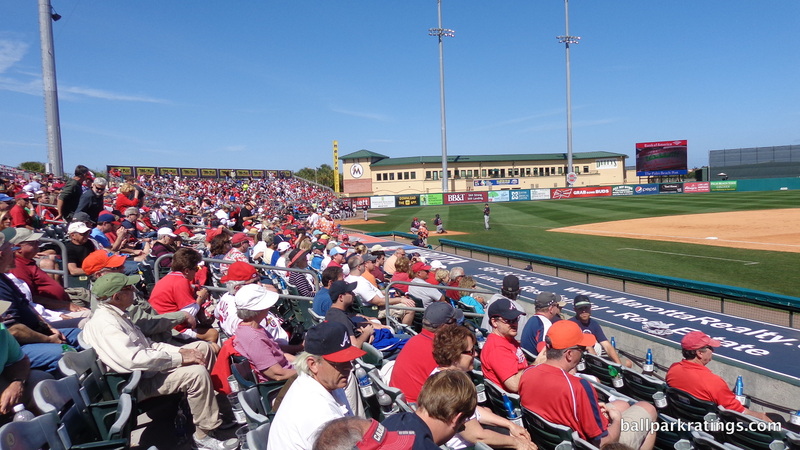 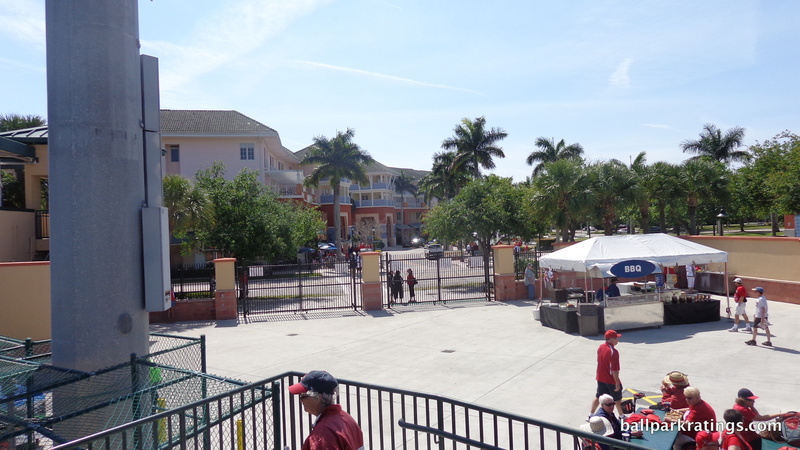 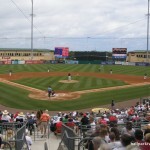 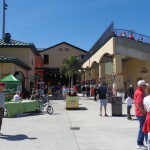 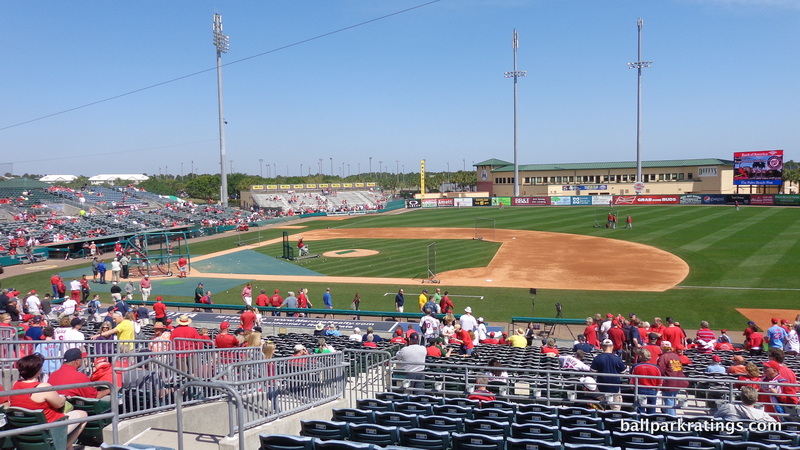 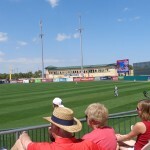 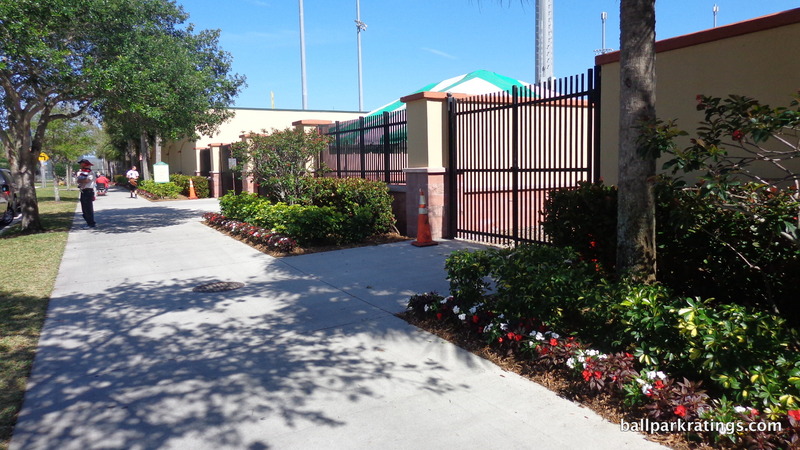 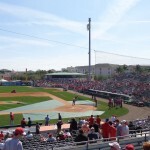 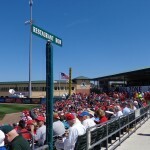 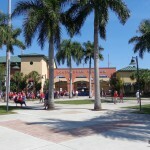 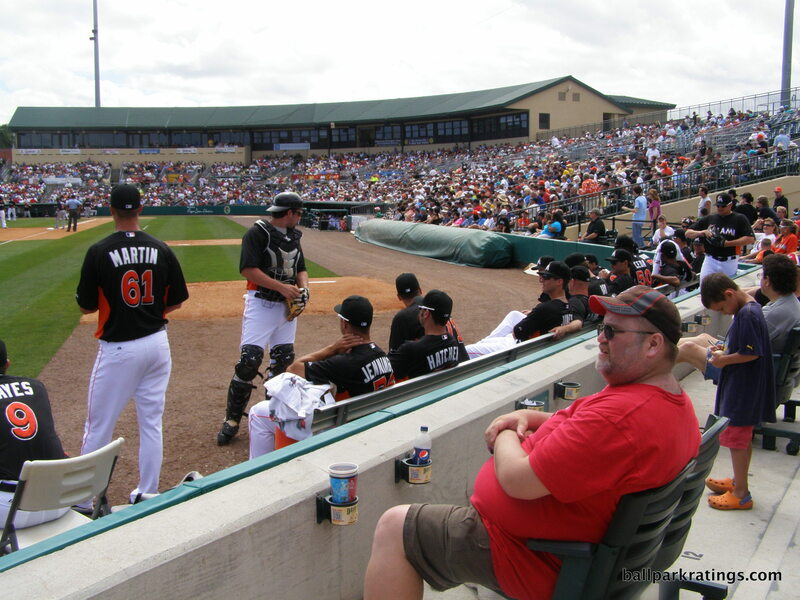 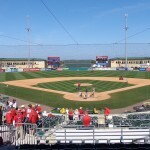 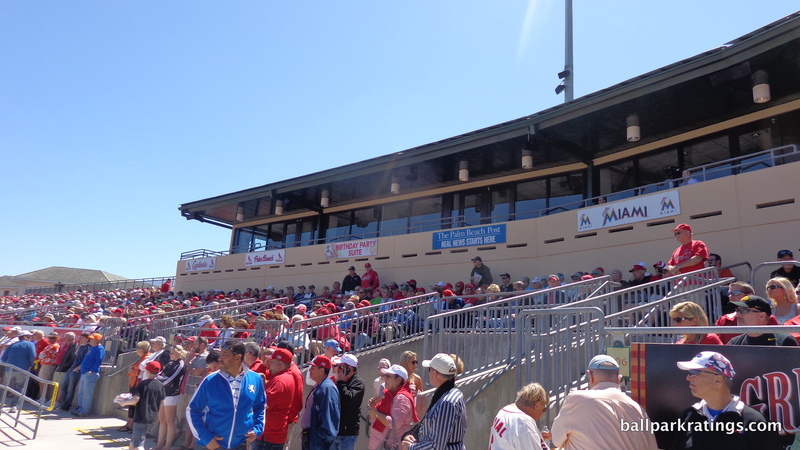 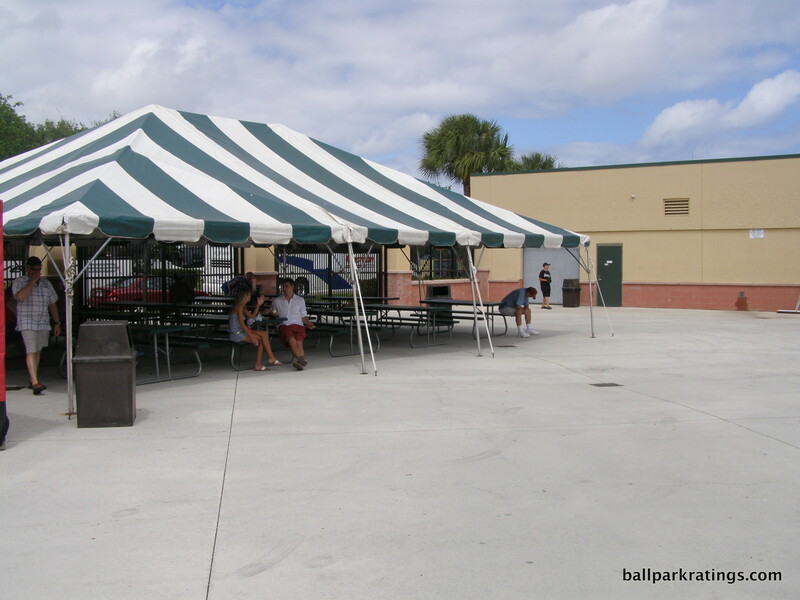 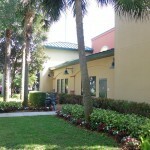 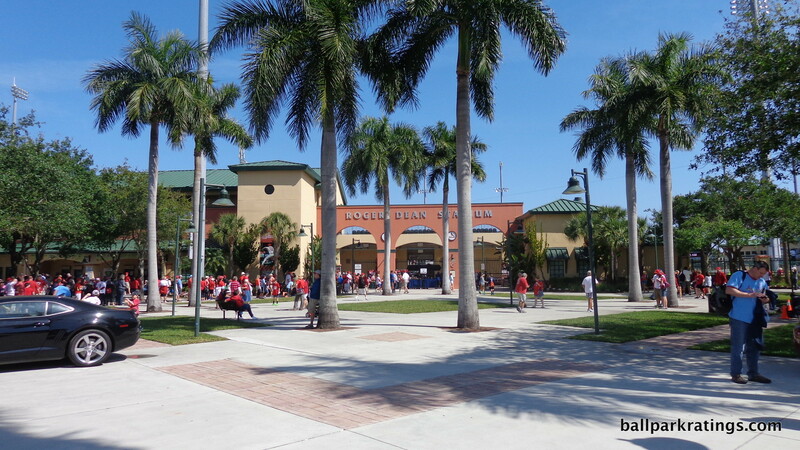 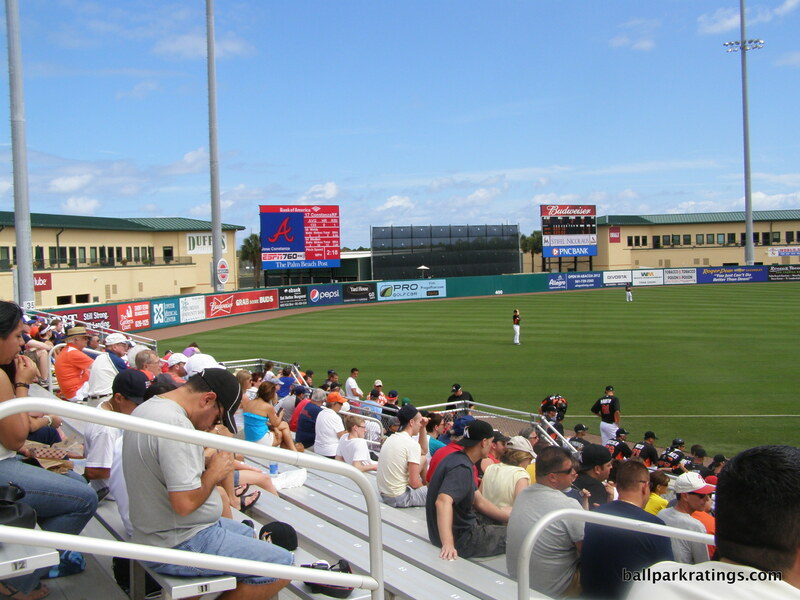 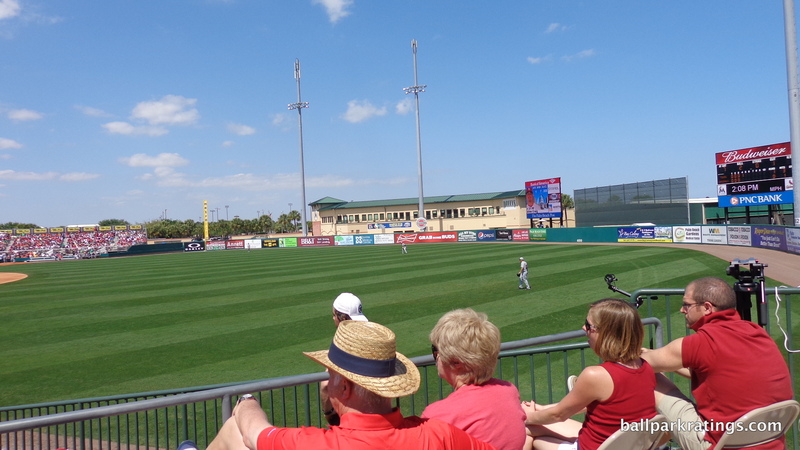 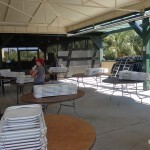 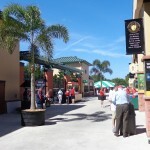 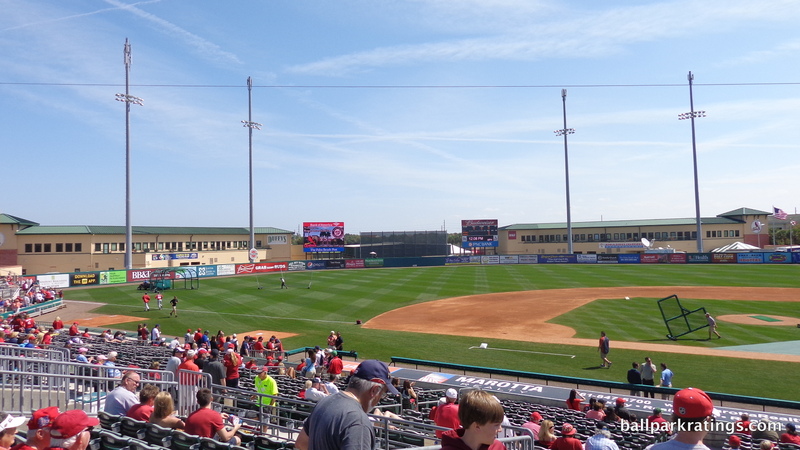 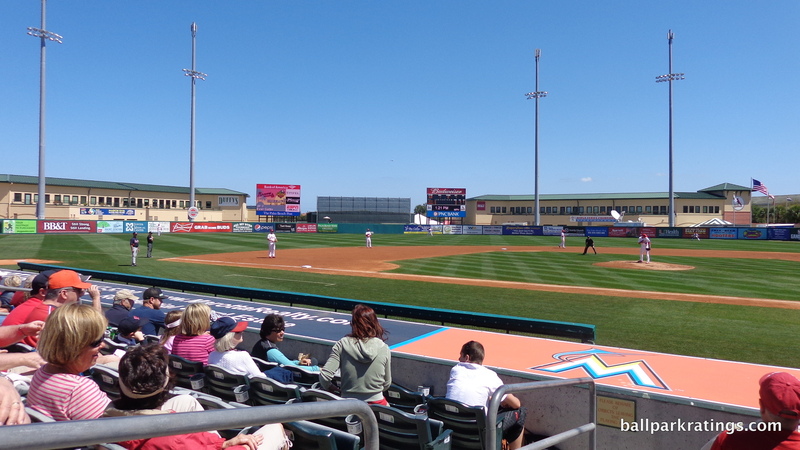 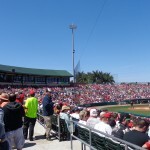 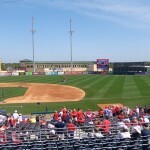 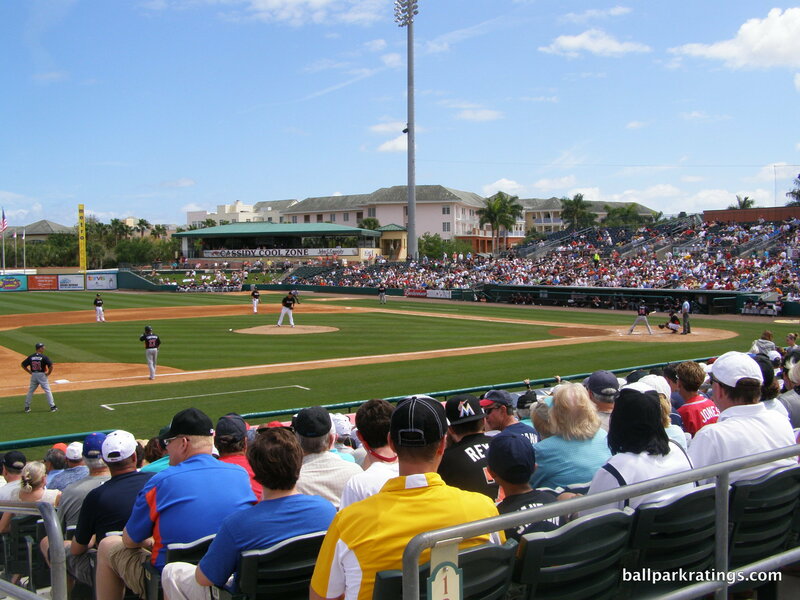 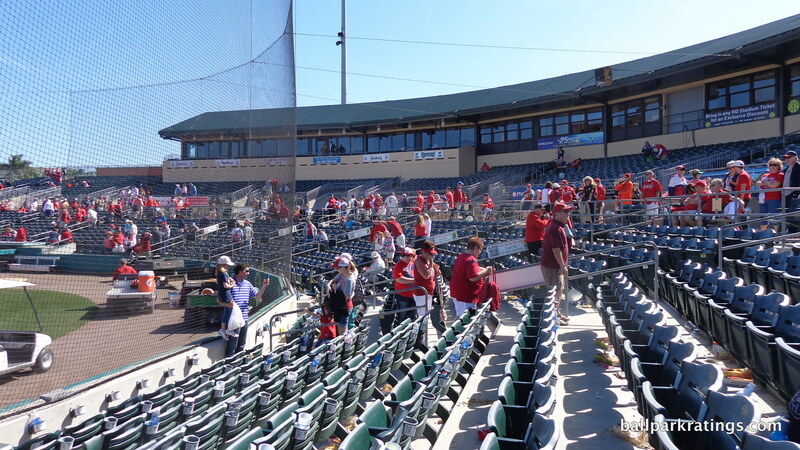 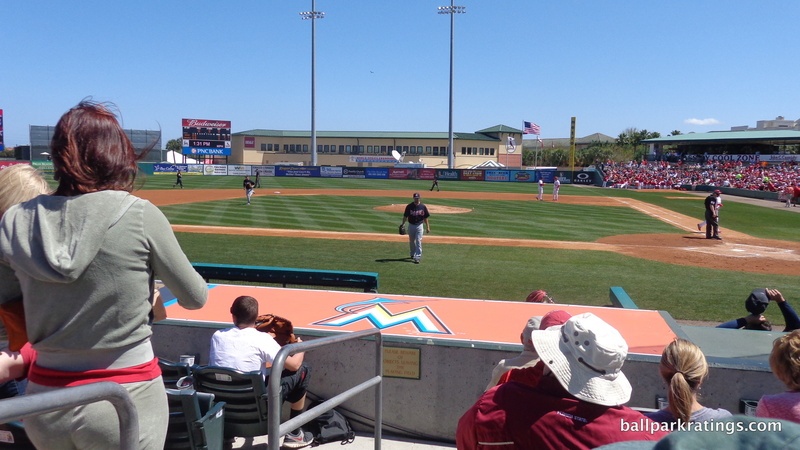 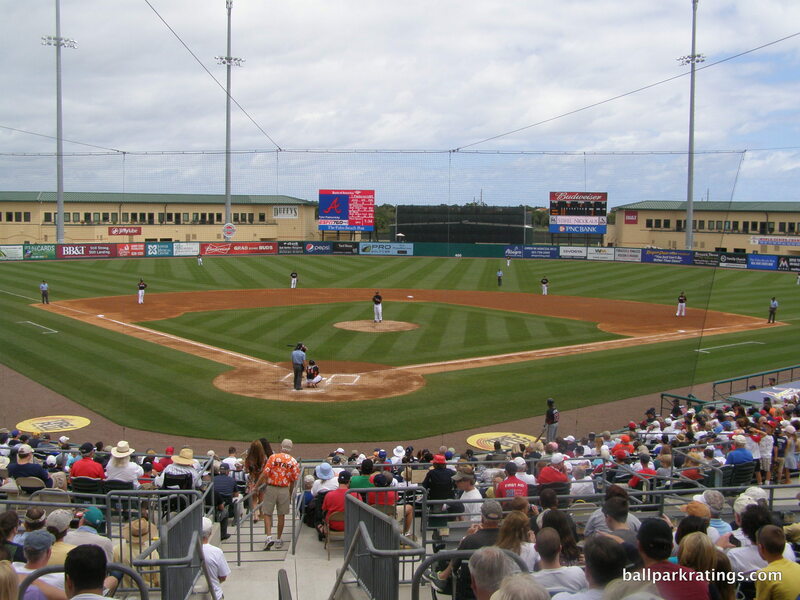 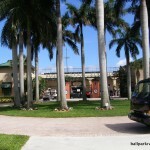 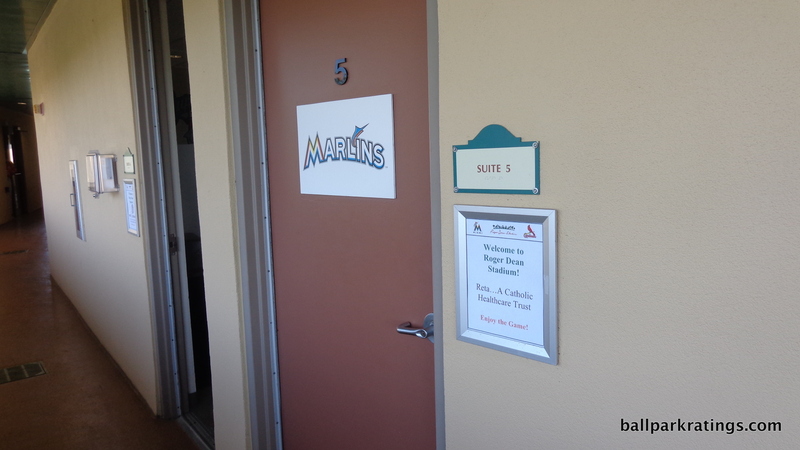 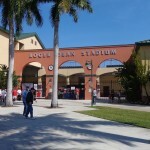 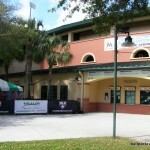 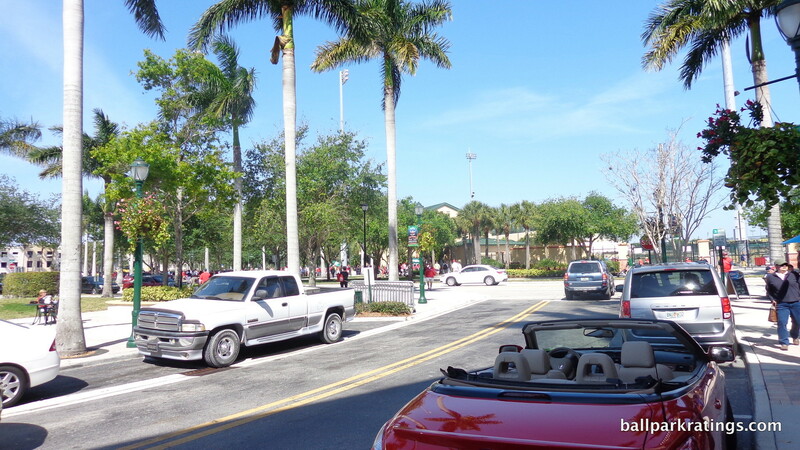 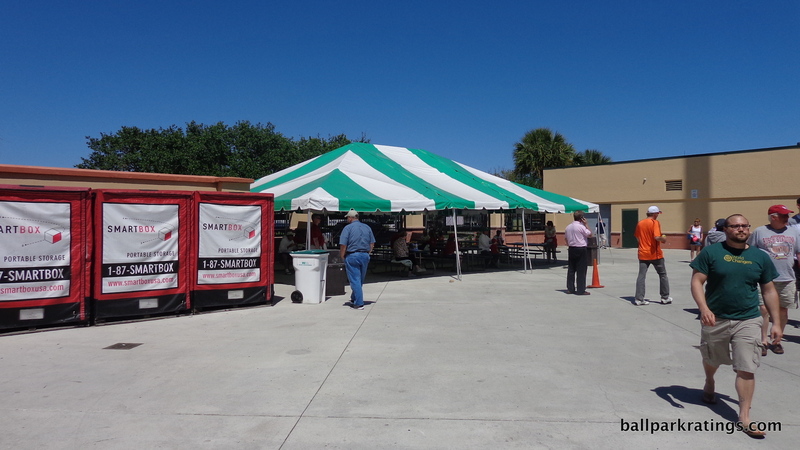 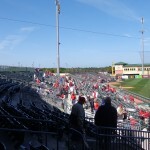 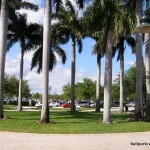 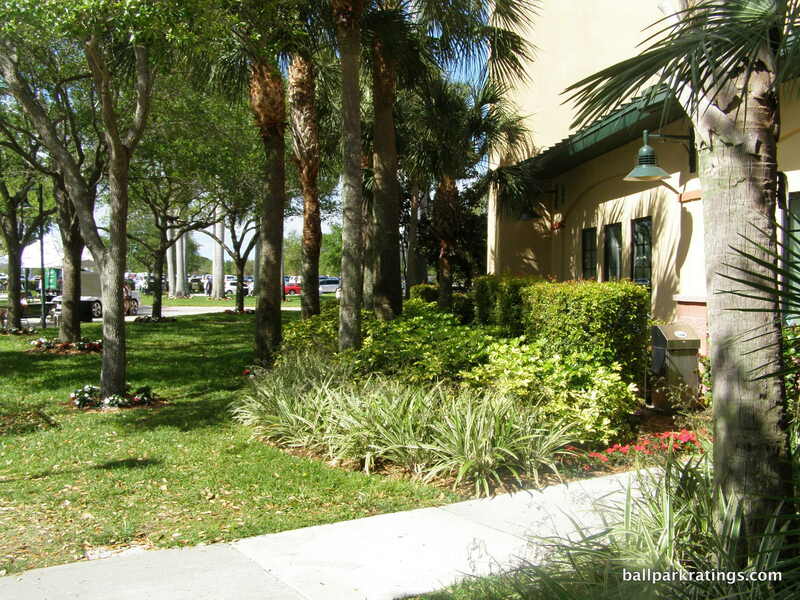 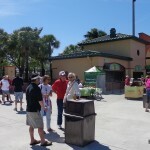 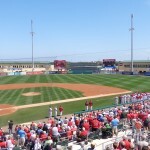 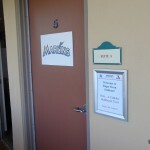 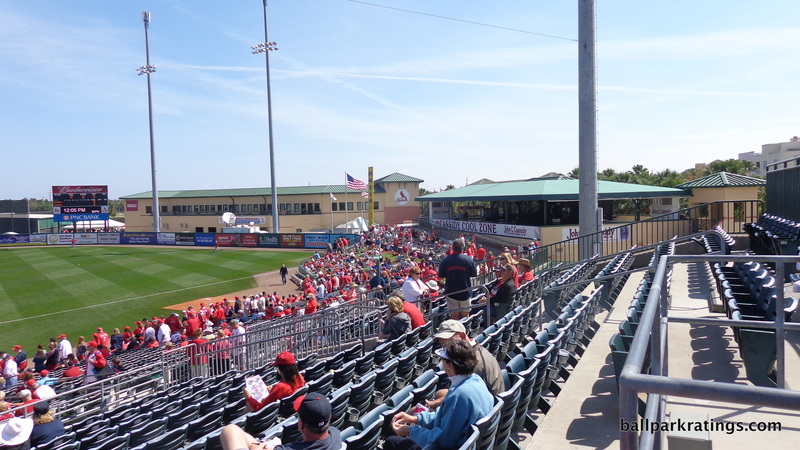 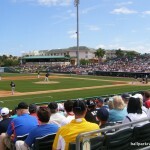 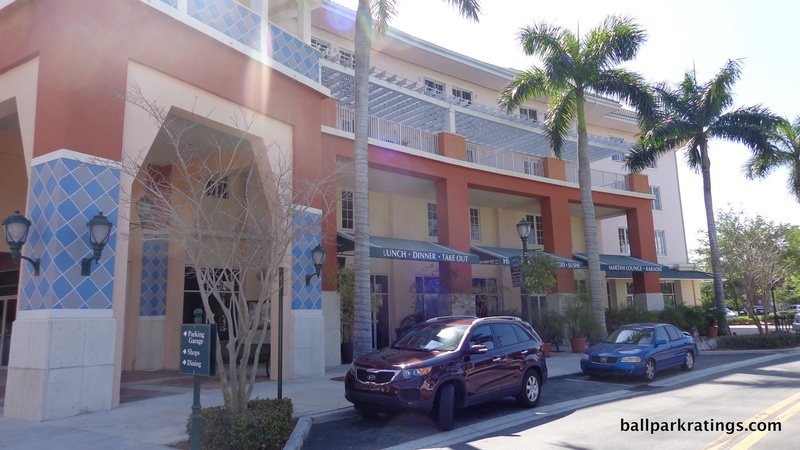 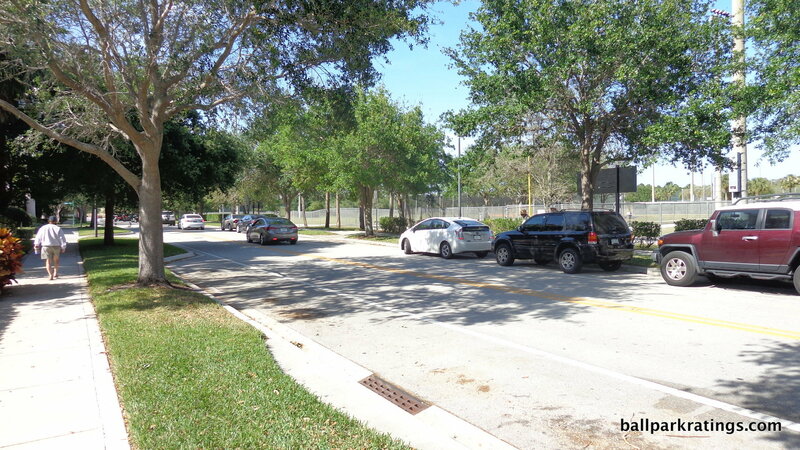 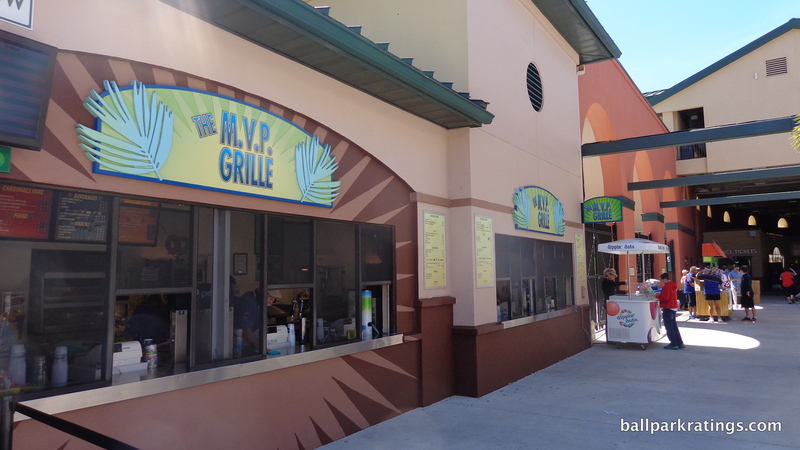 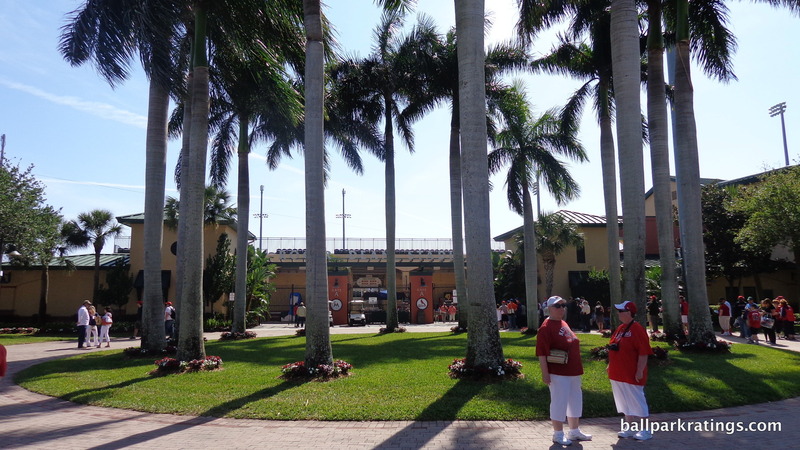 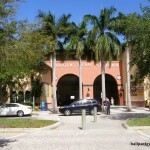 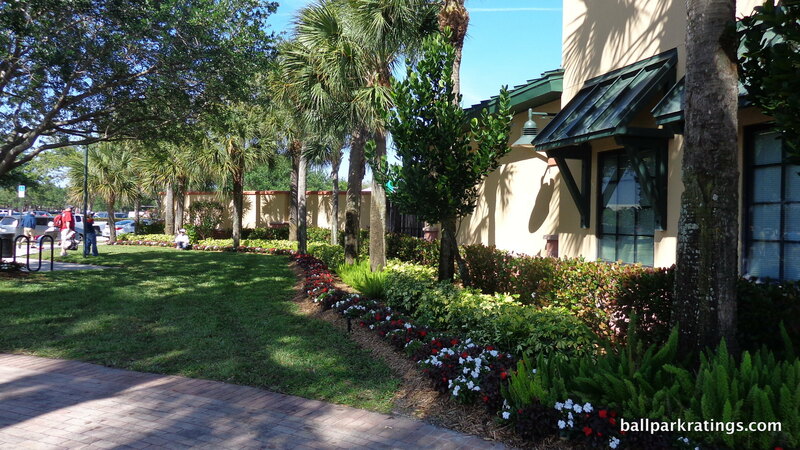 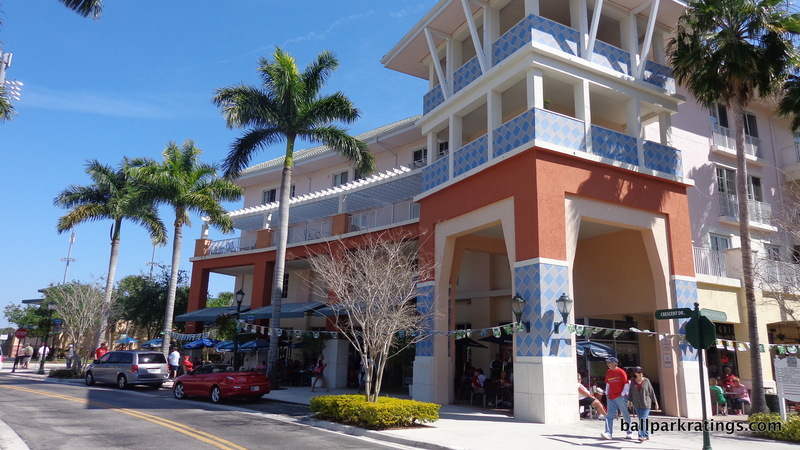 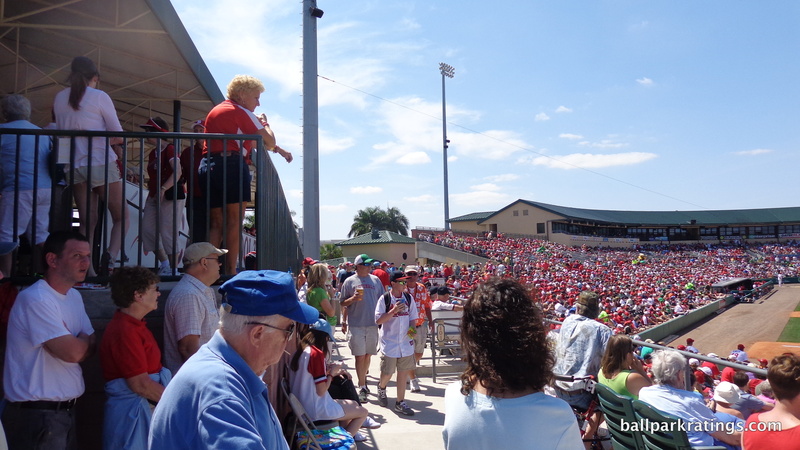 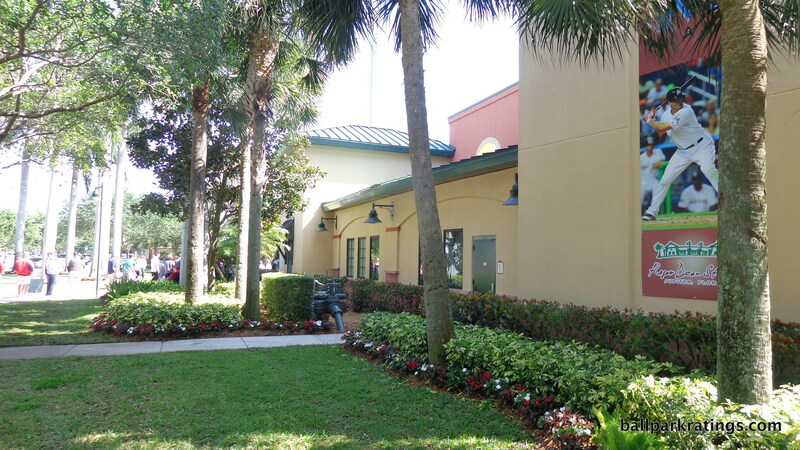 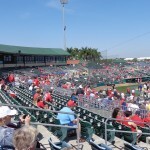 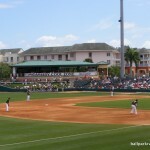 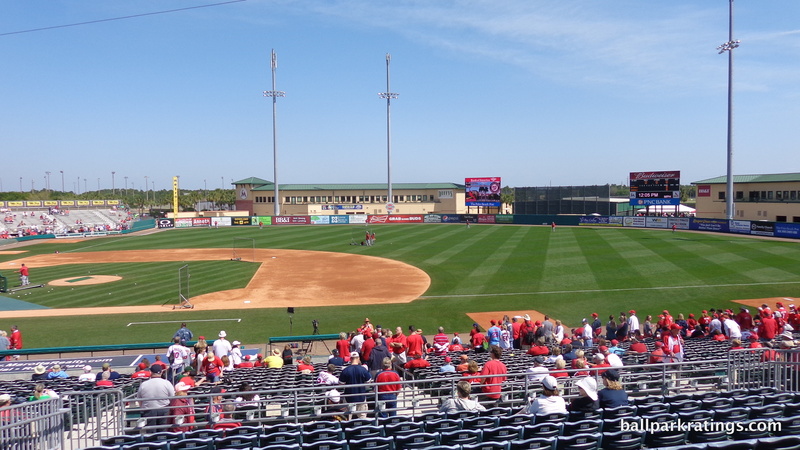 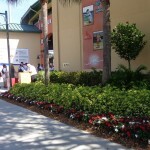 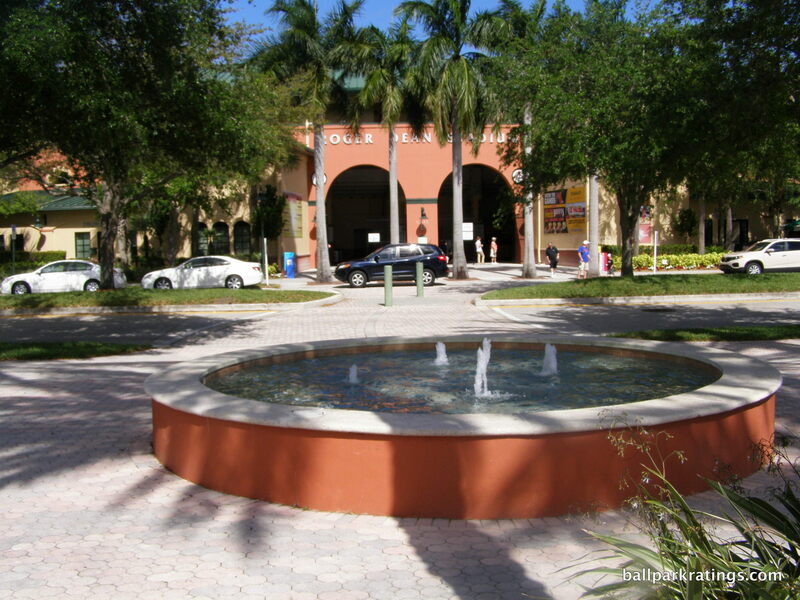 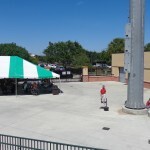 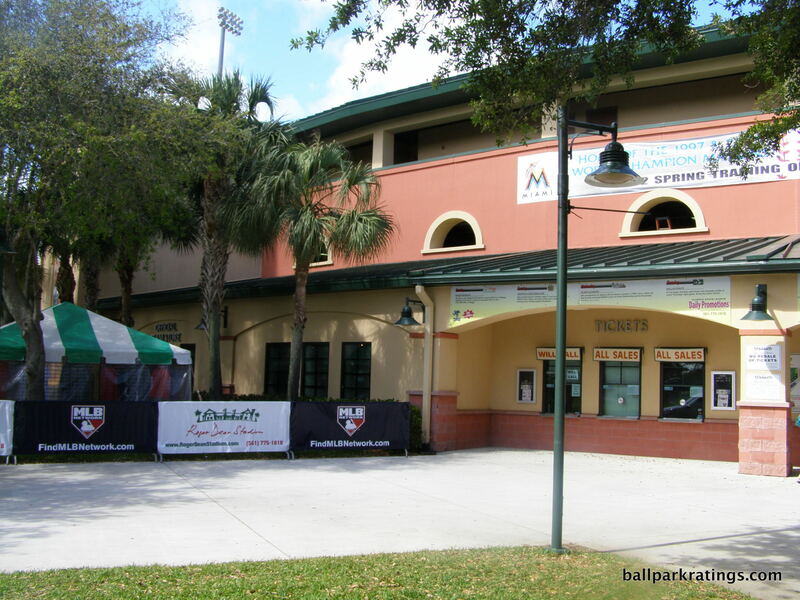 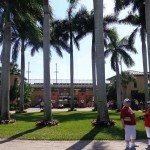 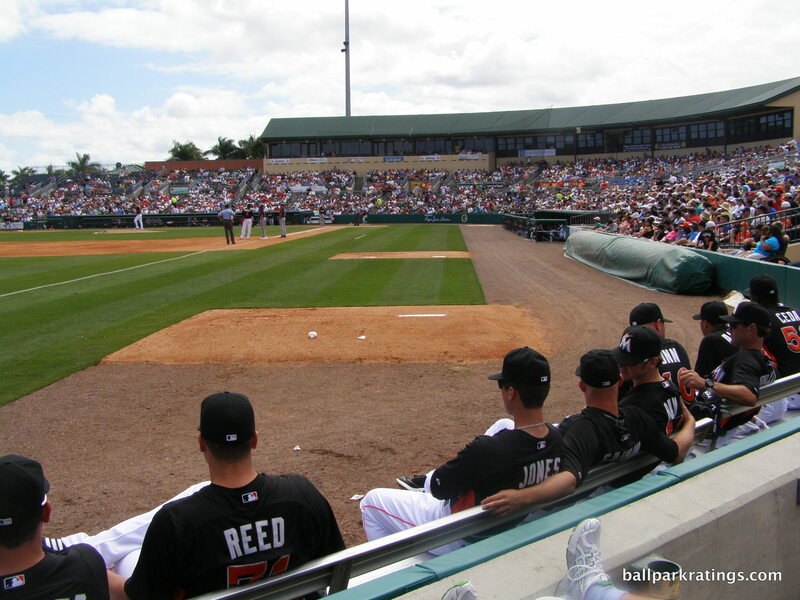 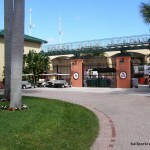 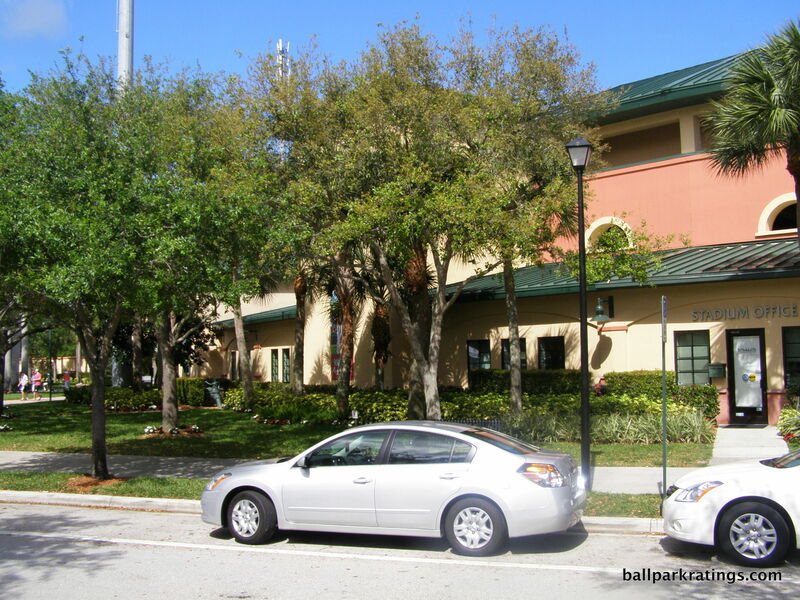 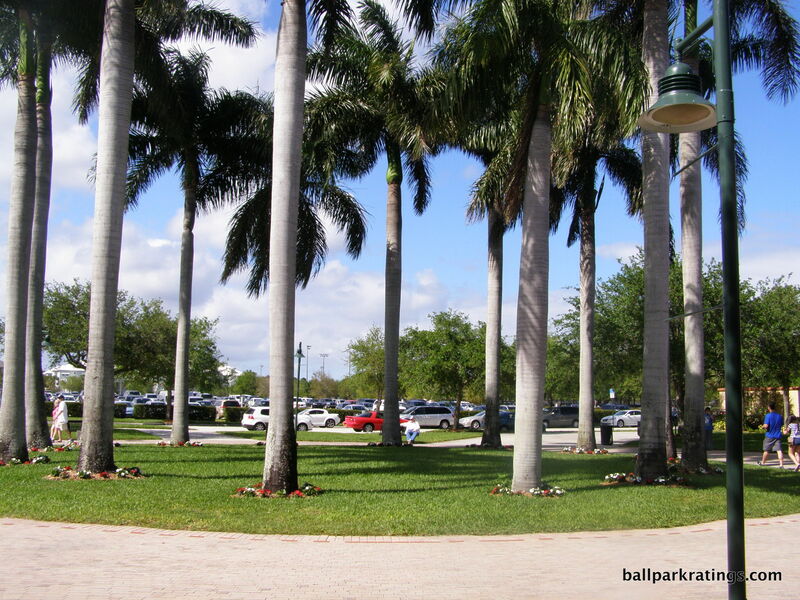 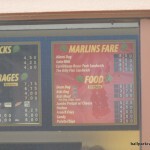 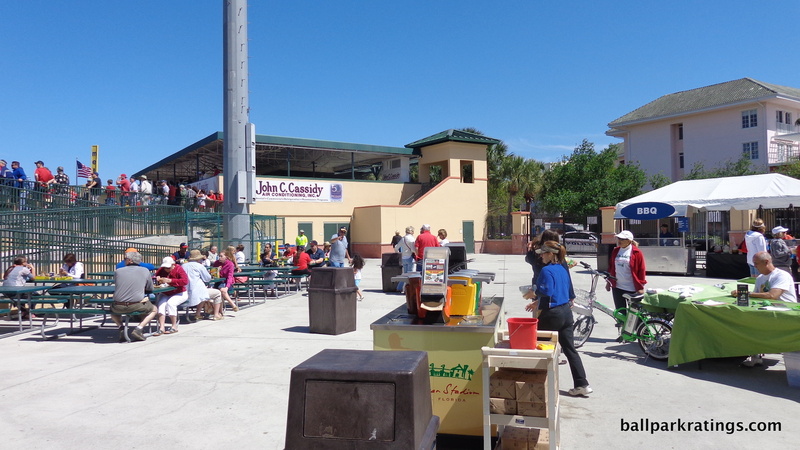 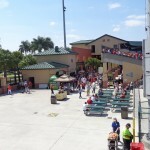 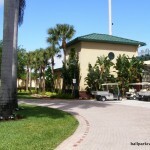 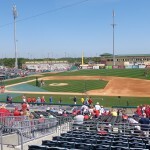 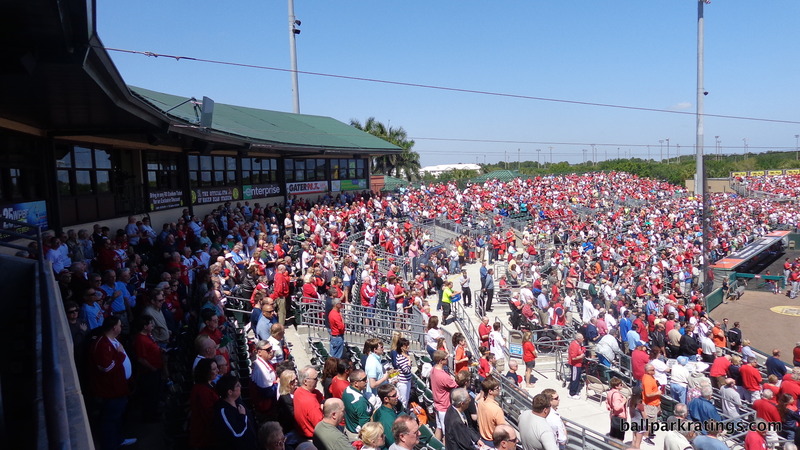 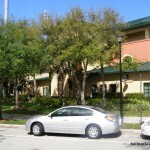 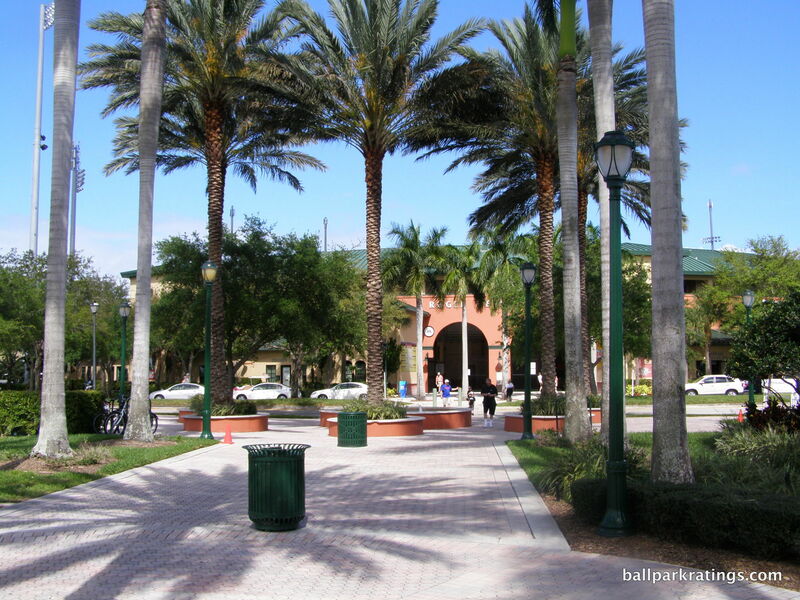 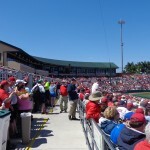 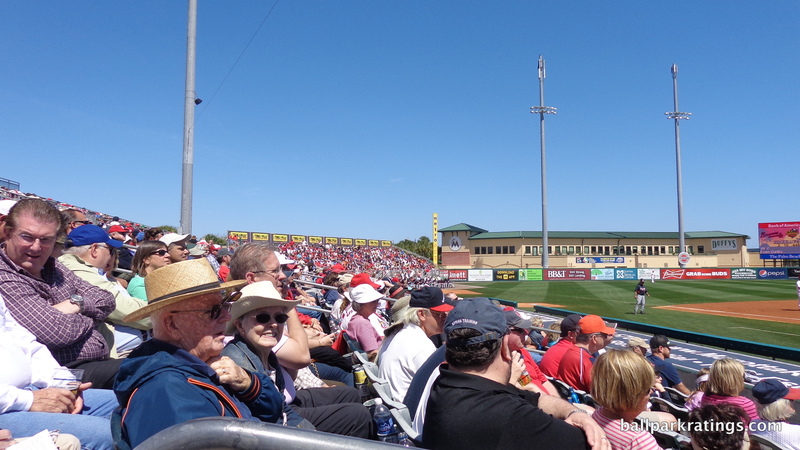 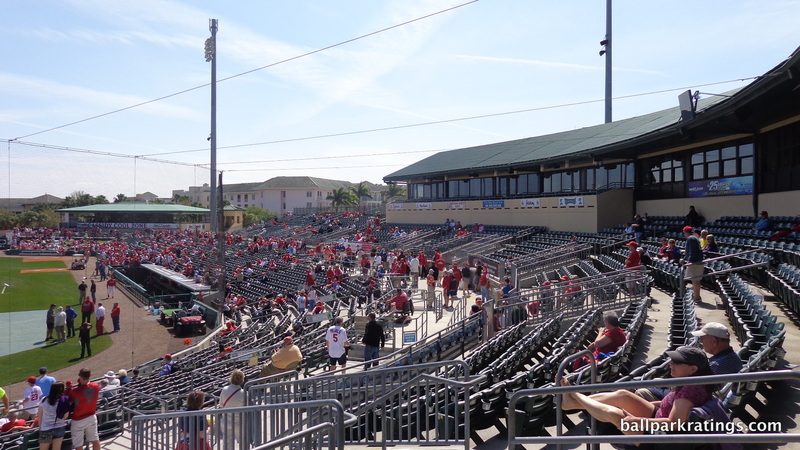 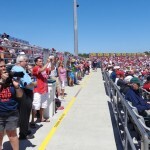 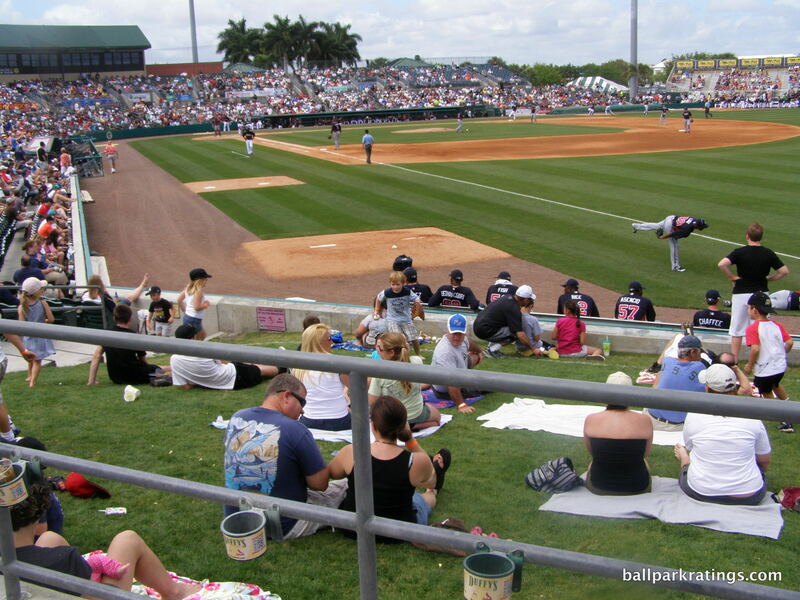 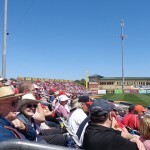 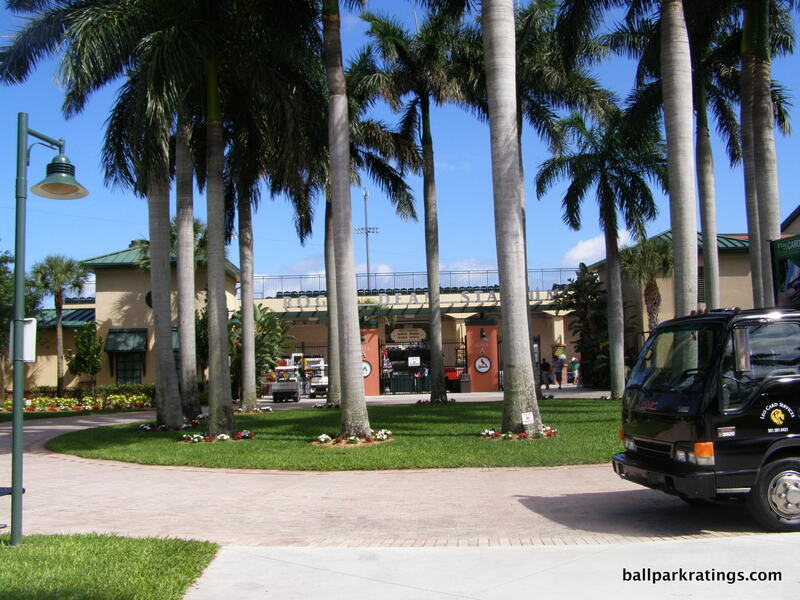 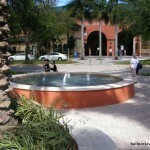 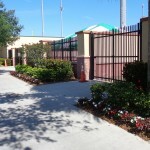 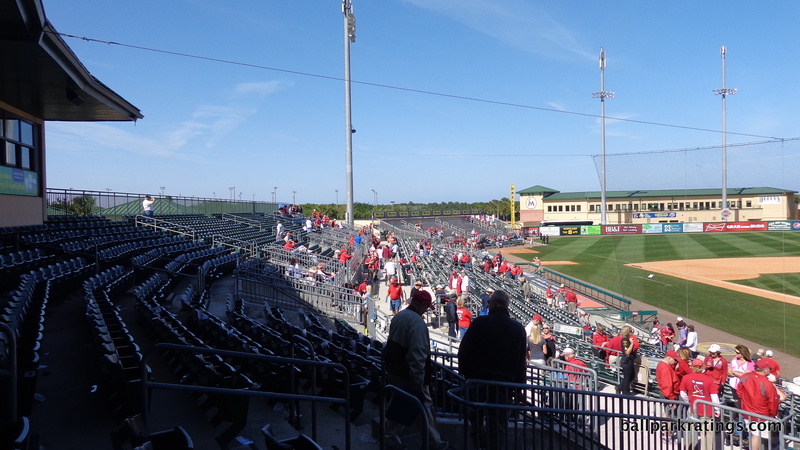 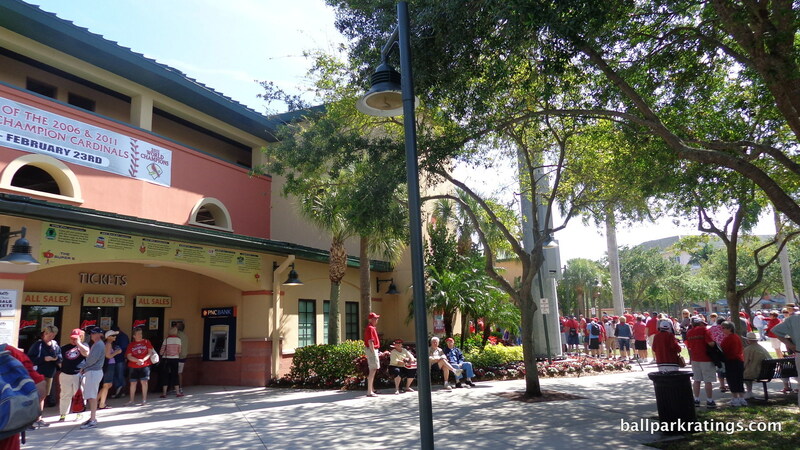 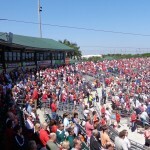 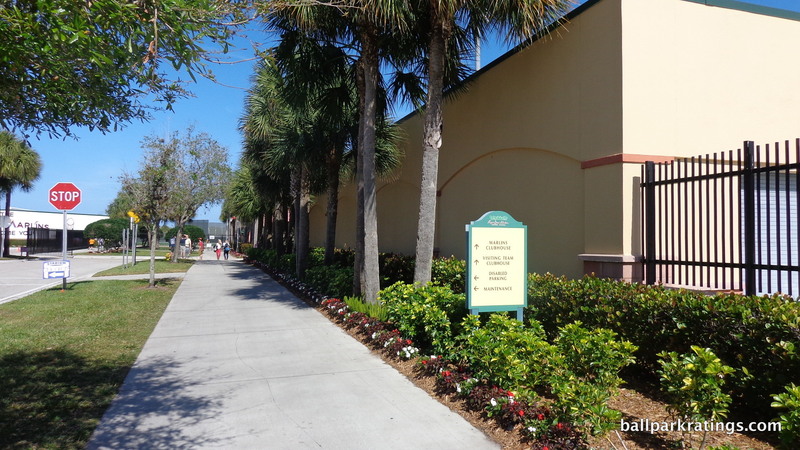 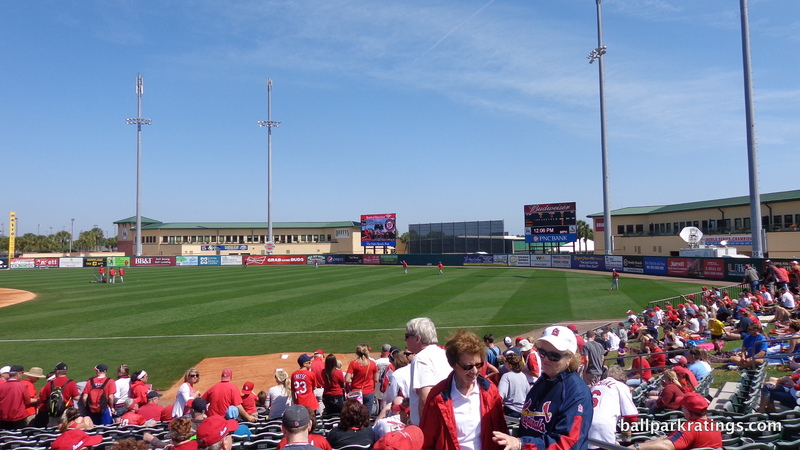 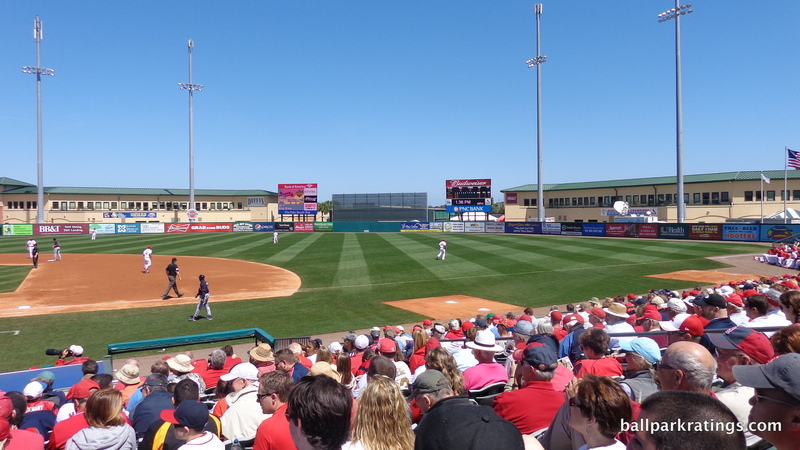 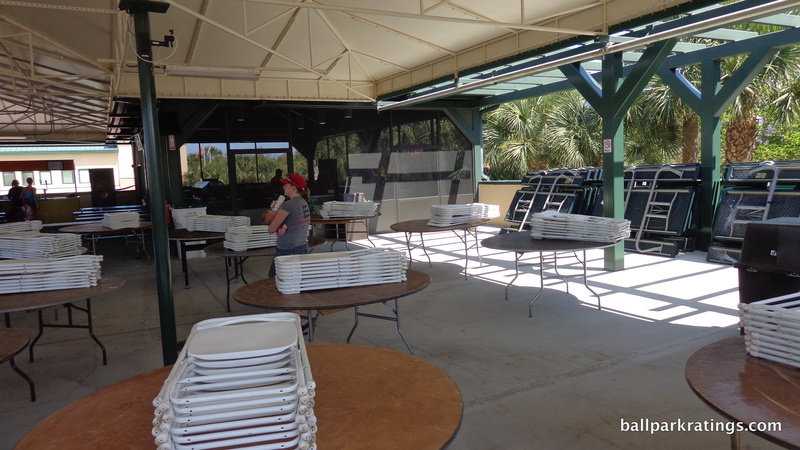 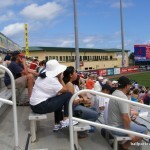 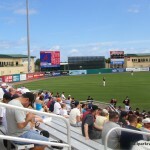 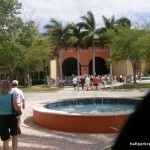 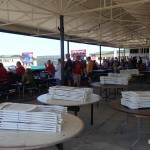 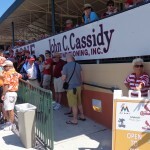 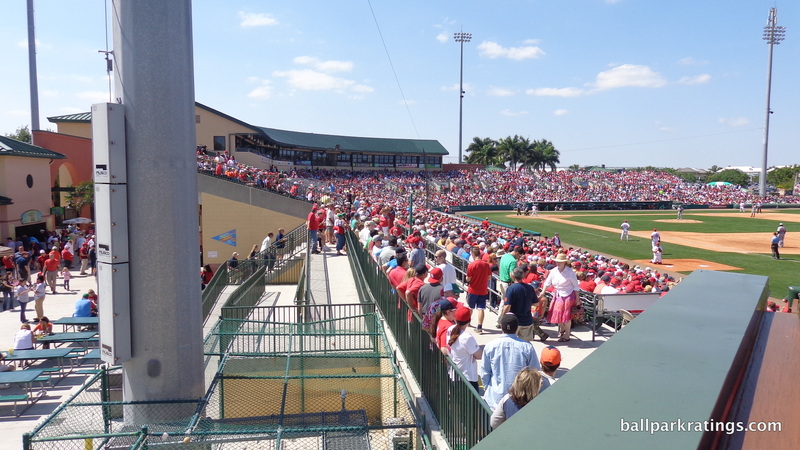 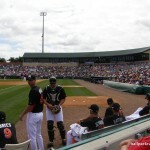 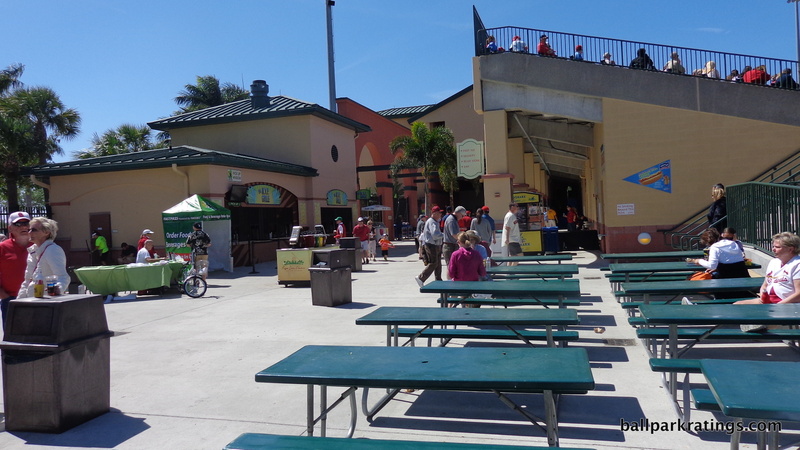 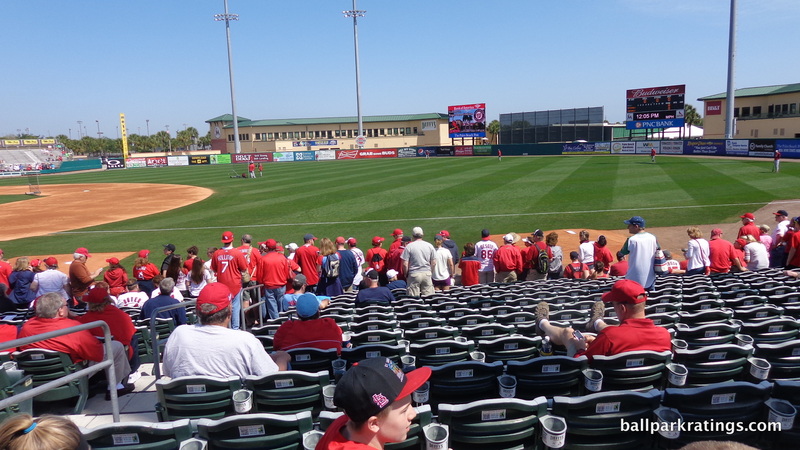 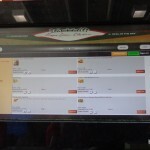 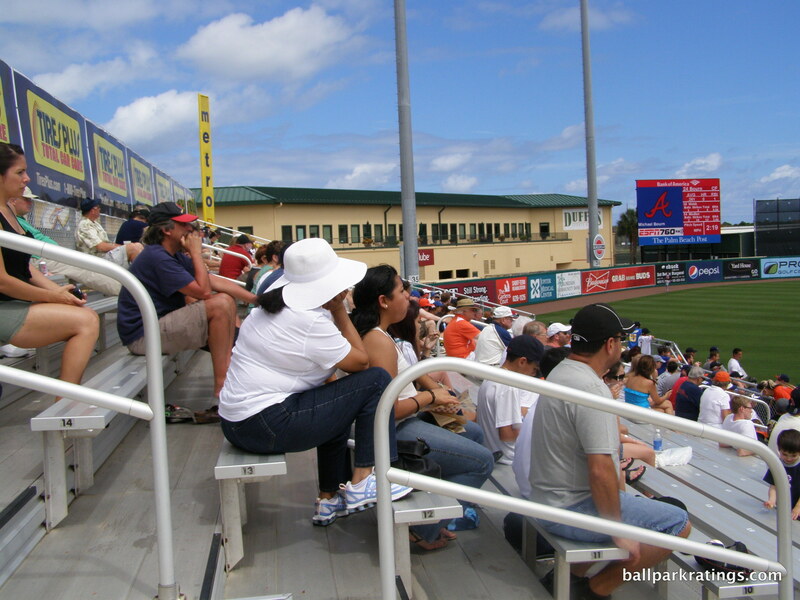 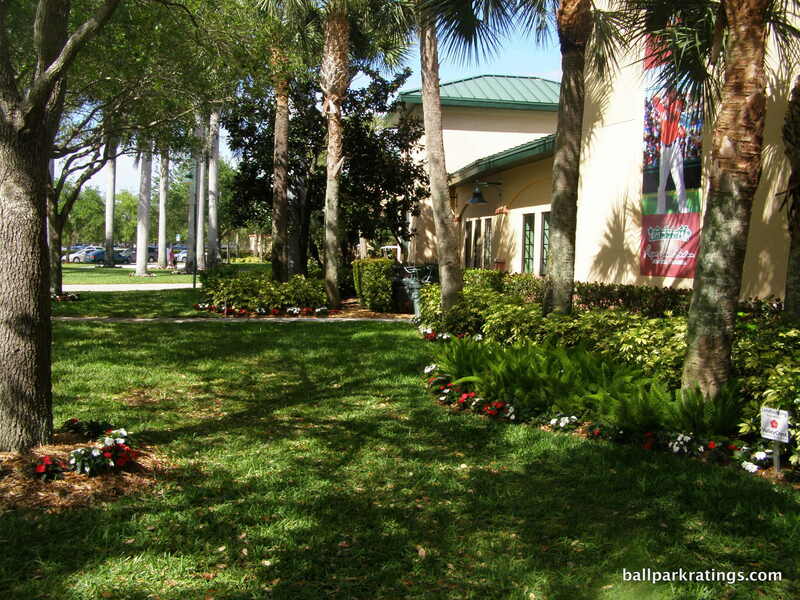 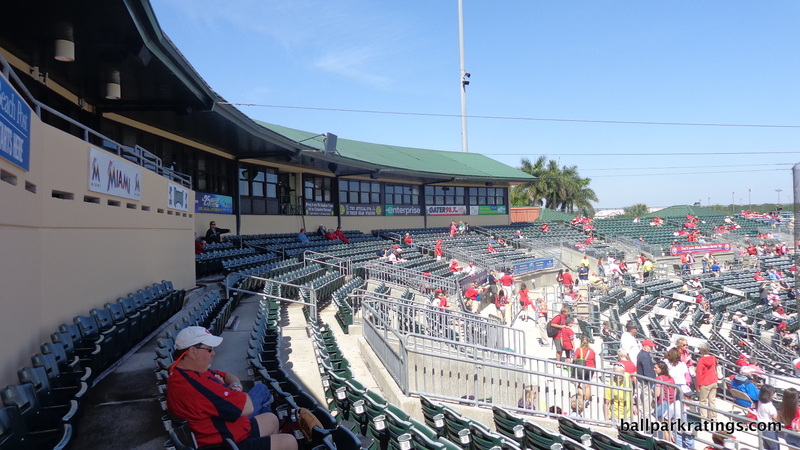 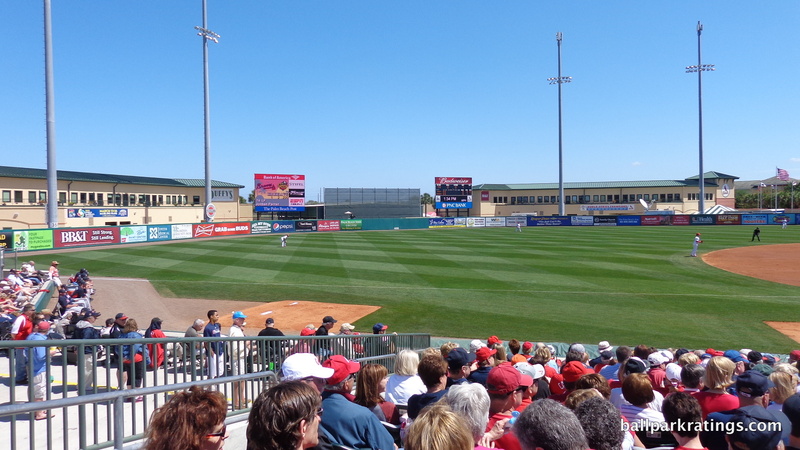 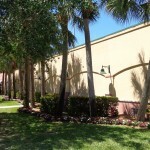 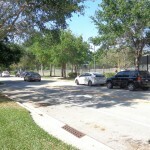 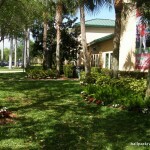 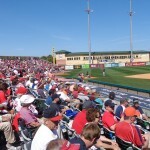 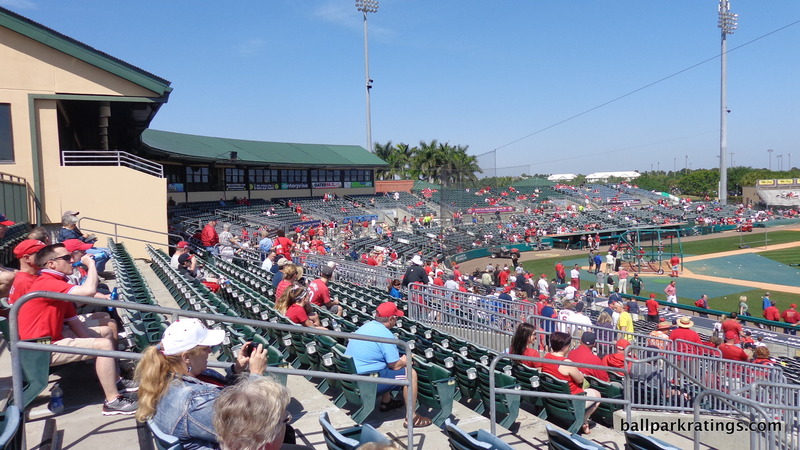 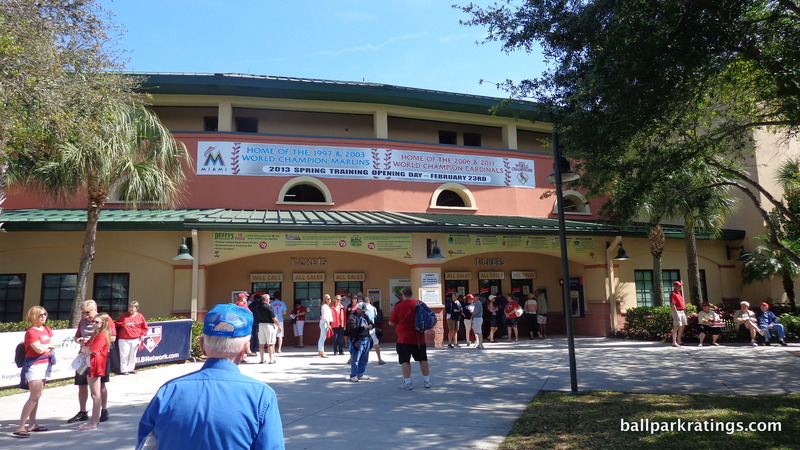 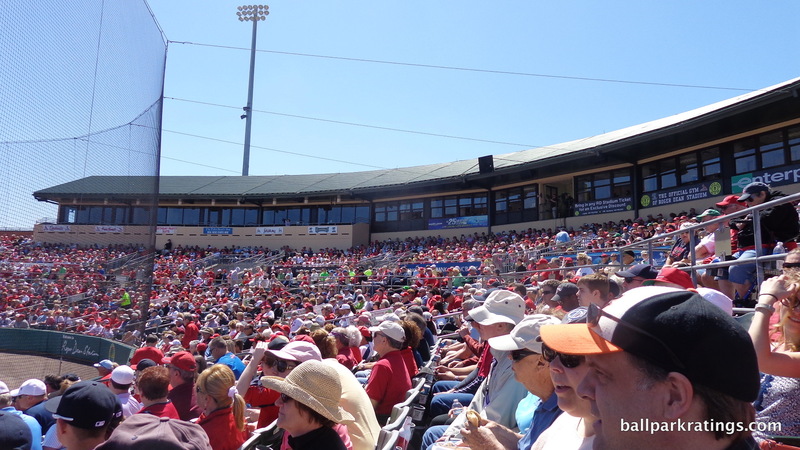 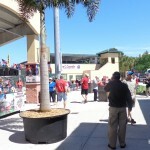 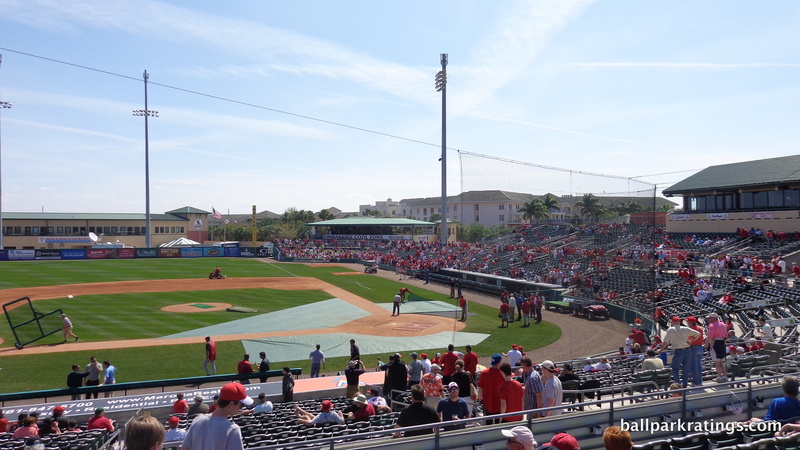 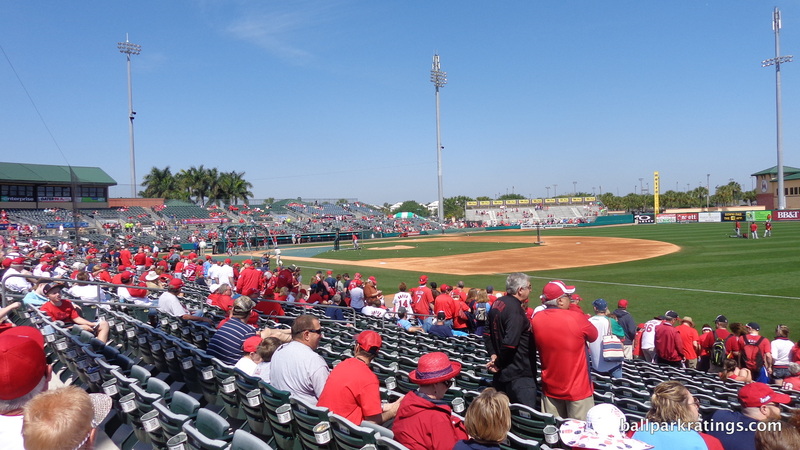 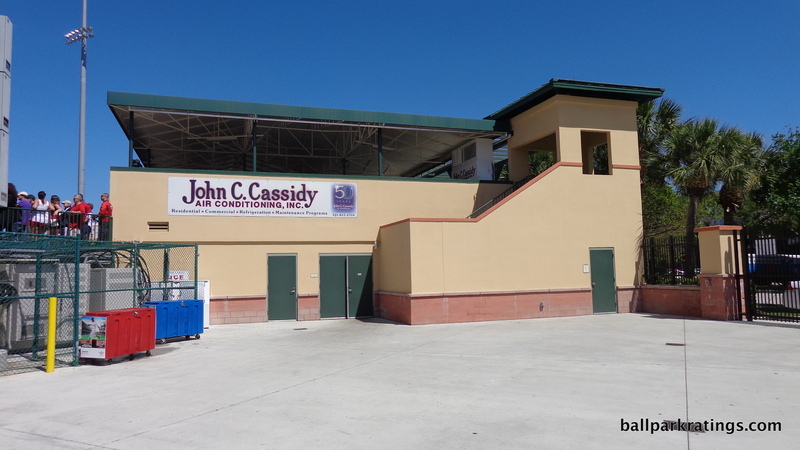 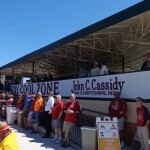 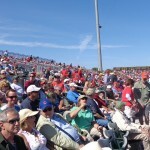 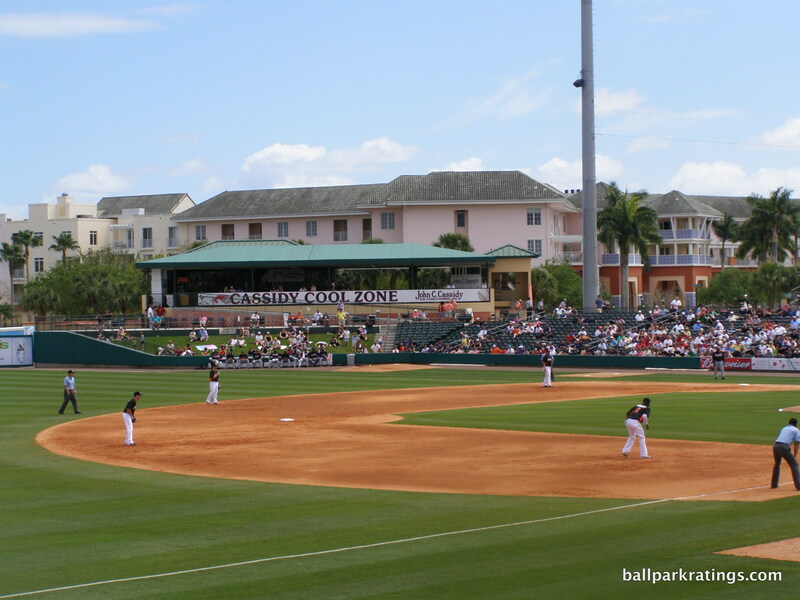 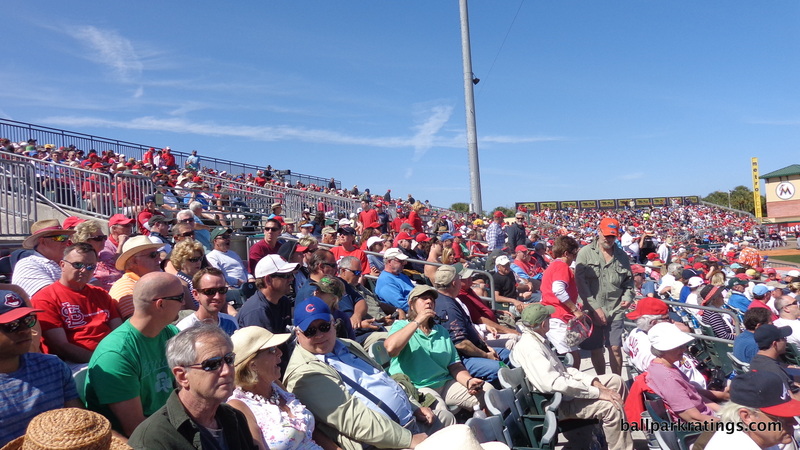 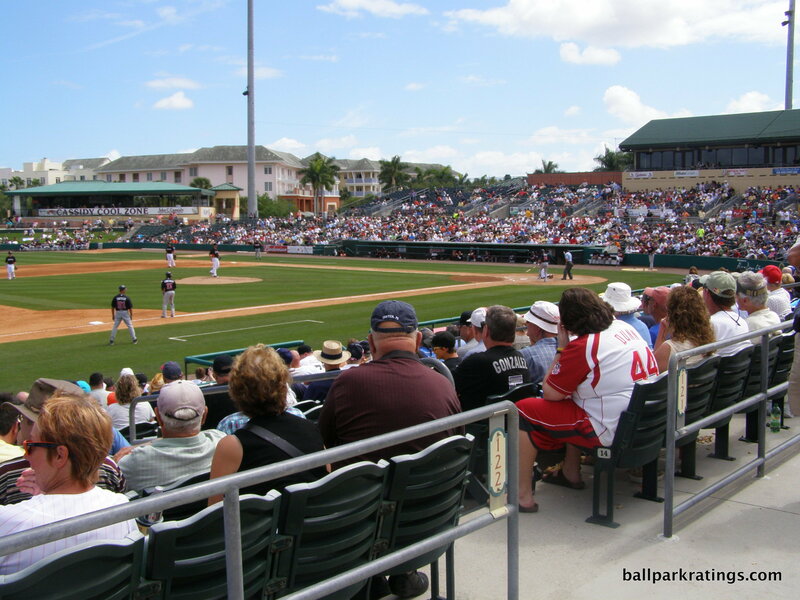 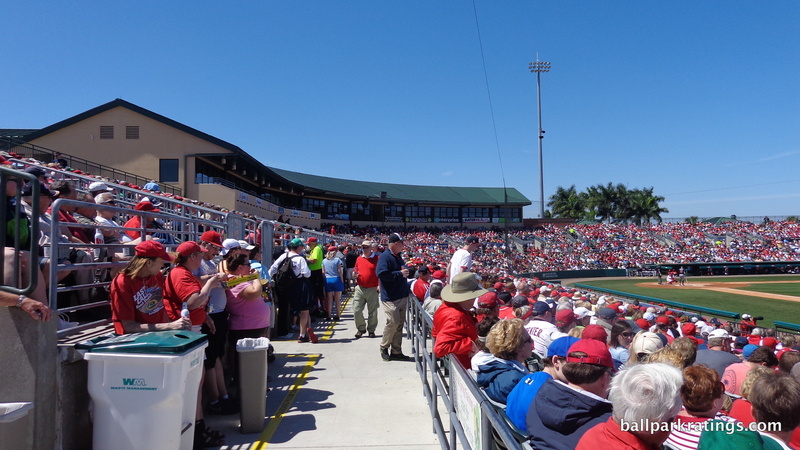 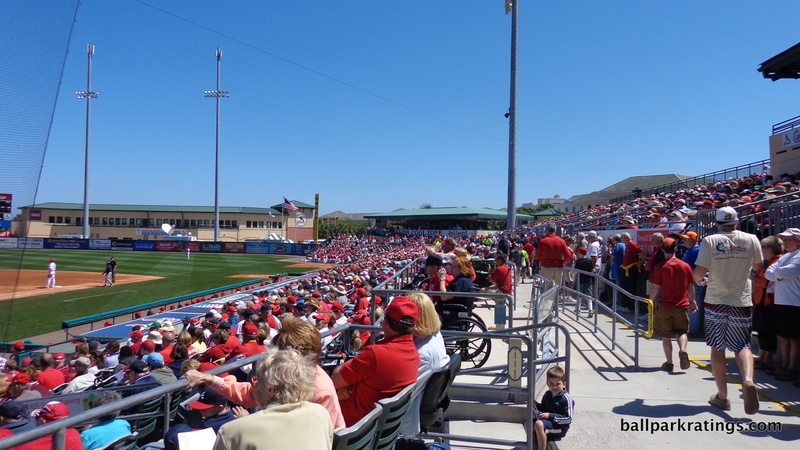 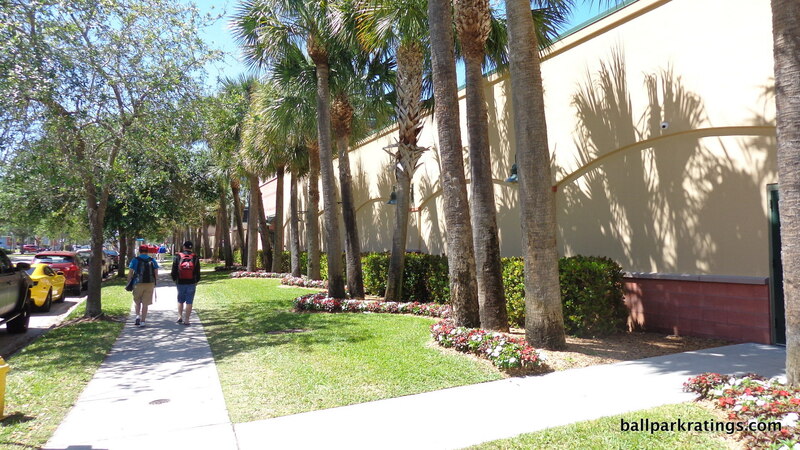 Most spring training ballparks are good these days, and Jupiter is no exception. 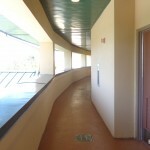 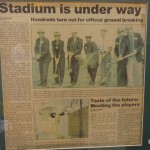 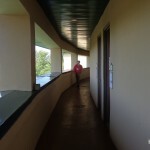 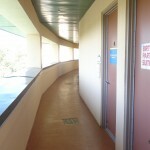 A significant renovation could return it to state-of-the-art status.